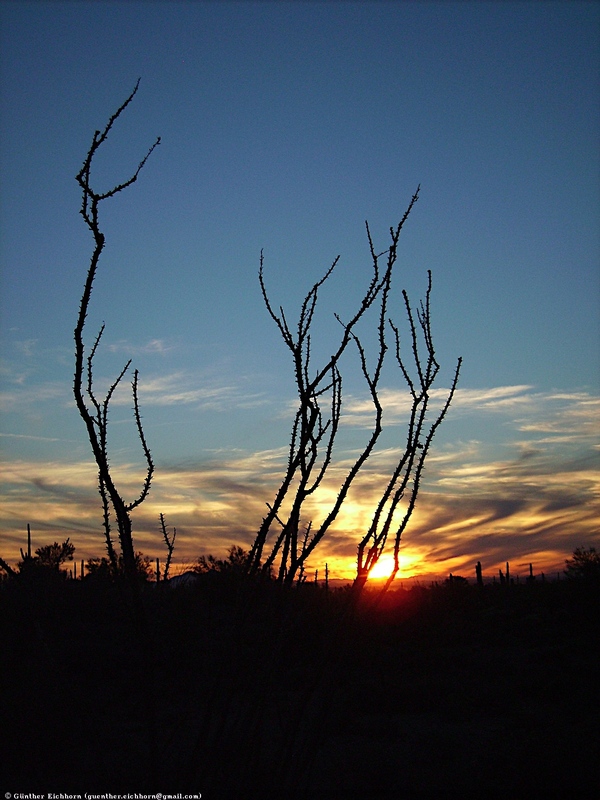 In 1989 - 1991 I lived in Tucson, AZ, working at the Steward Observatory at the University of Arizona. 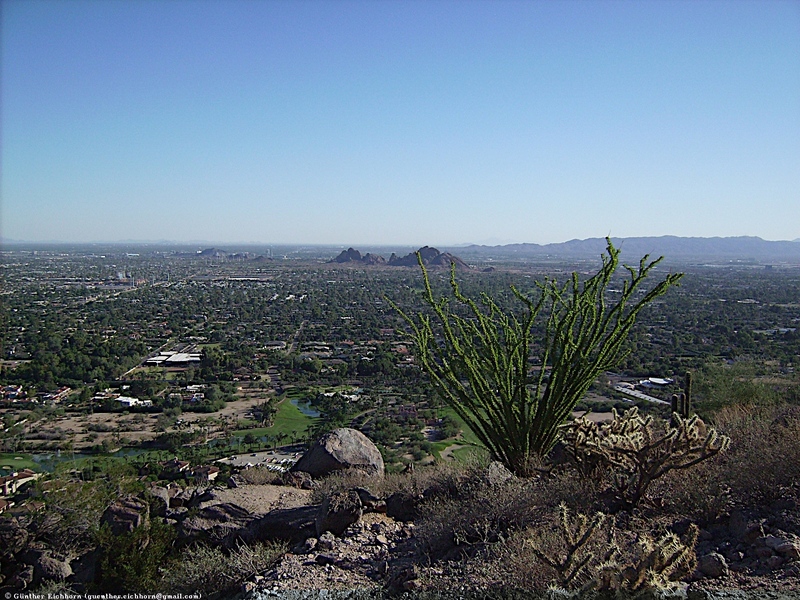 During those two years I learned to love the climate in Arizona. I like it hot . 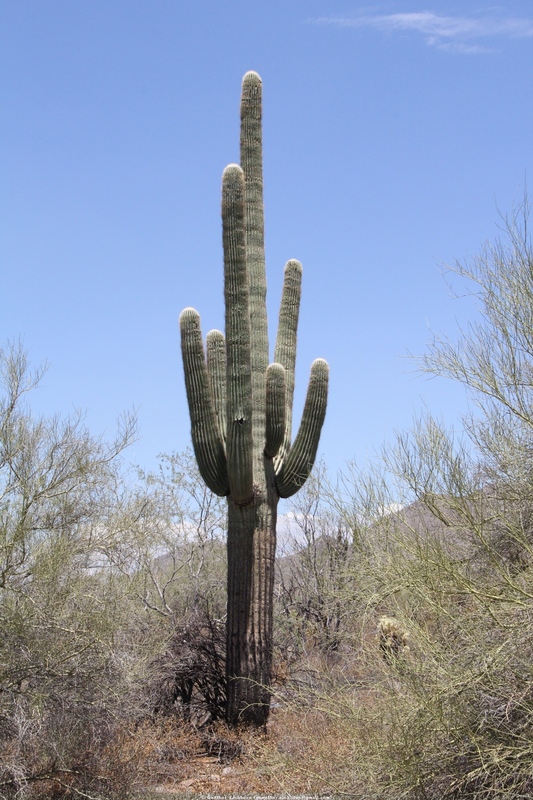 Unfortunately, my job brought me back to the east coast for 20 years. 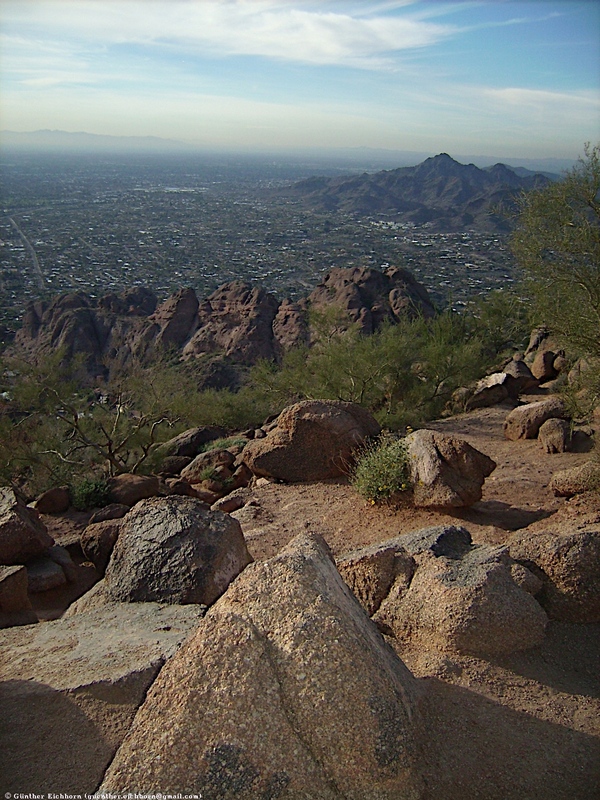 In 2011 I finally managed the opportunity to move to Arizona again. 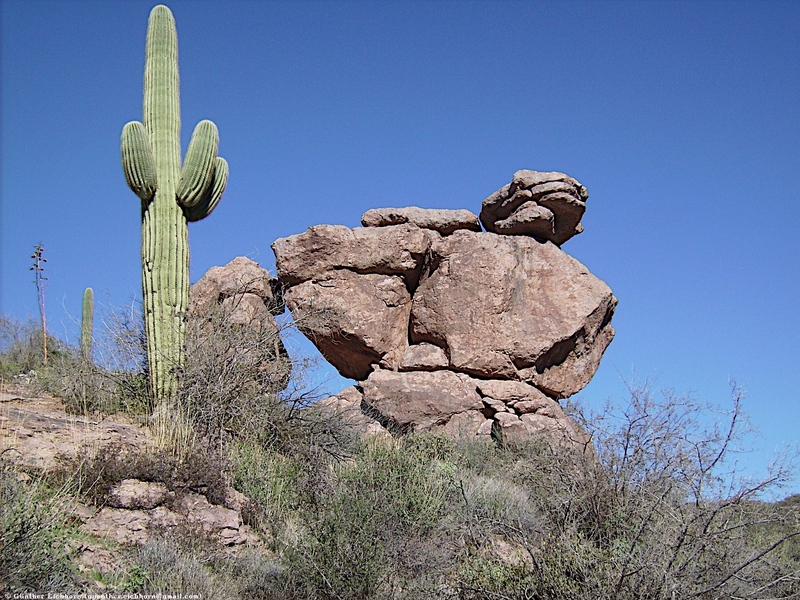 Arizona is a very scenic state, at least I think so, since I love deserts. 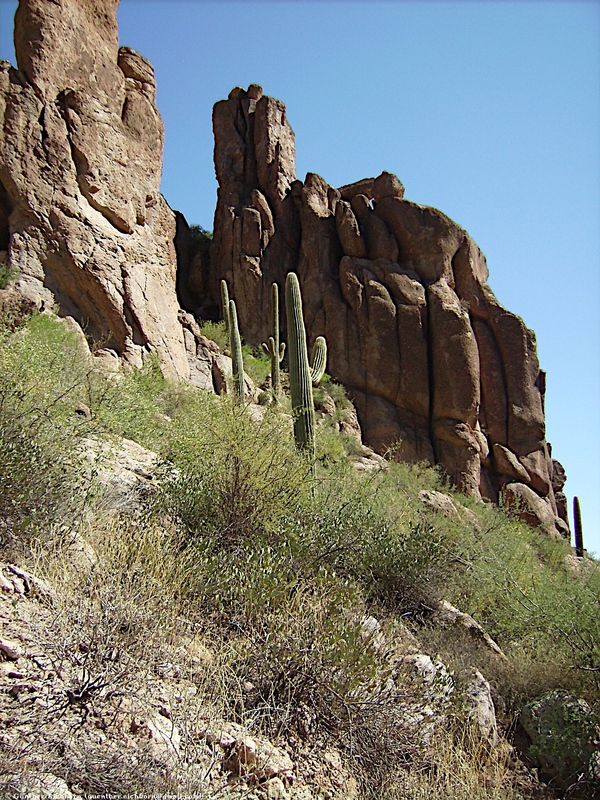 Following are some pictures from various areas in Arizona. 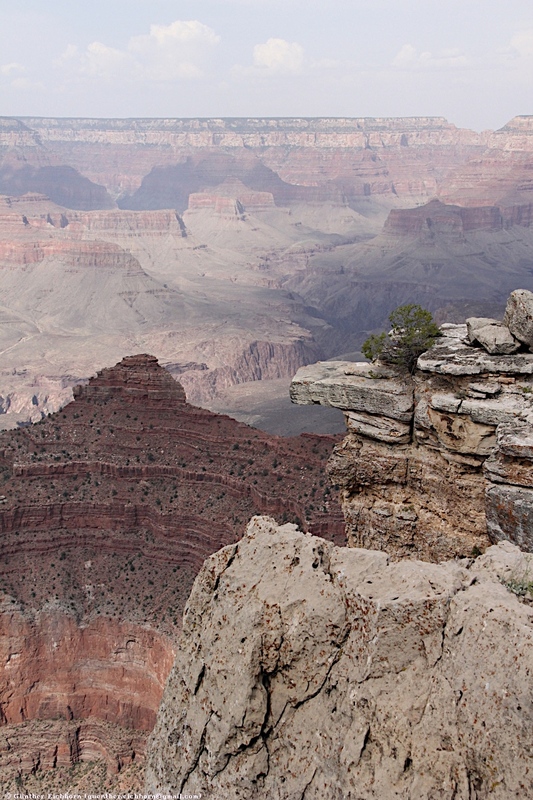 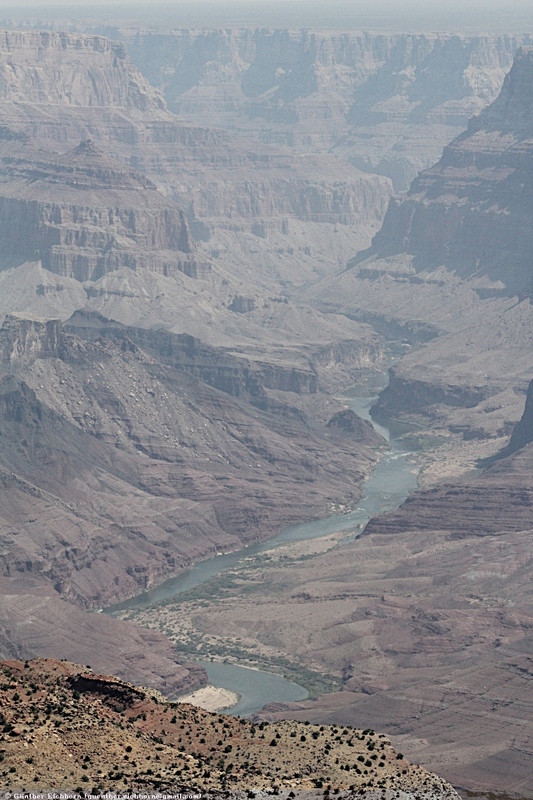 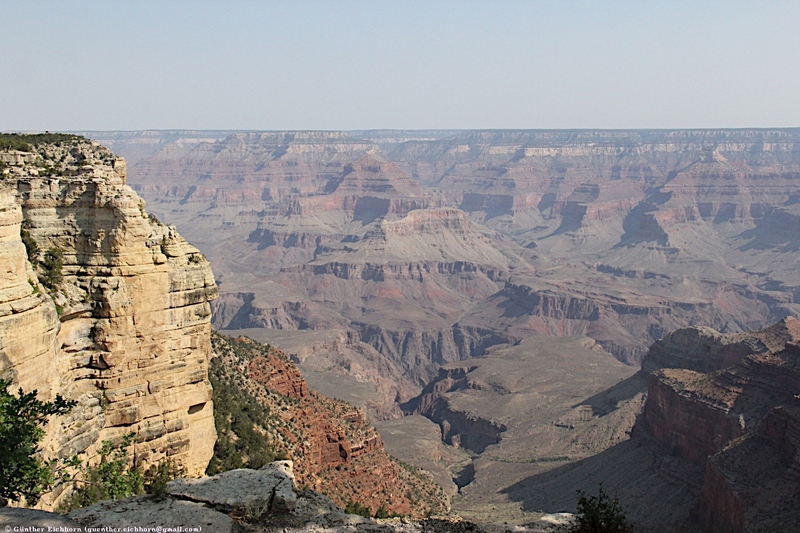 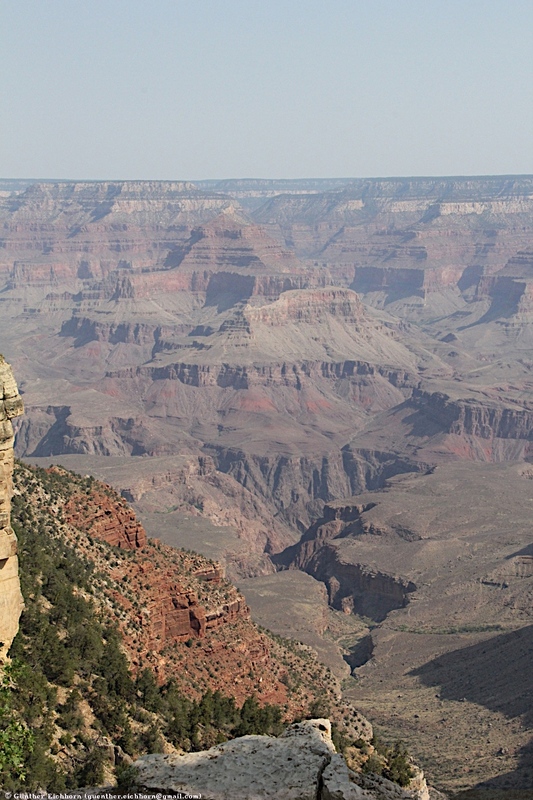 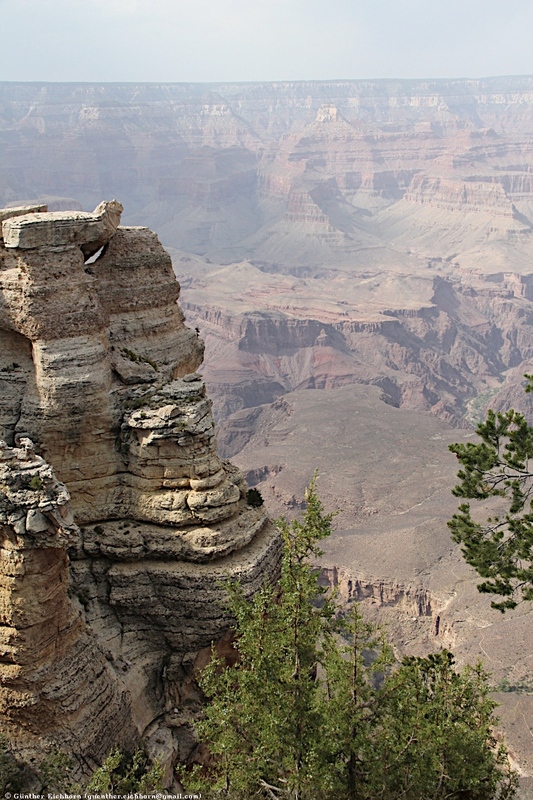 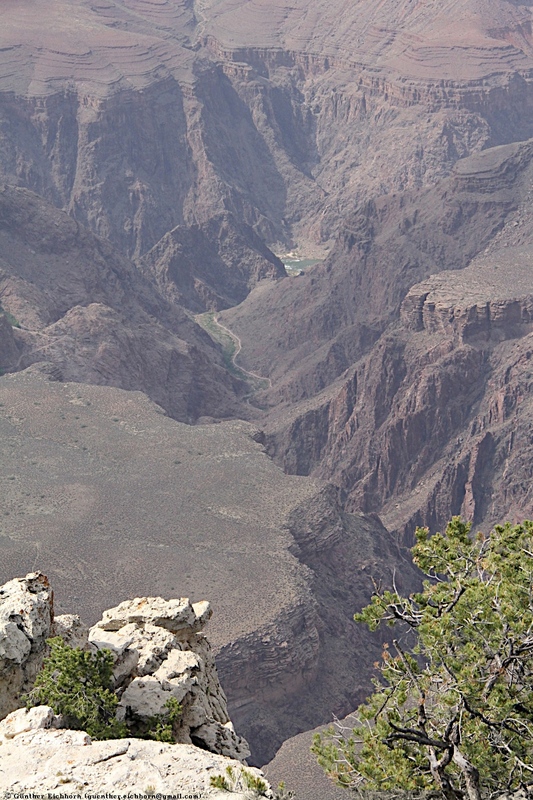 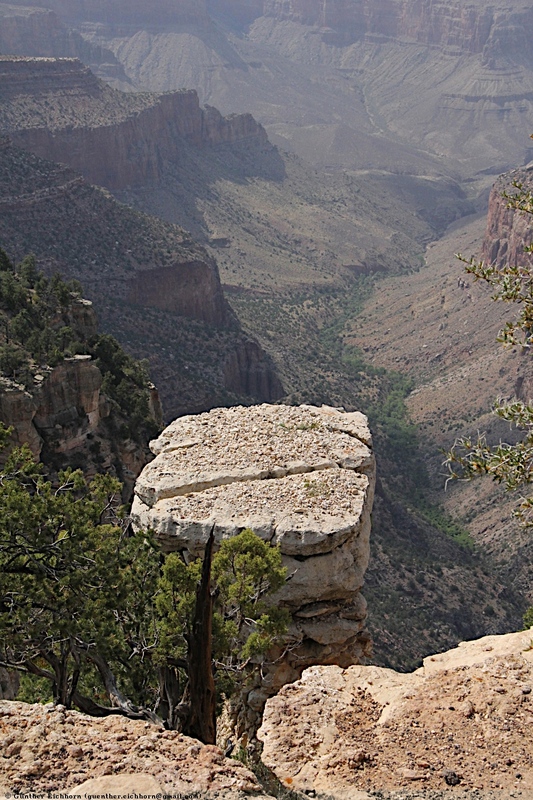 The Grand Canyon is a steep-sided canyon carved by the Colorado River in Arizona, United States. 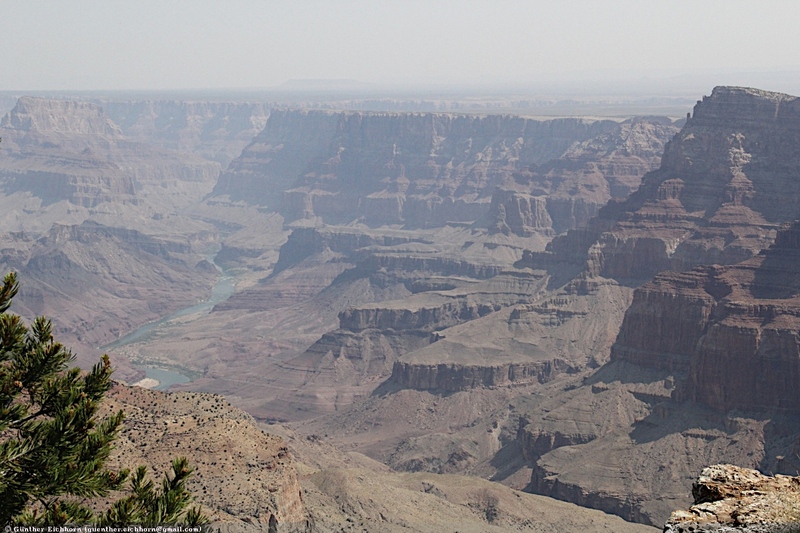 The Grand Canyon is 446 km (277 miles) long, up to 29 km (18 miles) wide and attains a depth of 1,857 m (6,093 ft) (over a mile). 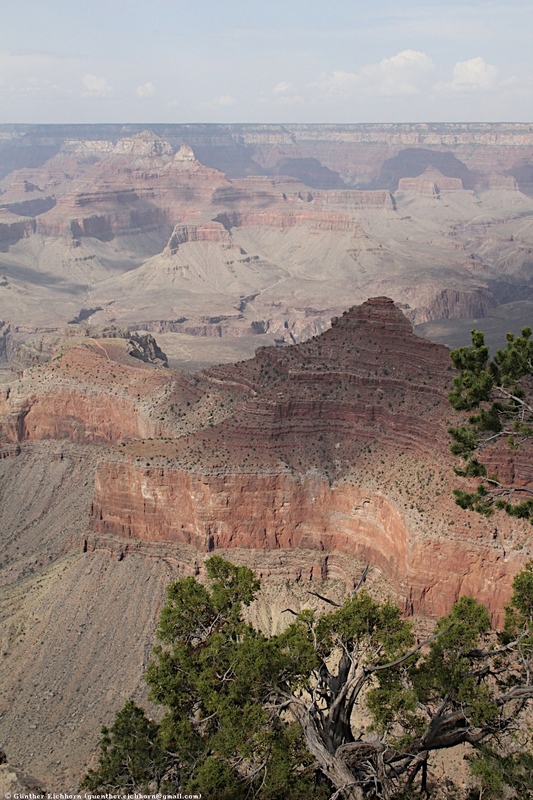 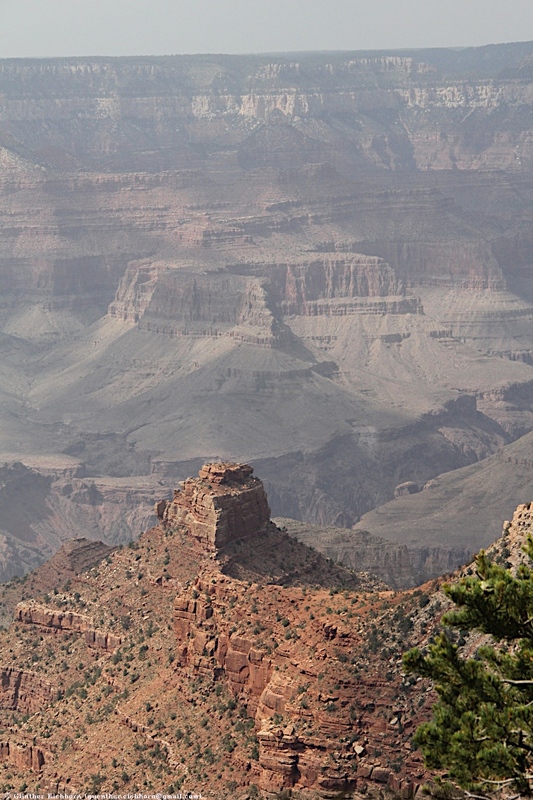 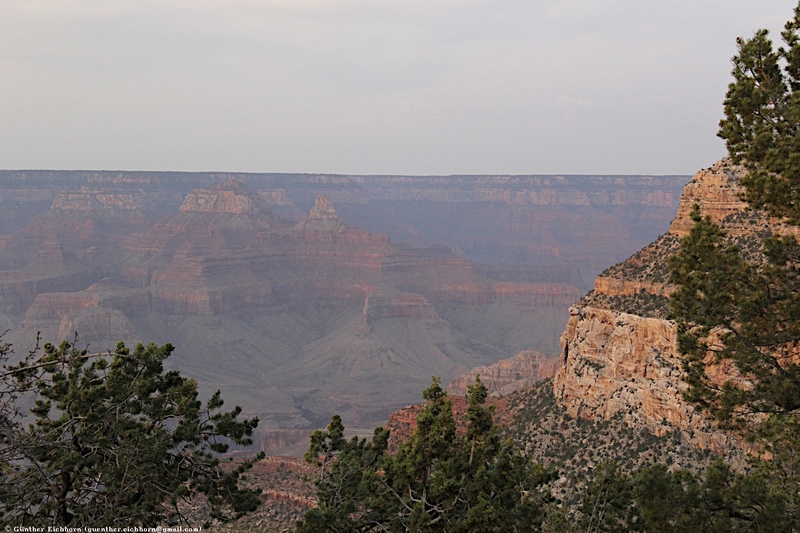 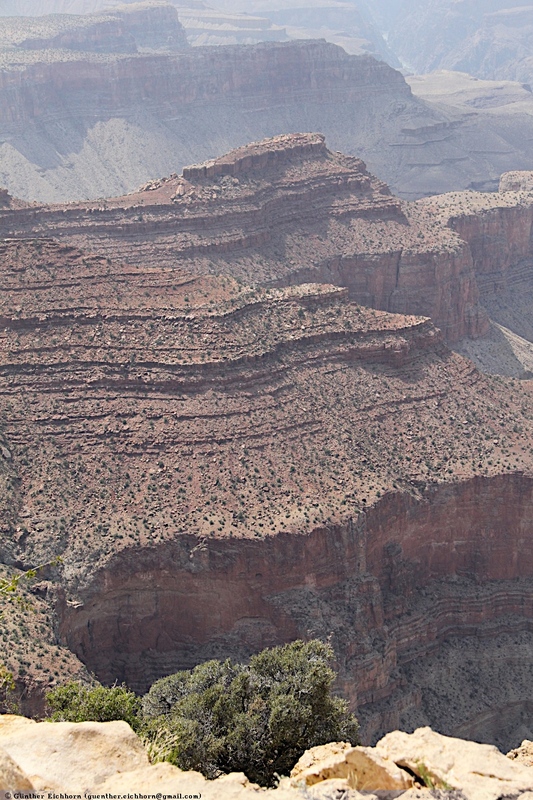 Grand Canyon National Park is a UNESCO World Heritage Site. 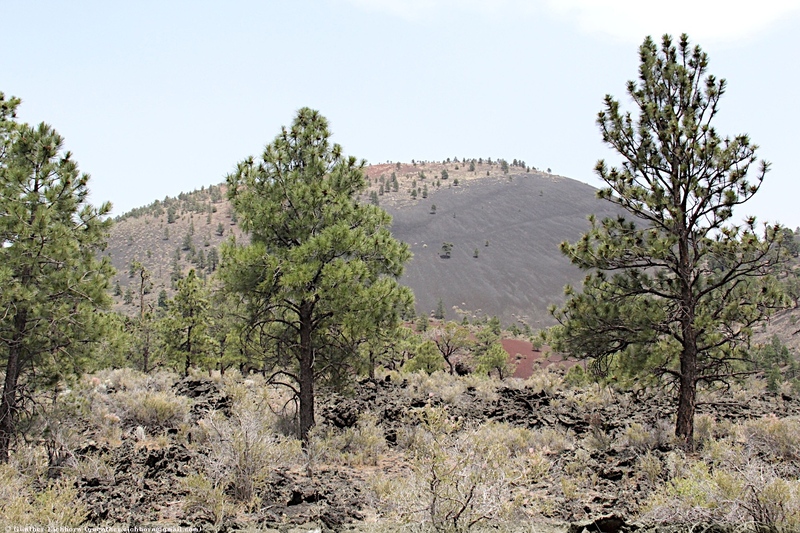 Sunset Crater is a cinder cone located north of Flagstaff in U.S. State of Arizona. 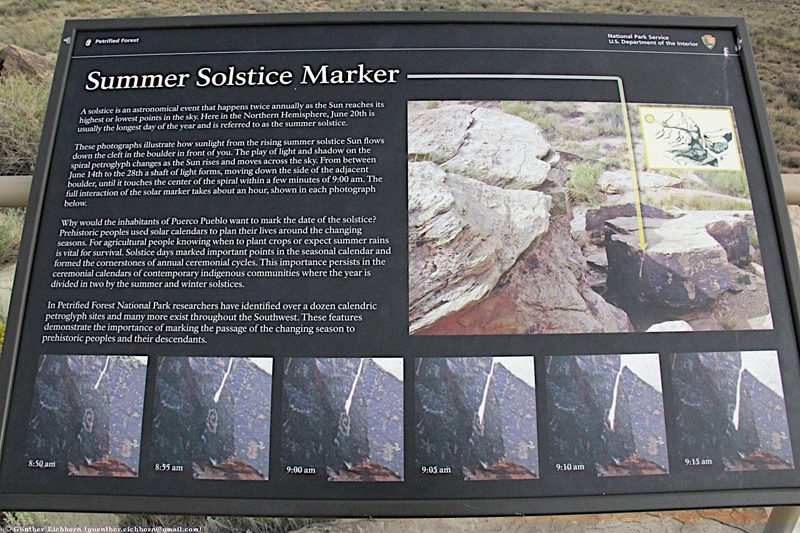 The crater is within the Sunset Crater Volcano National Monument. 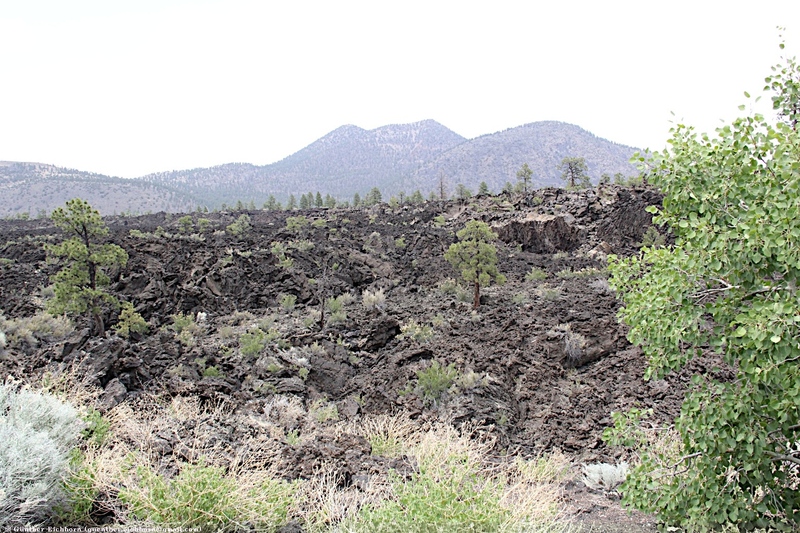 Sunset Crater is the youngest in a string of volcanoes (the San Francisco volcanic field) that is related to the nearby San Francisco Peaks. 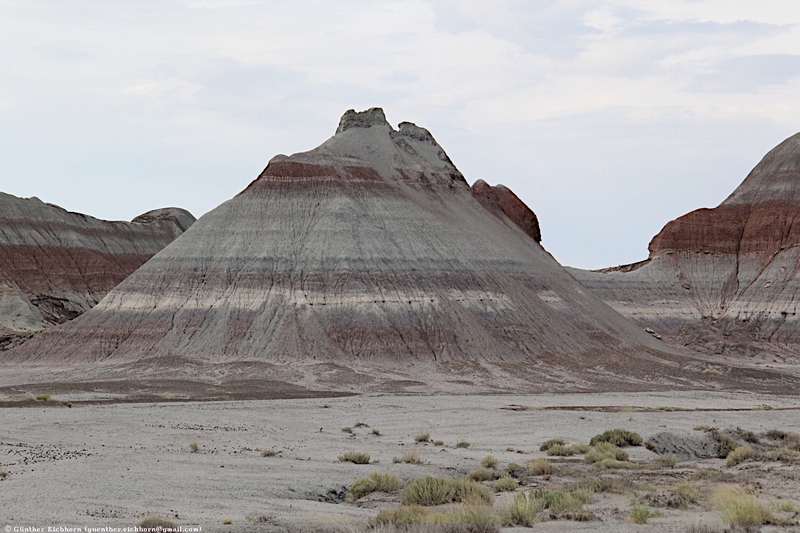 The date of the eruptions that formed the 340 m (1,120 ft) high cone was initially derived from tree-ring dates, suggesting the eruption began between the growing seasons of A.D. 1064–1065. 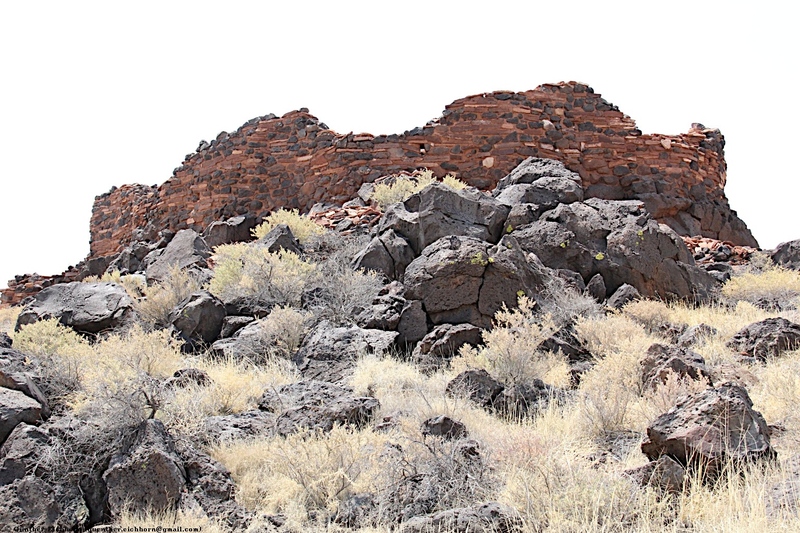 However, more recent geologic and archaeological evidence places the eruption around A.D. 1085. 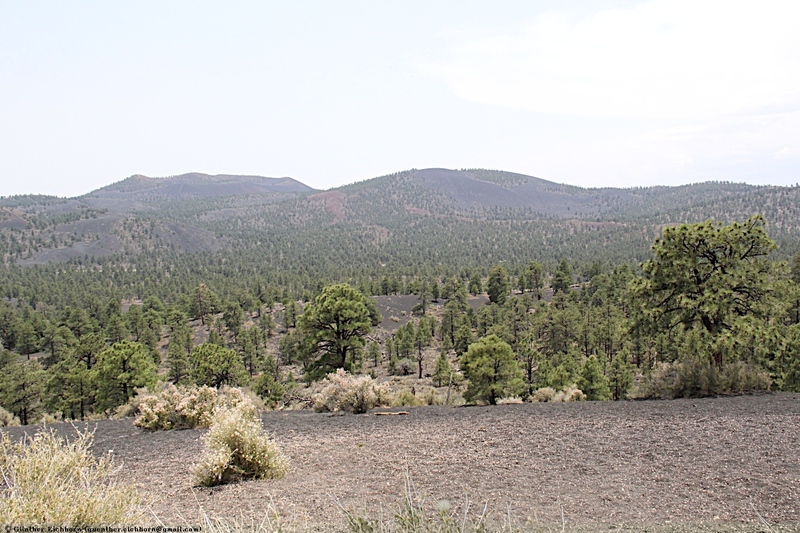 The largest vent of the eruption, Sunset Crater itself, was the source of the Bonito and Kana-a lava flows that extended about 2.5 km (1.6 miles) NW and 9.6 km (6.0 miles) NE, respectively. 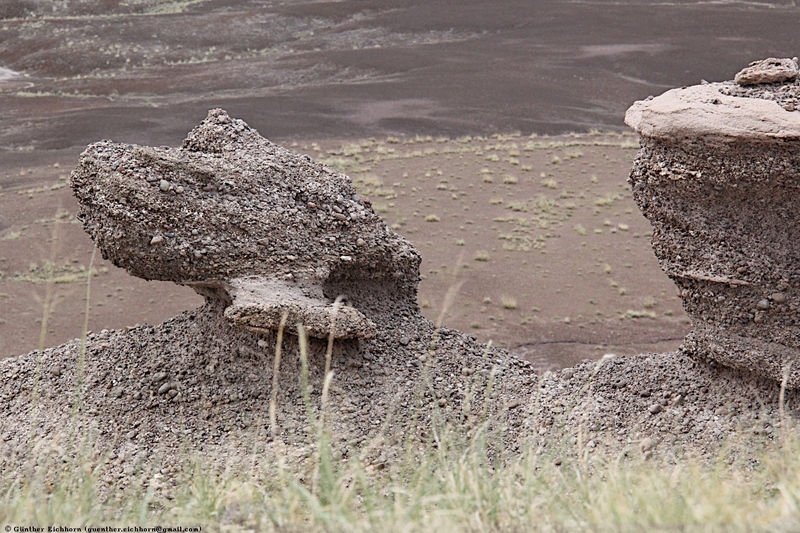 Additional vents along a 10 km (6 miles) long fissure extending SE produced small spatter ramparts and a 6.4 km (4.0 miles) long lava flow to the east. 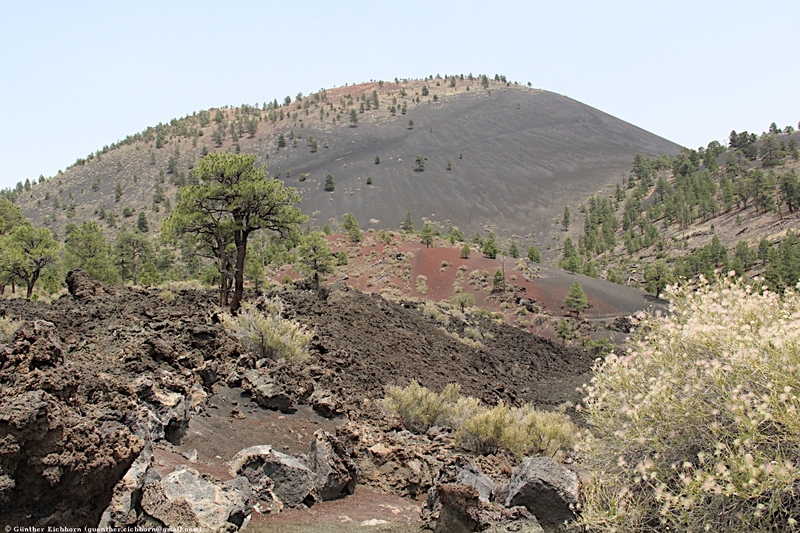 The Sunset Crater eruption produced a blanket of ash and lapilli covering an area of more than 2,100 km² (810 square miles) and forced the temporary abandonment of settlements of the local Sinagua people. 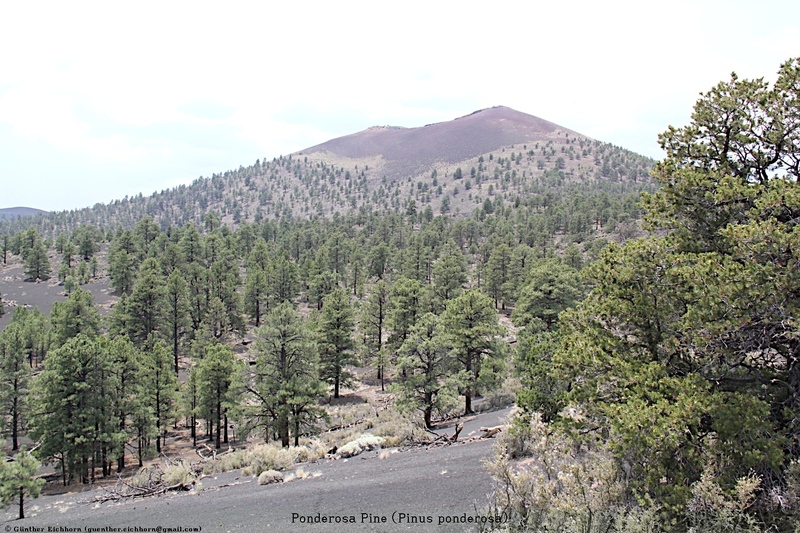 The volcano has partially re-vegetated, with pines and wildflowers. 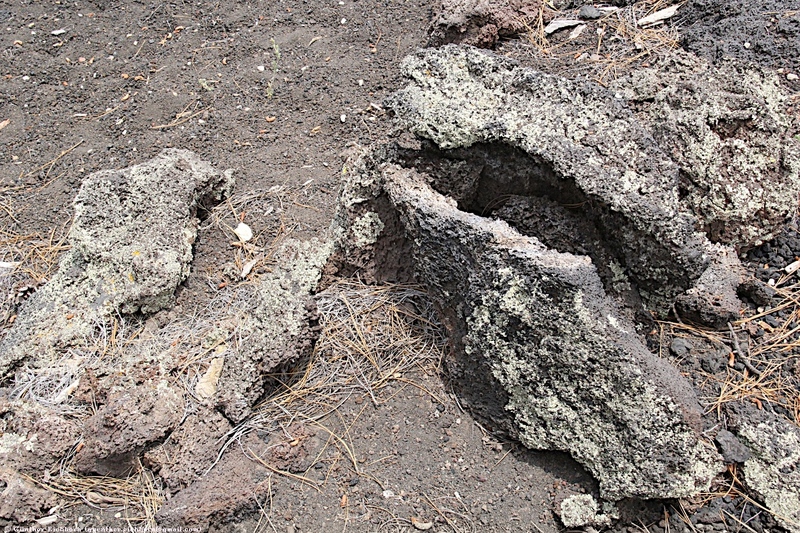 The crater is the namesake for the Sunset Crater Beardtongue (Penstemon clutei), an endemic flower. 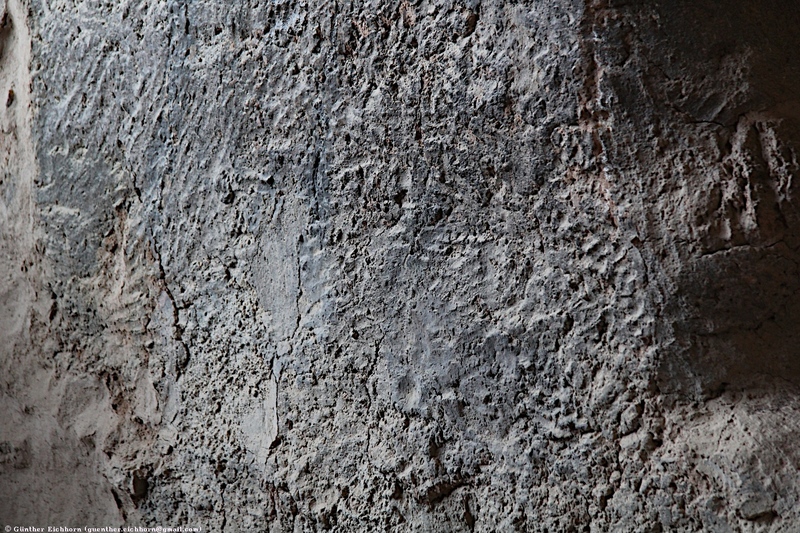 Since the last eruption of the volcano is a recent occurrence, it is considered dormant by volcanologists. 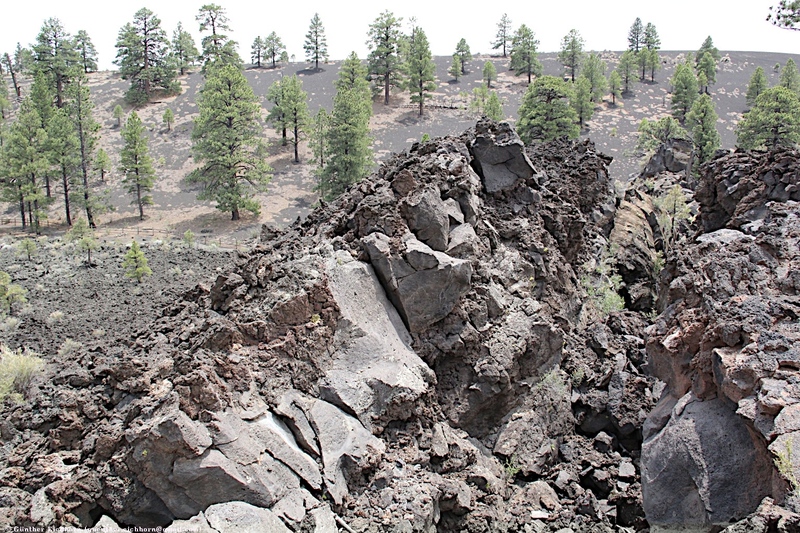 The significance of Sunset Crater Volcano National Monument extends beyond the geological events themselves. 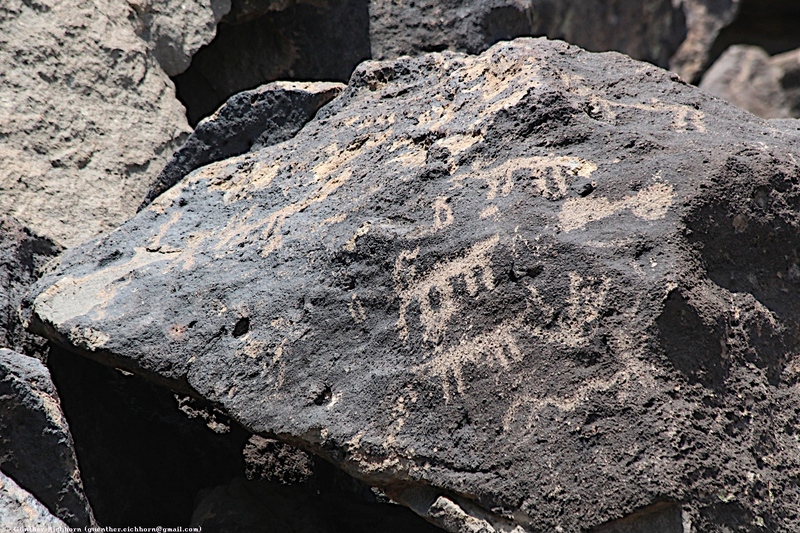 The powerful geologic processes that formed the volcano profoundly affected the way of life of local inhabitants during the 11th and 12th centuries and forever changed both the landscape and the ecology of the area. 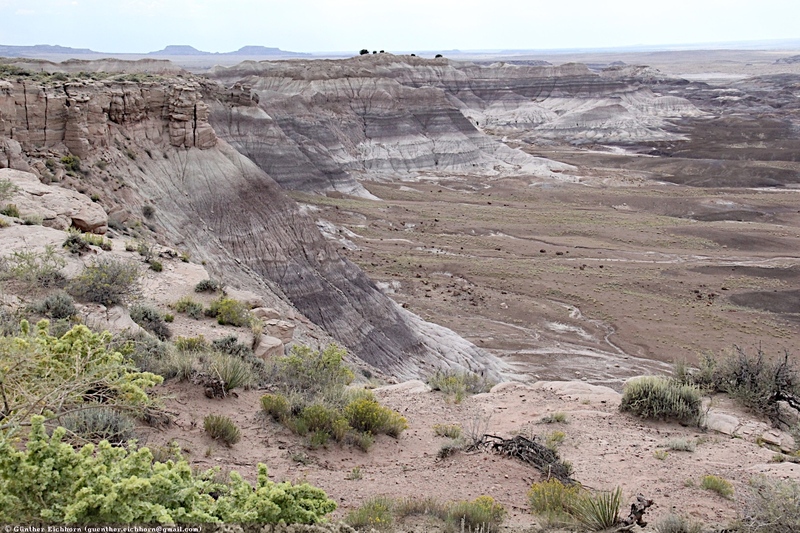 This volcano and its relatively undeveloped landscape provide an unparalleled opportunity to study plant succession and ecological change in an arid volcanic landscape. 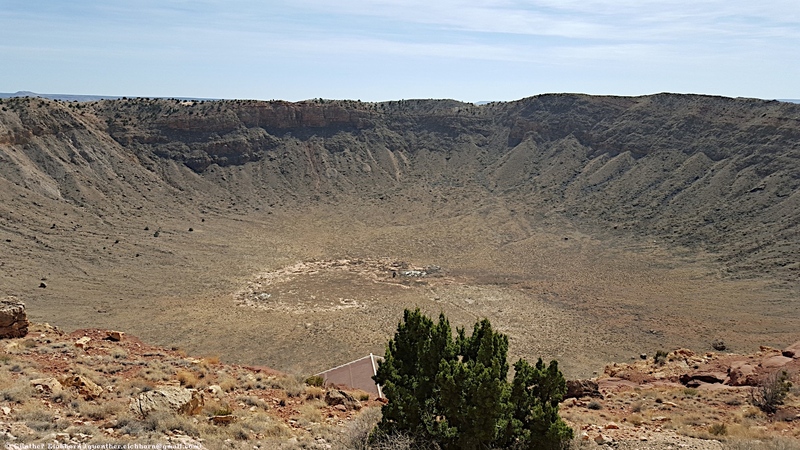 Meteor Crater is a meteorite impact crater approximately 60 km (37 miles) east of Flagstaff and 29 km (18 miles) west of Winslow in the northern Arizona desert of the United States. 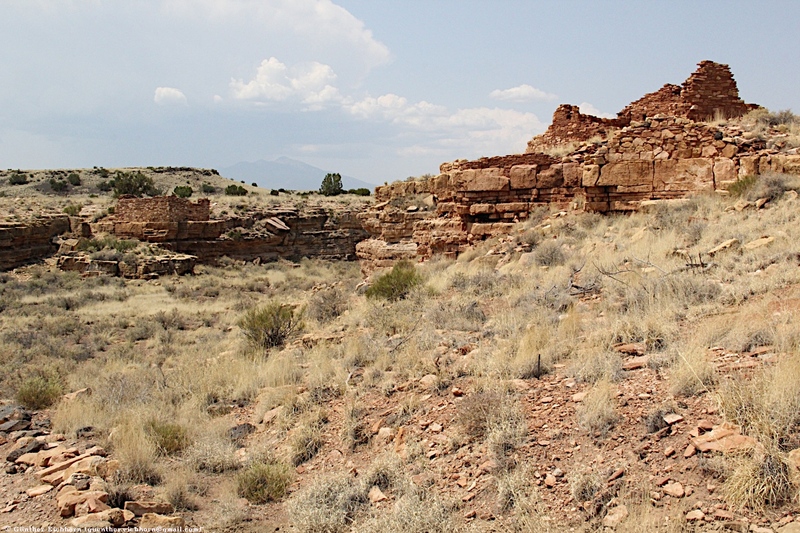 Because the United States Board on Geographic Names commonly recognizes names of natural features derived from the nearest post office, the feature acquired the name of "Meteor Crater" from the nearby post office named Meteor. 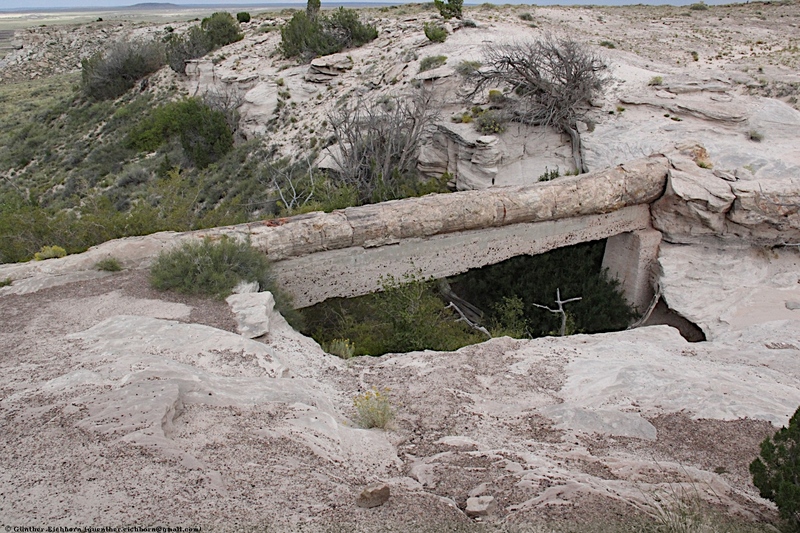 The site was formerly known as the Canyon Diablo Crater and fragments of the meteorite are officially called the Canyon Diablo Meteorite. 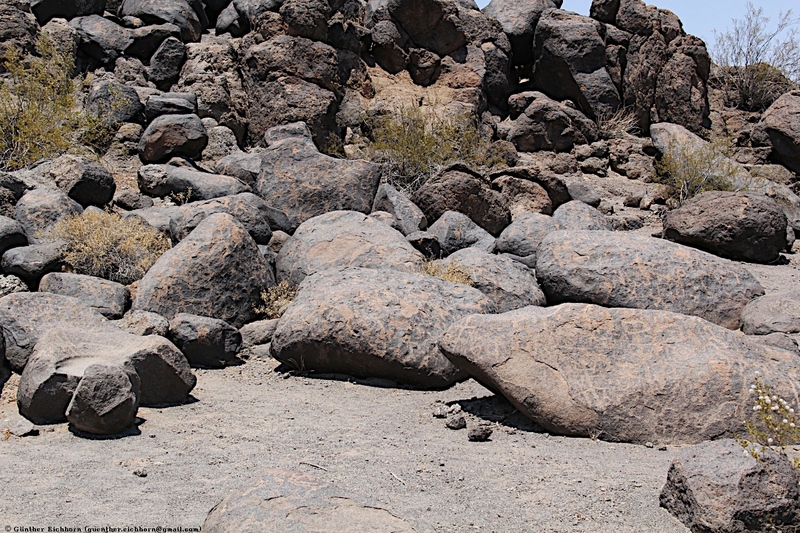 Scientists refer to the crater as Barringer Crater in honor of Daniel Barringer, who was first to suggest that it was produced by meteorite impact. 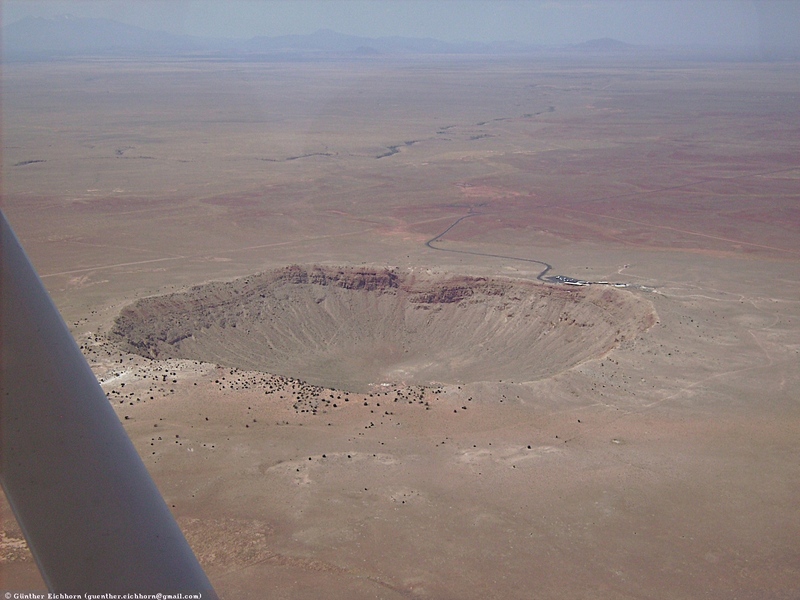 The crater is privately owned by the Barringer family through their Barringer Crater Company, which proclaims it to be the "best preserved meteorite crater on Earth". 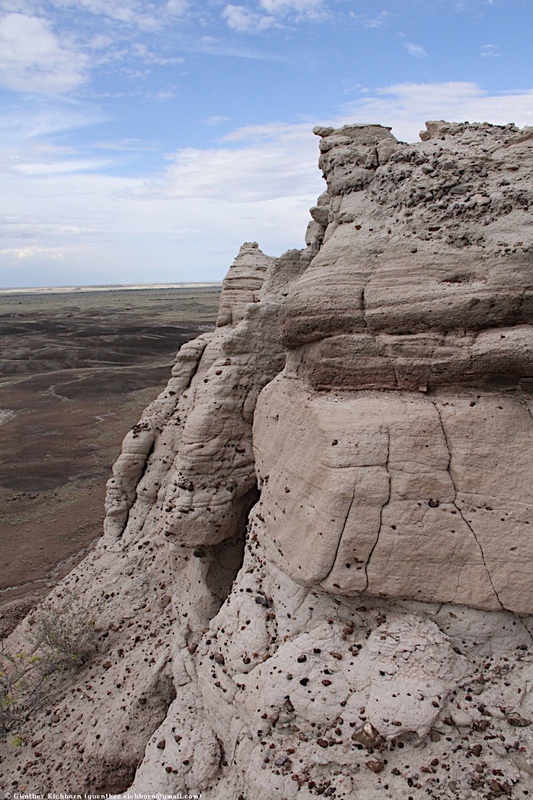 Despite its importance as a geological site, the crater is not protected as a national monument, a status that would require federal ownership. 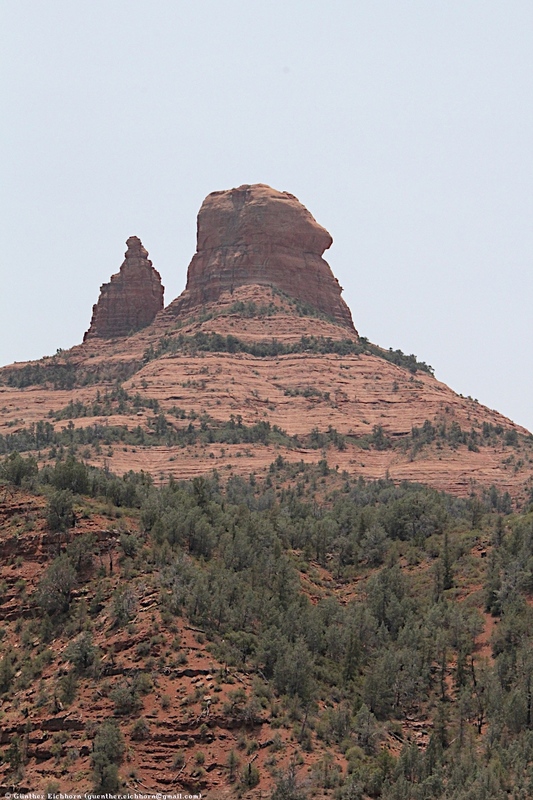 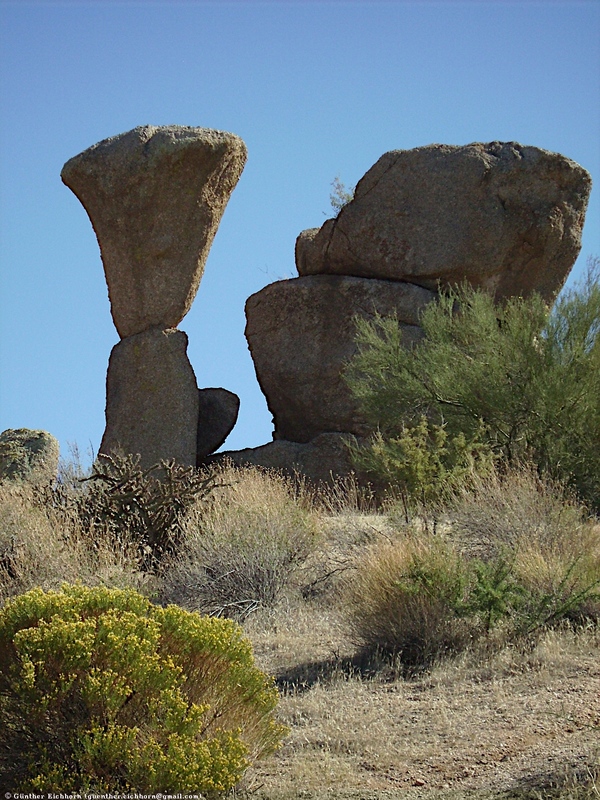 It was designated a National Natural Landmark in November 1967. 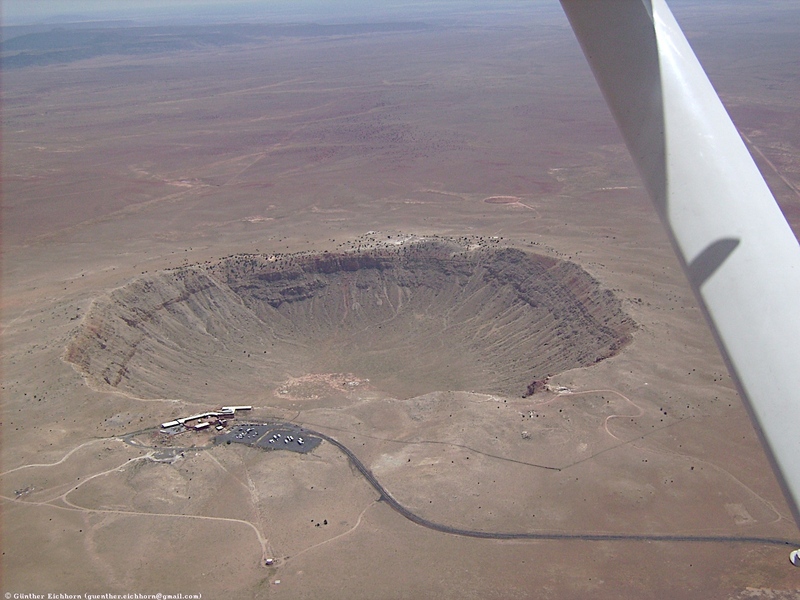 Meteor Crater lies at an elevation of about 1,740 m (5,710 ft) above sea level. 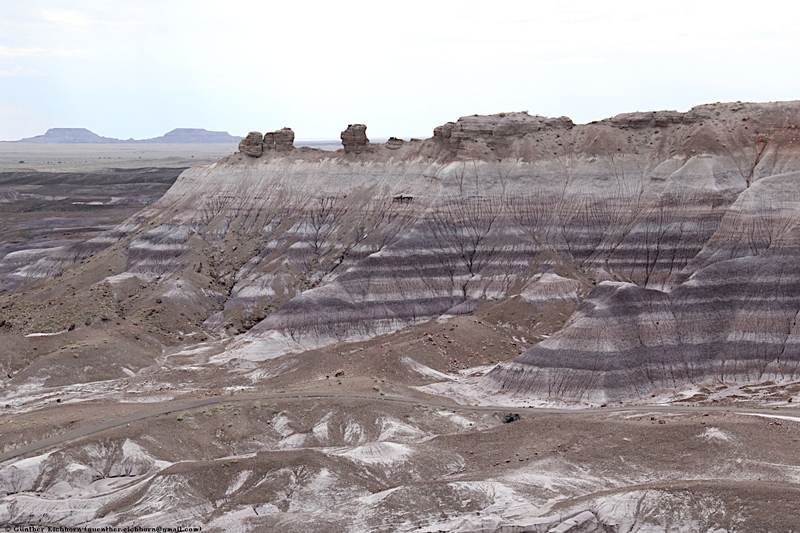 It is about 1,200 m (3,940 ft) in diameter, some 170 m (560 ft) deep, and is surrounded by a rim that rises 45 m (148 ft) above the surrounding plains. 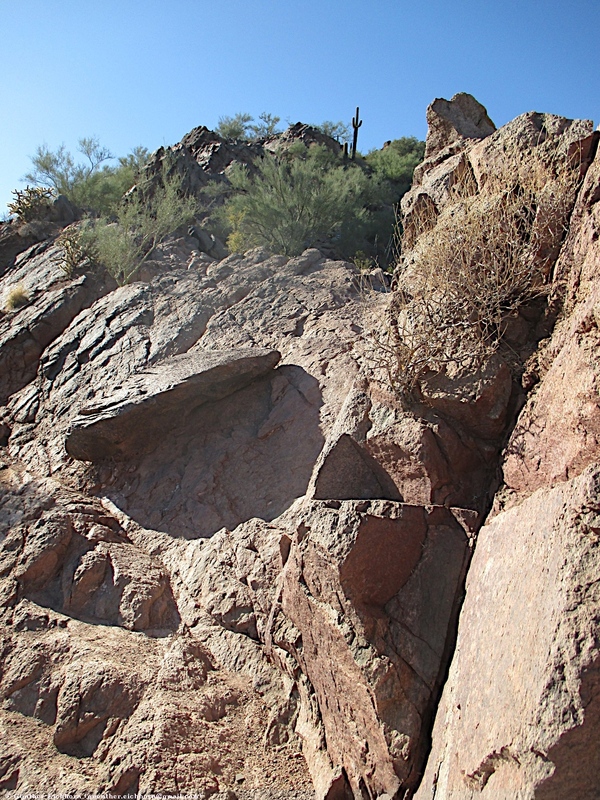 The center of the crater is filled with 210-240 m (690-790 ft) of rubble lying above crater bedrock. 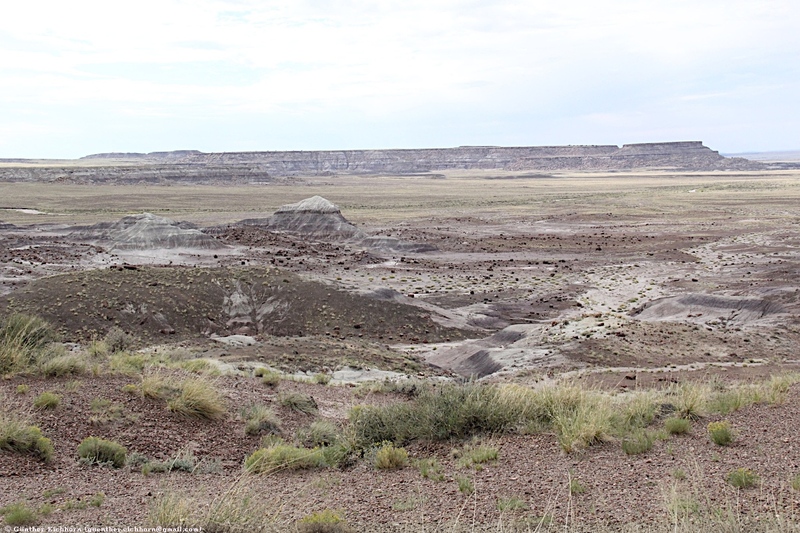 One of the interesting features of the crater is its squared-off outline, believed to be caused by existing regional jointing (cracks) in the strata at the impact site. 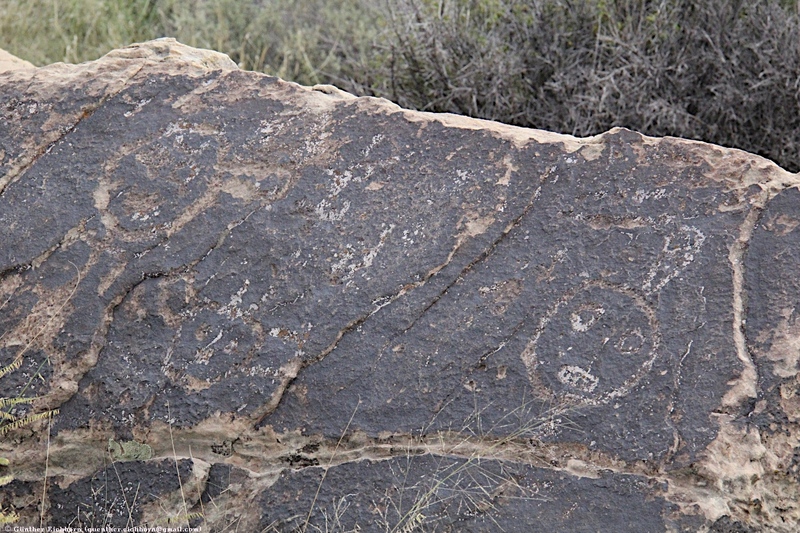 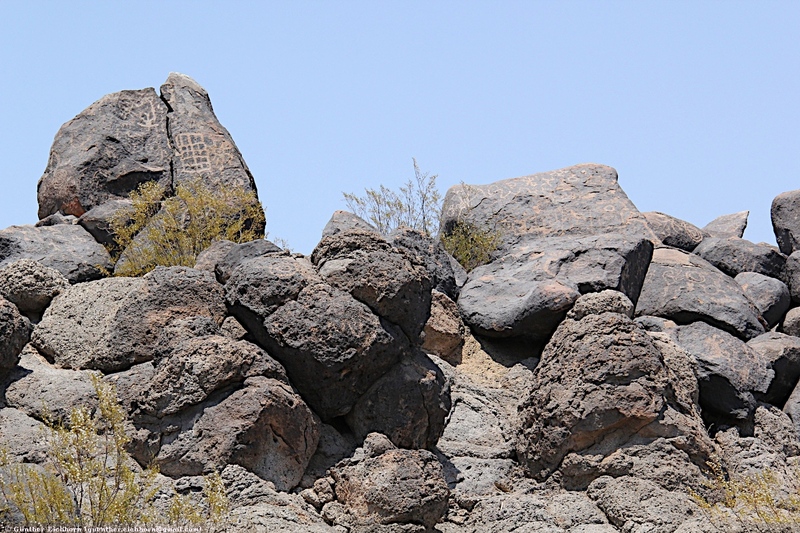 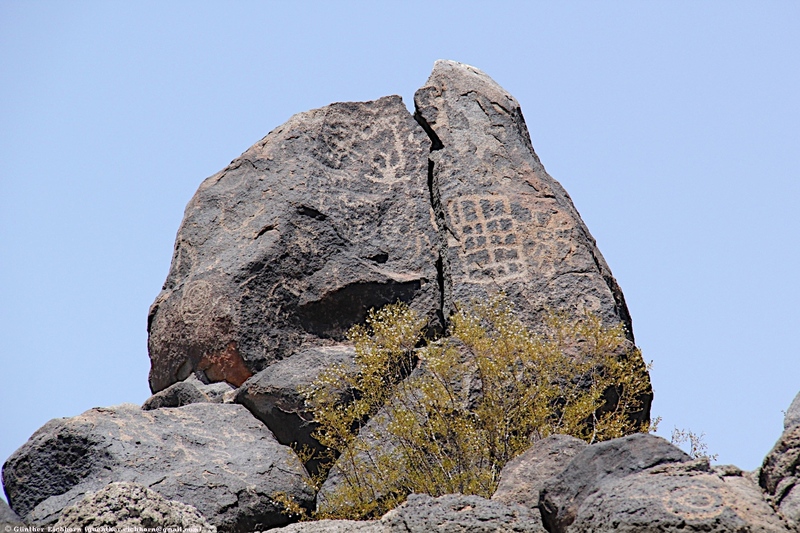 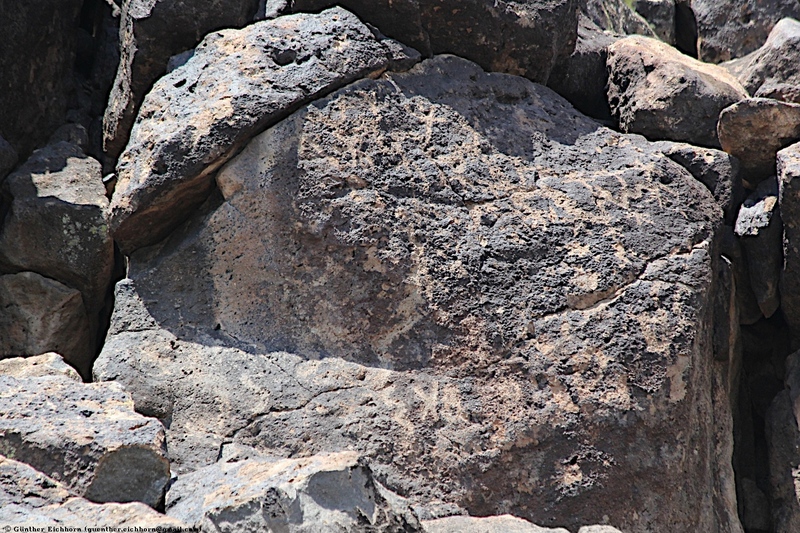 The Painted Rock Petroglyph Site is a collection of hundreds of ancient petroglyphs. 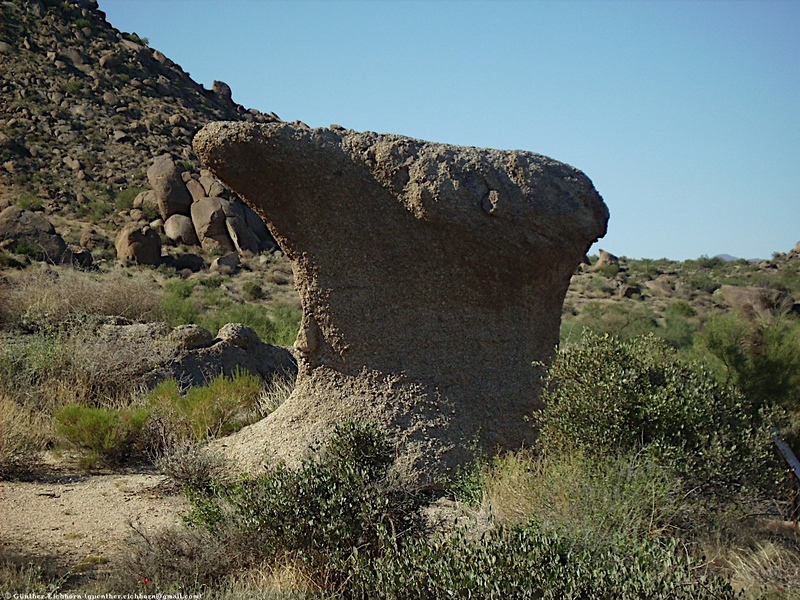 It is located on the eastern edge of the Painted Rock Mountains and about 29 km (18 miles) west by northwest of Gila Bend, Arizona. 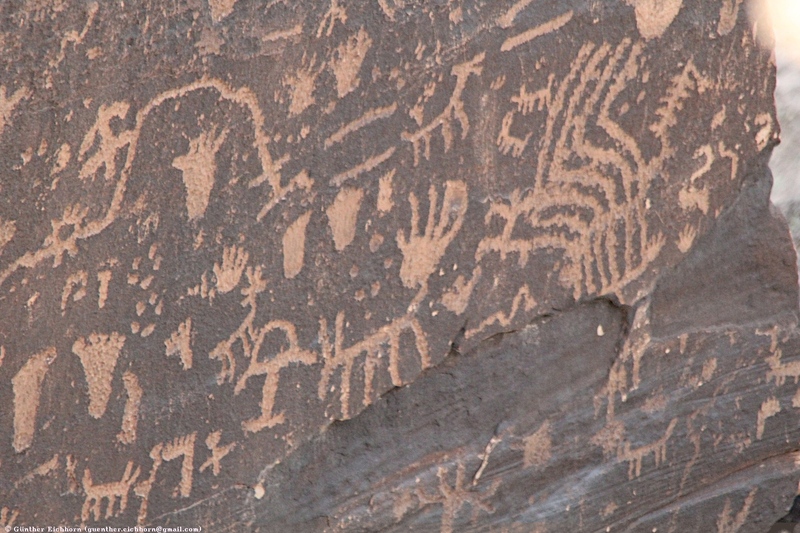 It is the largest known site with about 800 images. 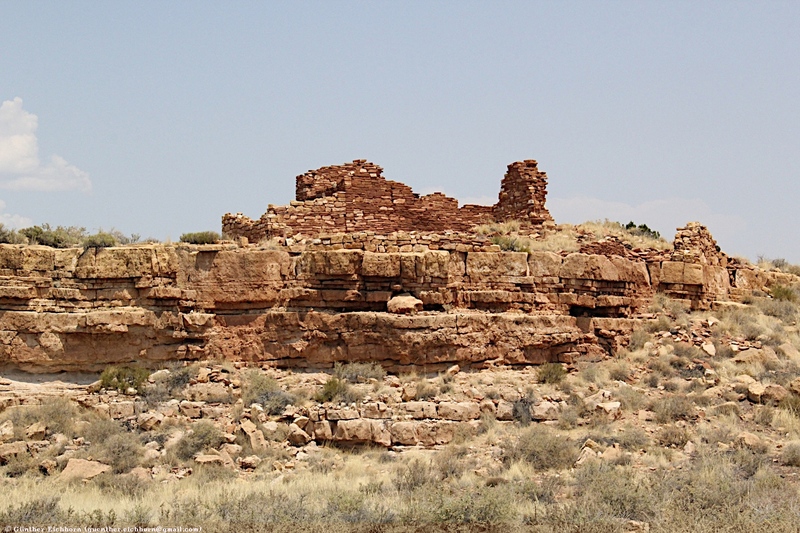 The Hohokam people once lived and farmed here. 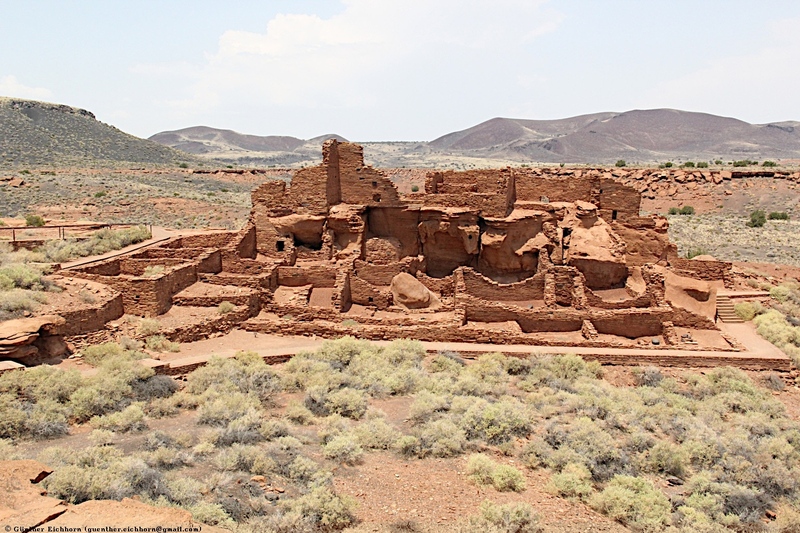 Ruins of their late Pioneer Period (CE 350 - CE 550) and Early Colonial Period (CE 550 - CE 700) villages are found to the north and west, and ruins of their Sedentary - Classic Period (CE 900 - CE 1400) villages are found to the south and east. 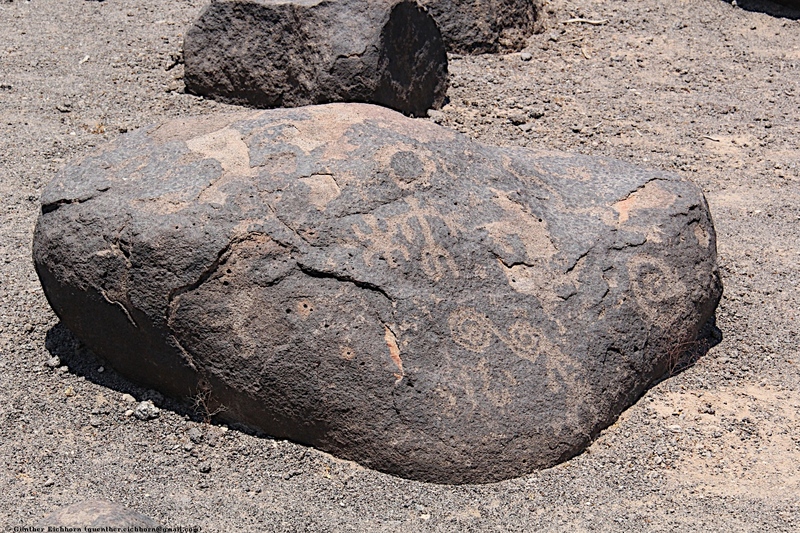 The Deer Valley Petroglyph Preserve, formerly known as the Deer Valley Rock Art Center, and also known as the Hedgpeth Hills Petroglyph Site and the Sonoran Desert preserve, is a 47-acre archaeological site containing over 1500 Hohokam, Patayan, and Archaic petroglyphs visible on 500 basalt boulders in the Deer Valley area of Phoenix, Arizona. 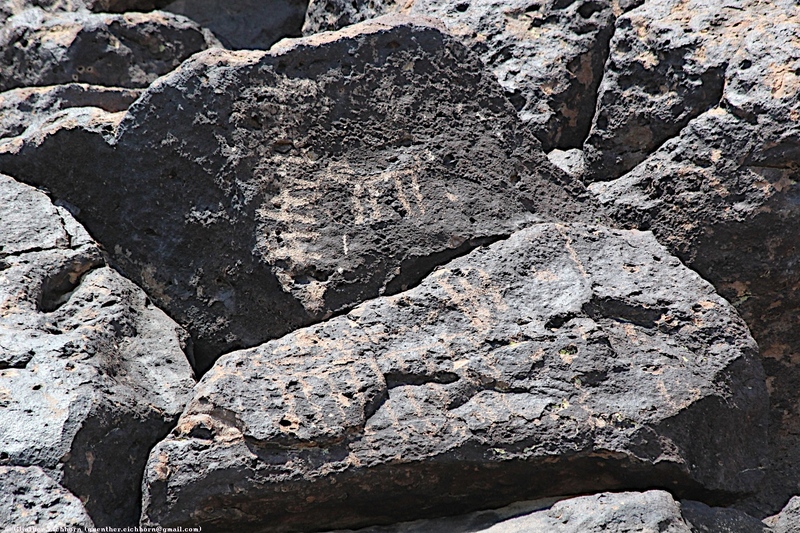 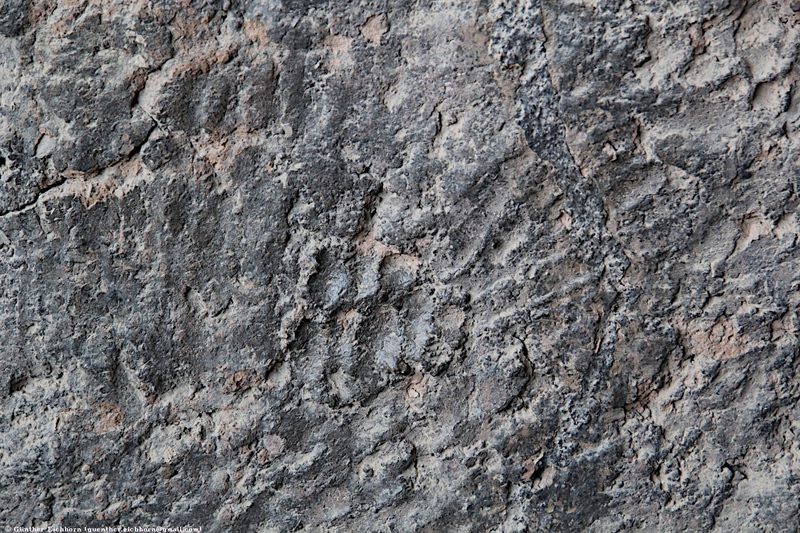 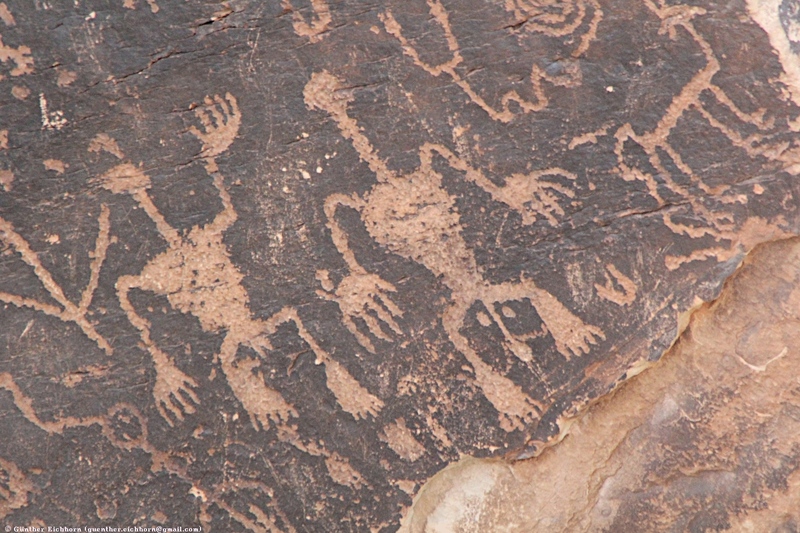 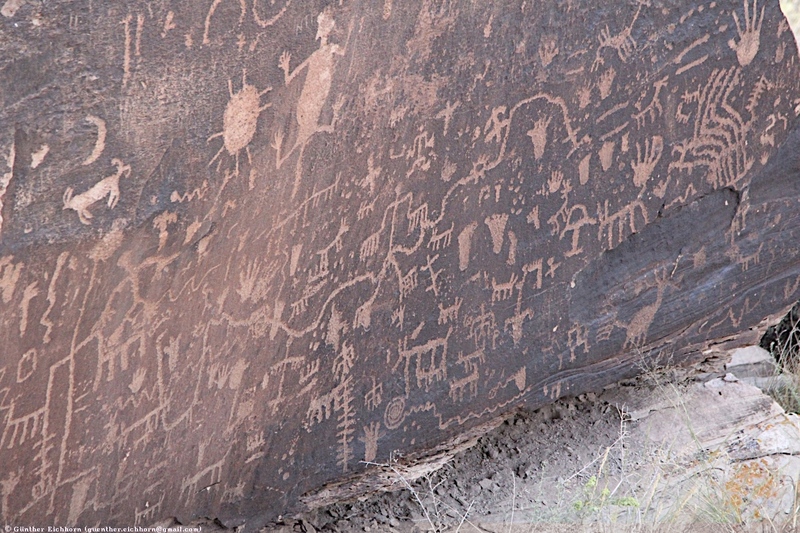 The petroglyphs are between 500 and 7,000 years old, and at least one source dates the petroglyphs to 10,000 years ago. 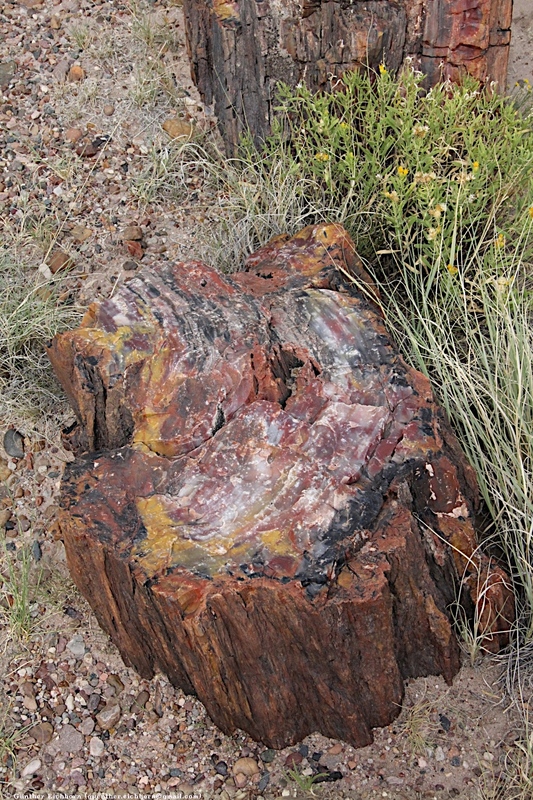 In Petrified Forest National Park at many sites, petroglyphs—images, symbols, or designs—have been scratched, pecked, carved, or incised on rock surfaces, often on a patina known as desert varnish. 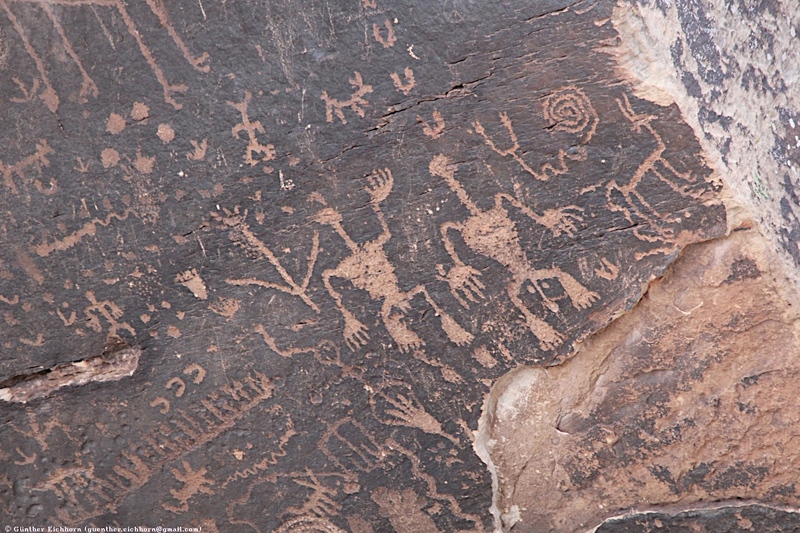 Most of the petroglyphs in Petrified Forest National Park are thought to be between 650 and 2,000 years old. 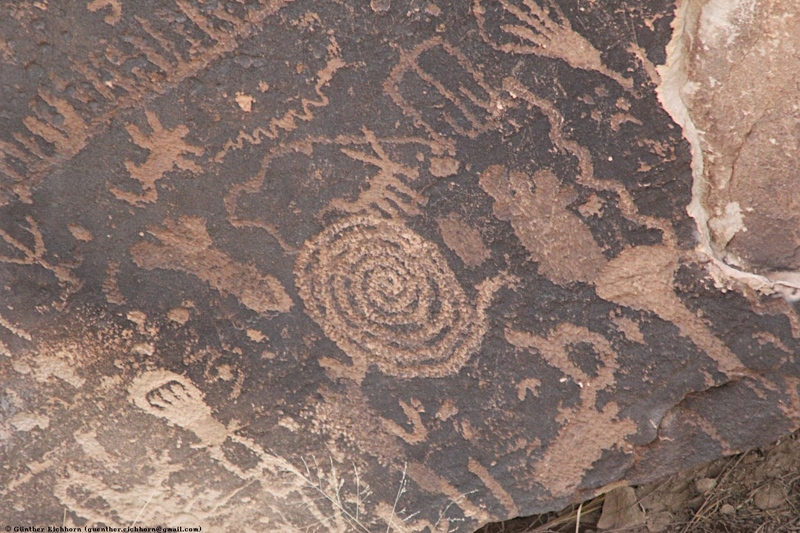 The "Newspaper Rock" is the most impressive petroglyph site in the Petrified Forest National Park. 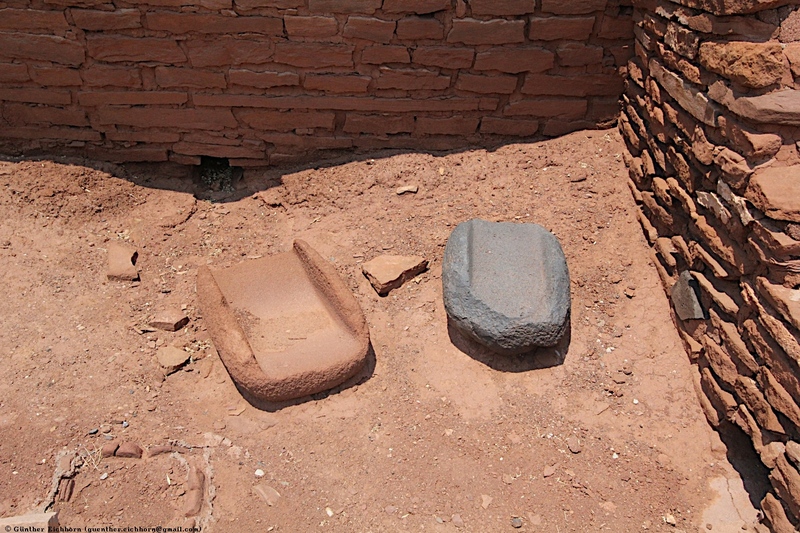 The Wupatki National Monument is a U.S. National Monument located in north-central Arizona, near Flagstaff. 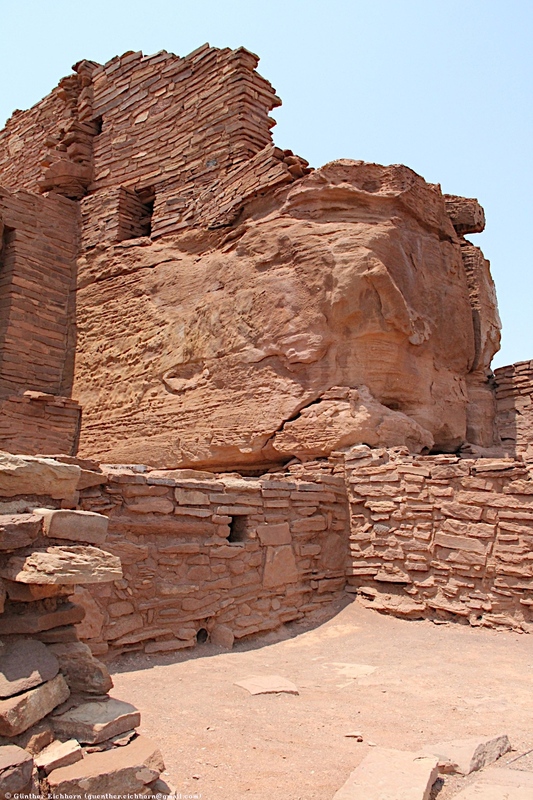 The many settlement sites scattered throughout the monument were built by the Ancient Pueblo People, more specifically the Cohonina, Kayenta Anasazi, and Sinagua. 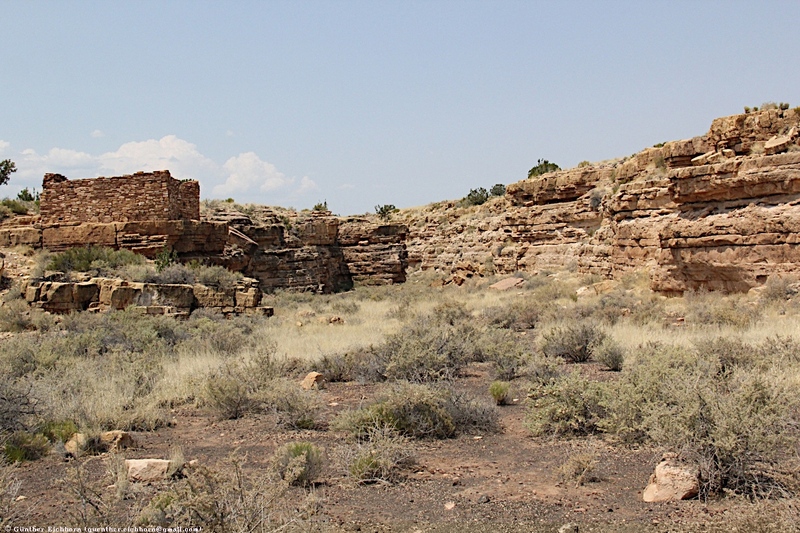 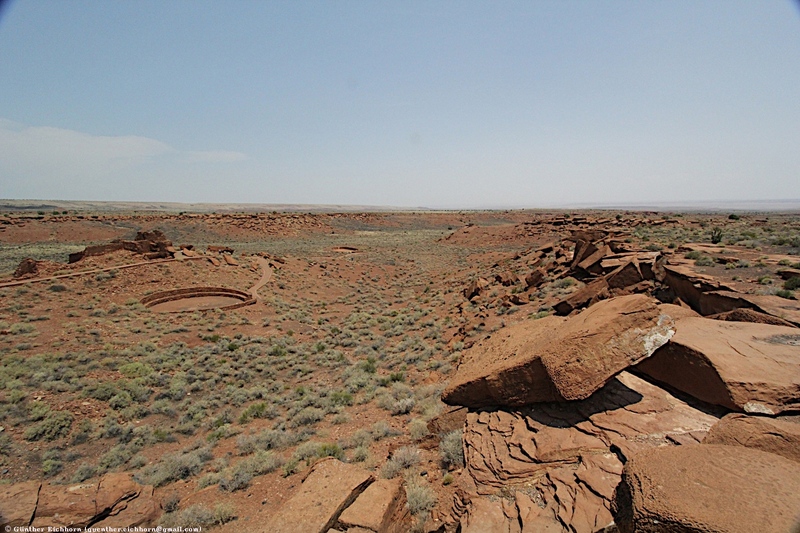 Wupatki was first inhabited around 500 CE. 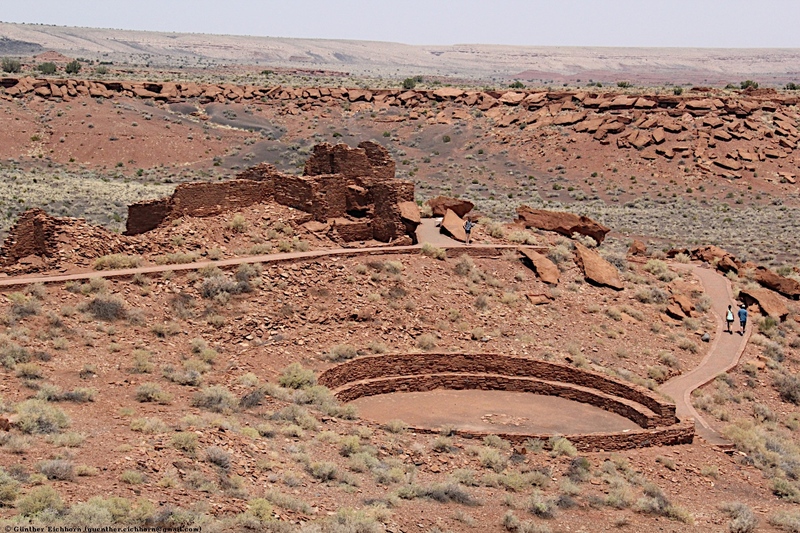 Wupatki, which means "Tall House" in the Hopi language, is a multistory Sinagua pueblo dwelling comprising over 100 rooms and a community room and ball court, making it the largest building for nearly 80 km (50 miles). 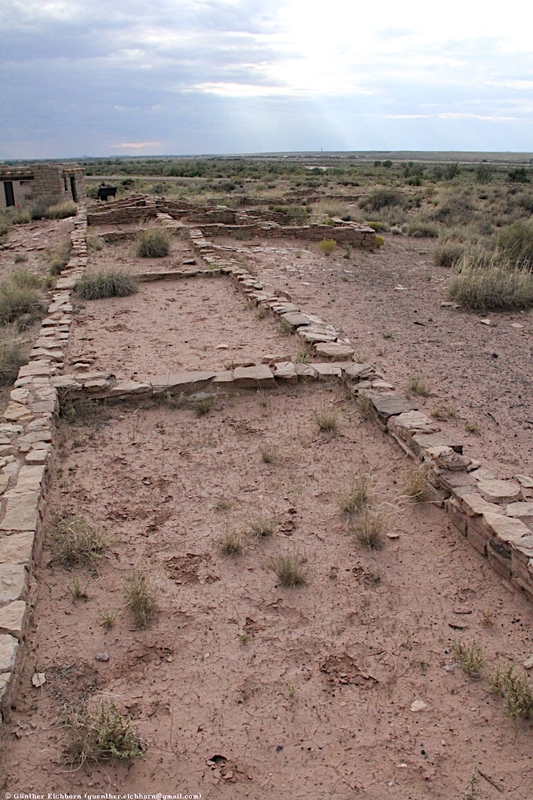 Nearby secondary structures have also been uncovered, including two kiva-like structures. 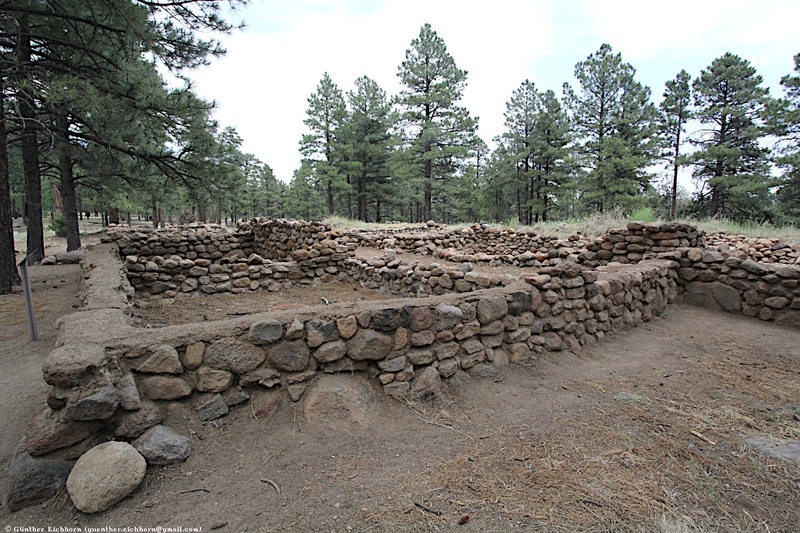 A major population influx began soon after the eruption of Sunset Crater in the 11th century (between 1040 and 1100), which blanketed the area with volcanic ash; this improved agricultural productivity and the soil's ability to retain water. 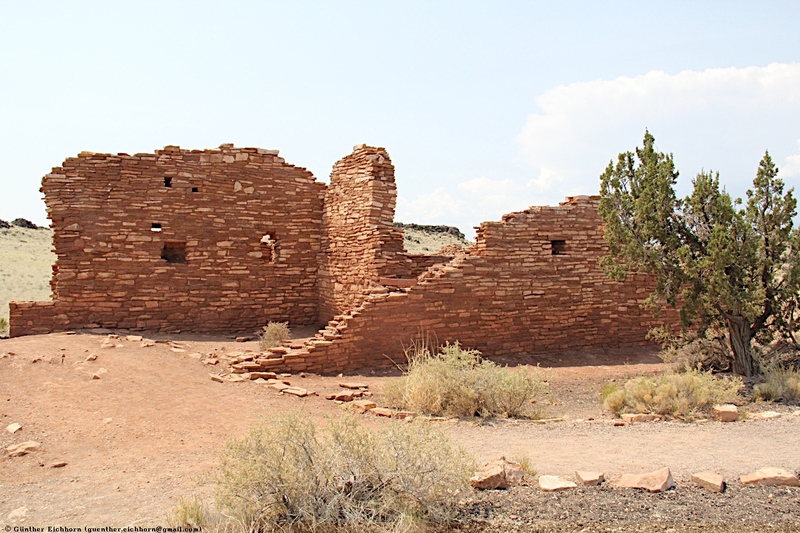 By 1182, approximately 85 to 100 people lived at Wupatki Pueblo but by 1225, the site was permanently abandoned. 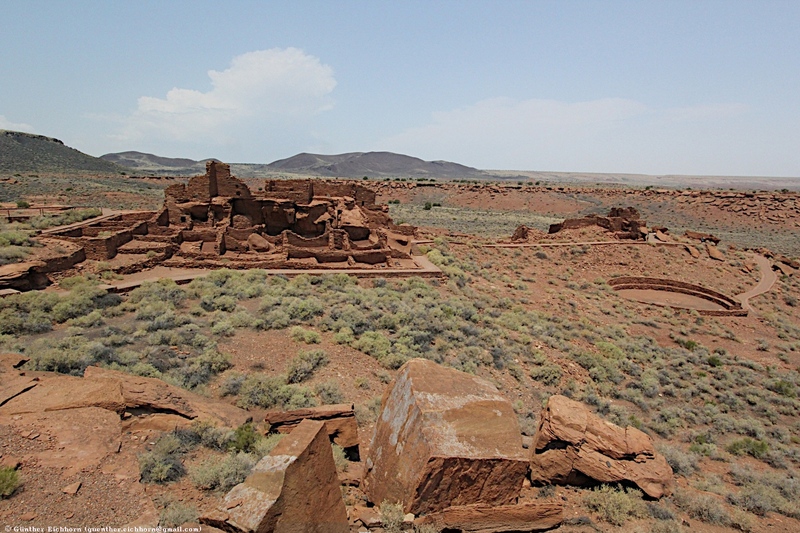 The largest settlement on monument territory is the Wupatki Ruin, built around a natural rock outcropping. 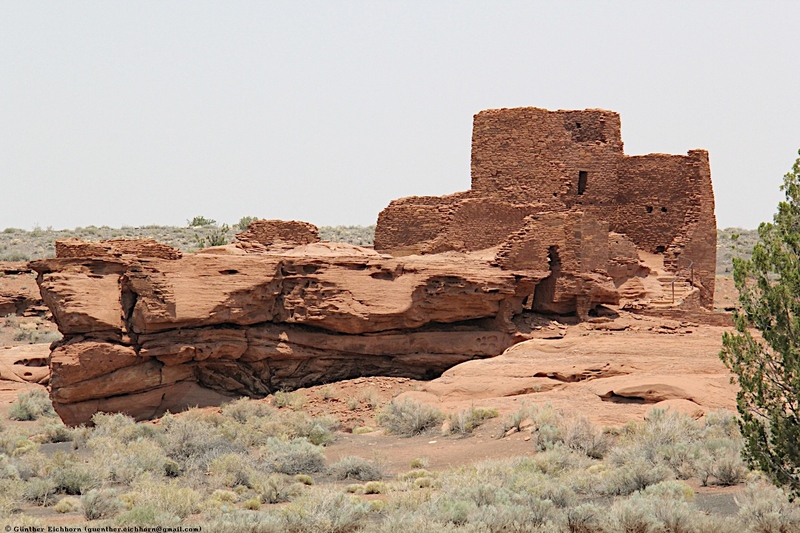 With over 100 rooms, this ruin is believed to be the area's tallest and largest structure for its time period. 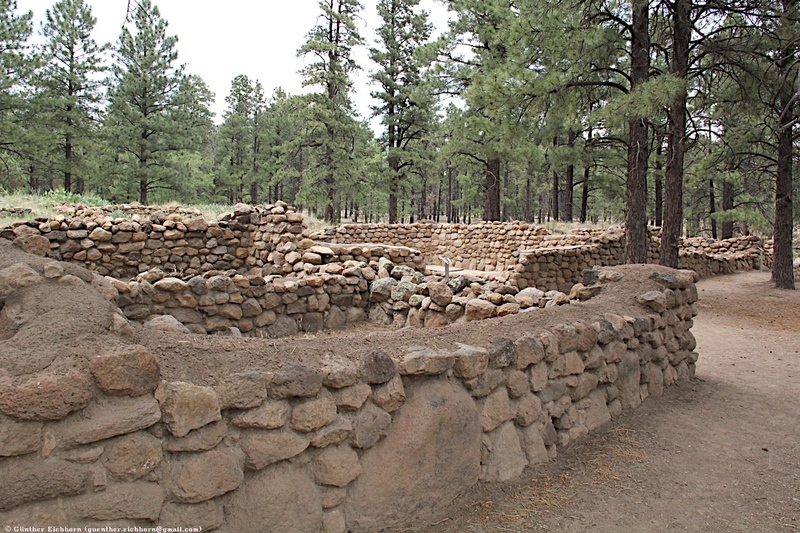 The monument also contains ruins identified as a ball court, similar to those found in Mesoamerica and in the Hohokam ruins of southern Arizona; this is the northernmost example of this kind of structure. 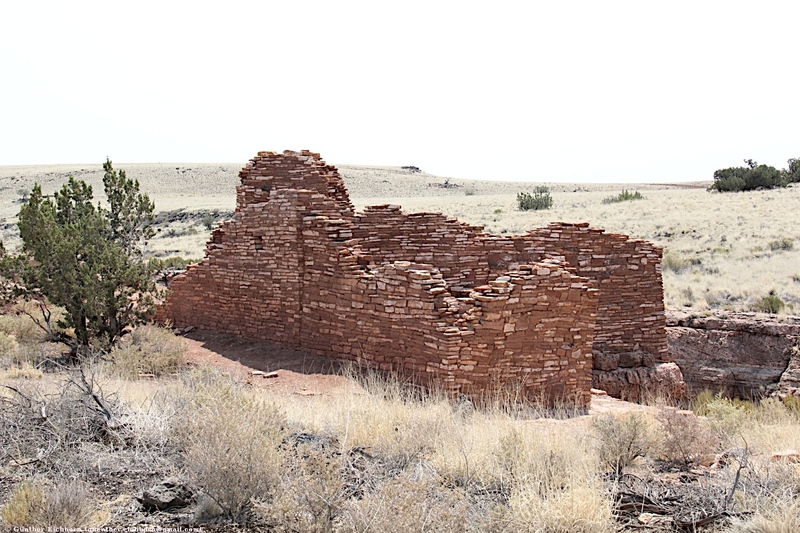 The Wukoki Pueblo is a classic example of early pueblo construction. 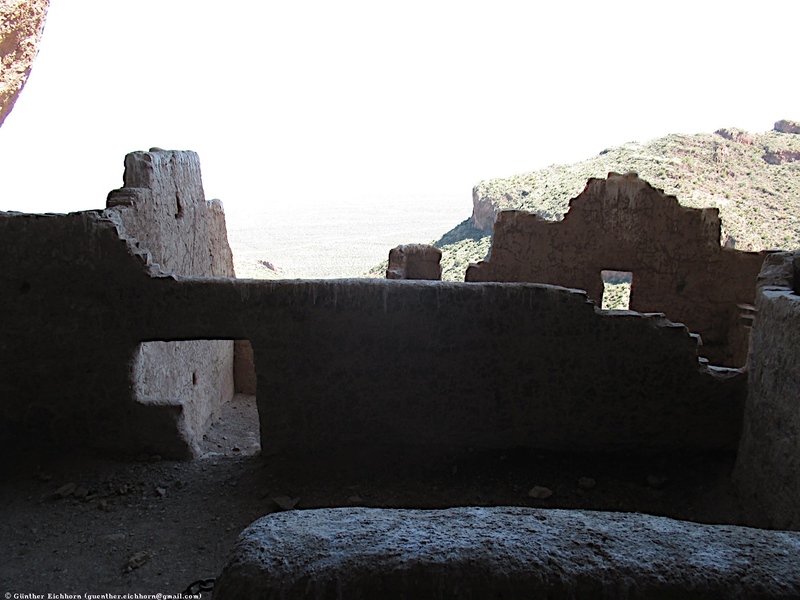 The ruins were built on a rock outcrop atop a hill. 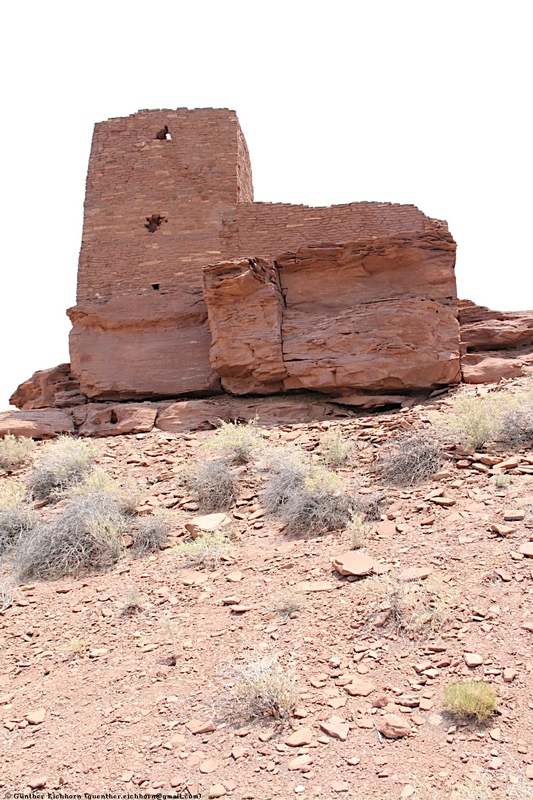 The 3 story structure standing on its prominent location has the appearance of a fortress with a commanding view of the surrounding landscape. 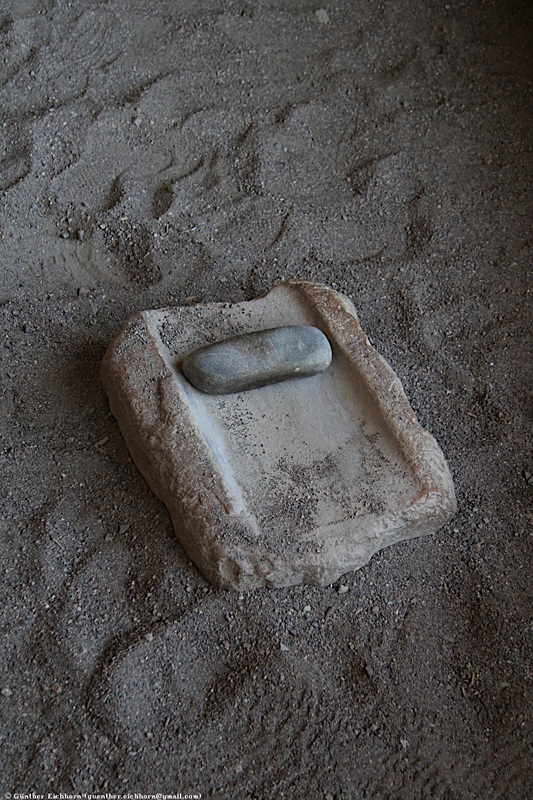 The name "Wukoki" means "big house". 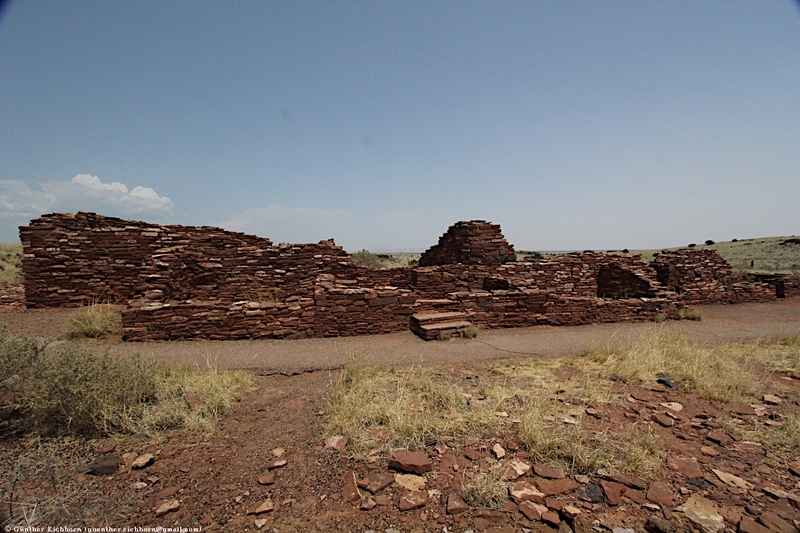 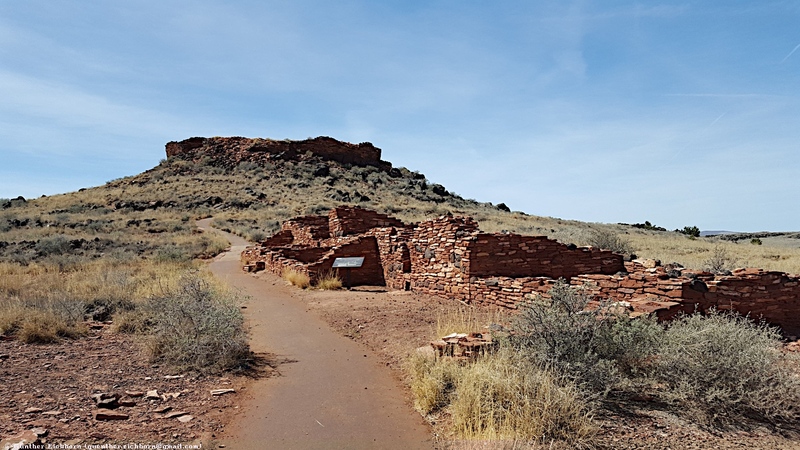 Contrary to many of the ruins in the American Southwest, Wukoki and Wupatki, are prominently located on hills overlooking the vast stretches of the Colorado Plateau. 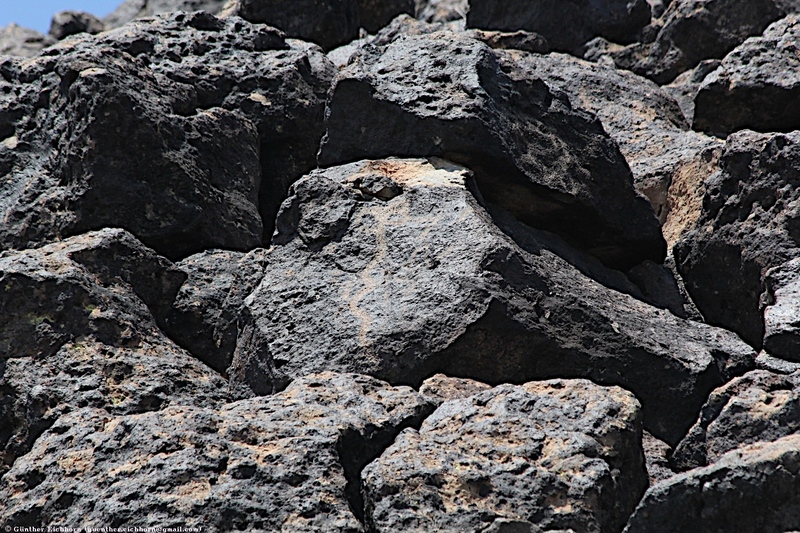 Wukoki in particular appears to have been strategically located for observation purposes. 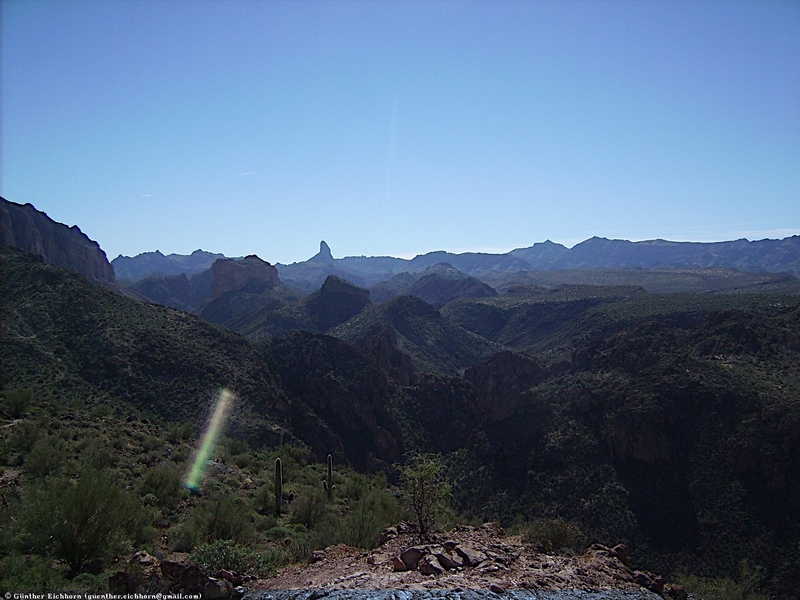 If there was an alert watcher on top of the towers, he or she could have seen someone coming many miles away. 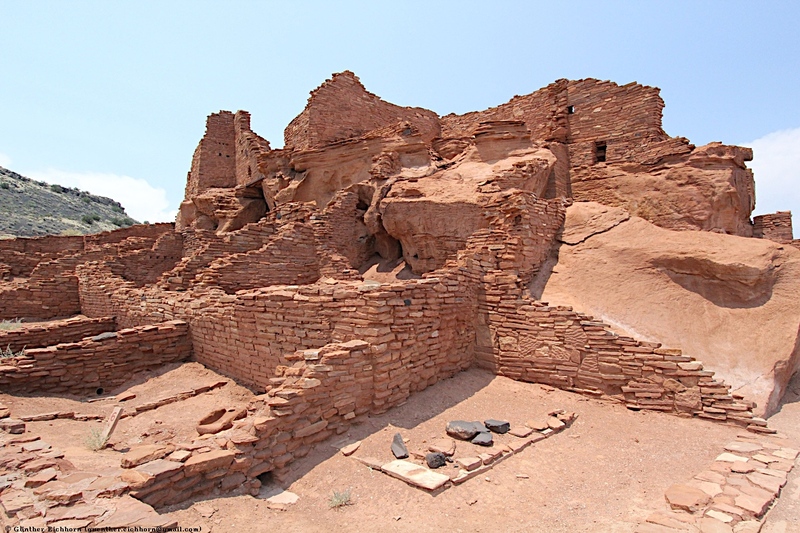 The sites for the dwellings was certainly not located for close proximity to running water, the only significant stream in the area, the Little Colorado River, is about 8 km (5.0 miles) from the site of the pueblo. 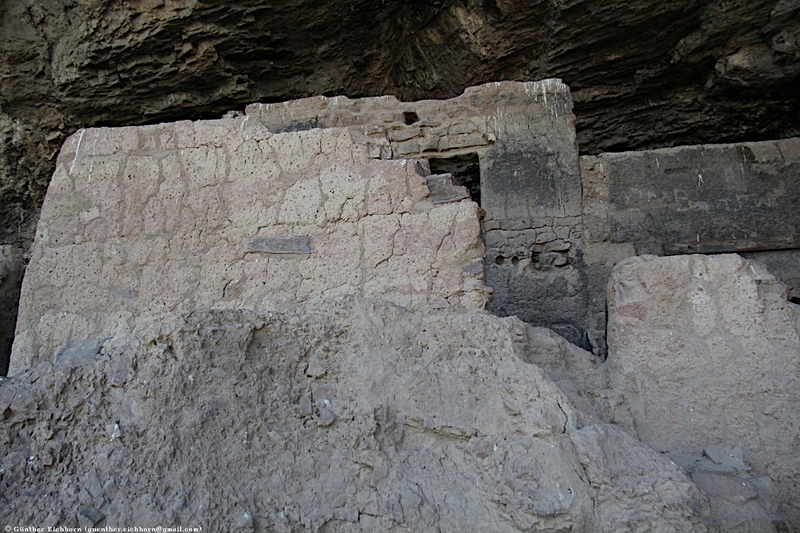 The Citadel, as yet not excavated, is a fortified apartment house. 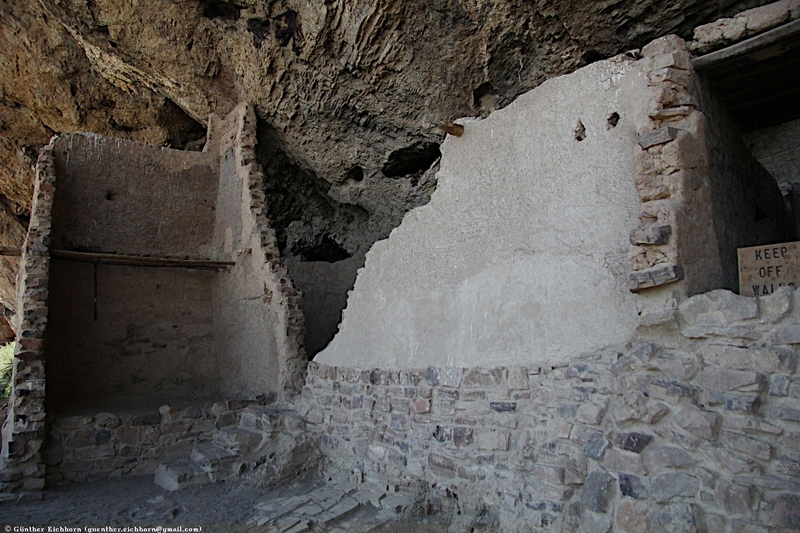 Probably it was 1 or 2 stories high and contained nearly 50 rooms, completely surrounding a central plaza. 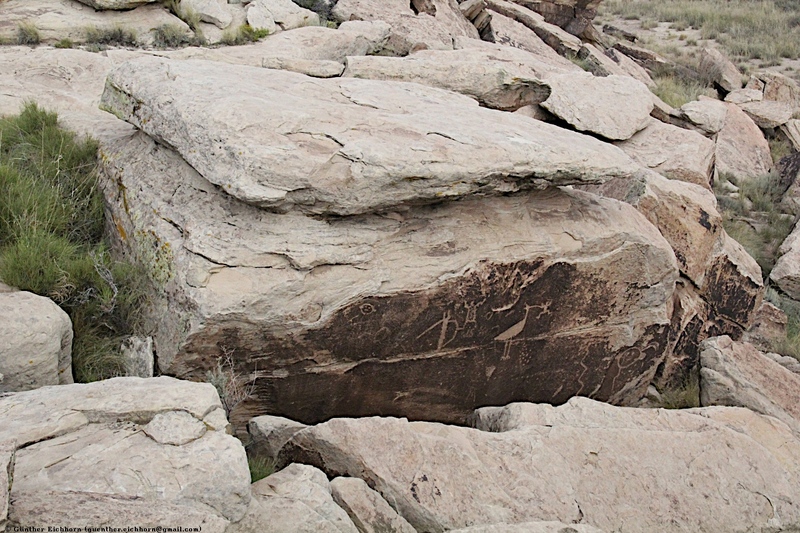 Its impregnable position on top of a small lava-capped mesa, overlooking a wide expanse of country, suggests that it served as a retreat during times of stress. 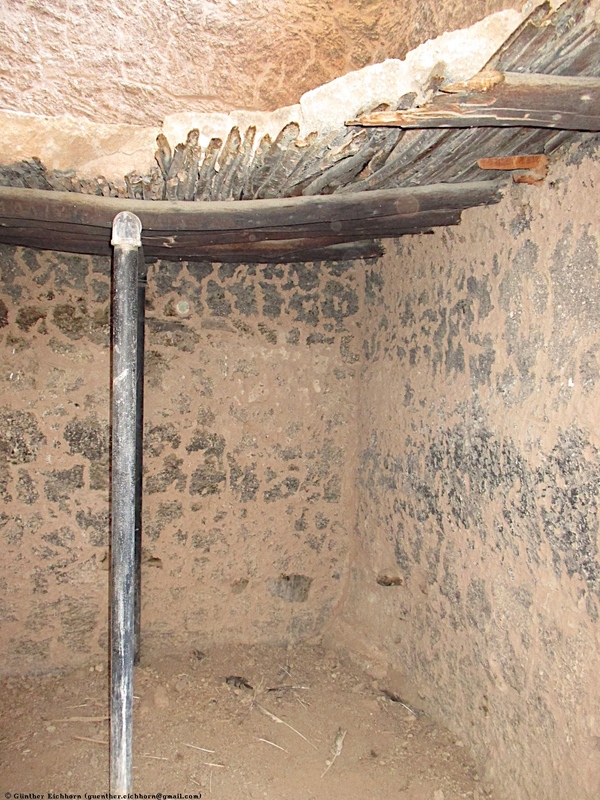 Numerous loopholes through the thick walls strengthen this impression. 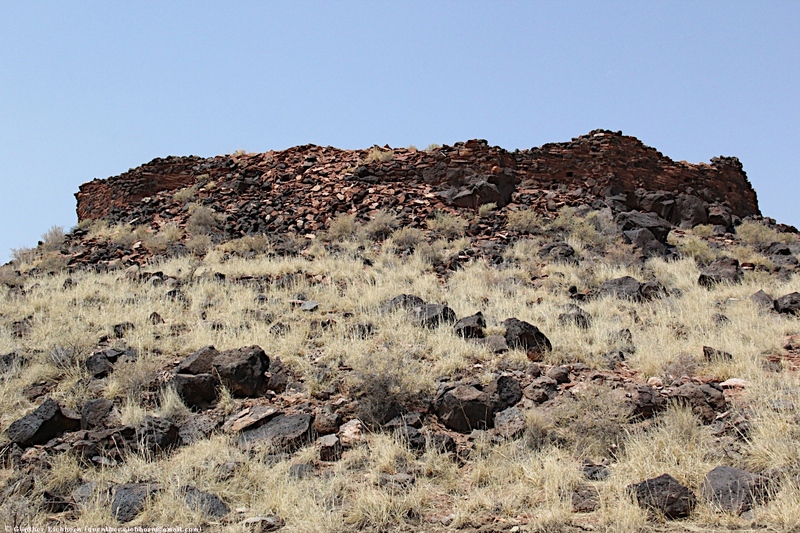 On the terraced slopes of the mesa are circles of boulders, perhaps the remains of pole-and-mud houses. 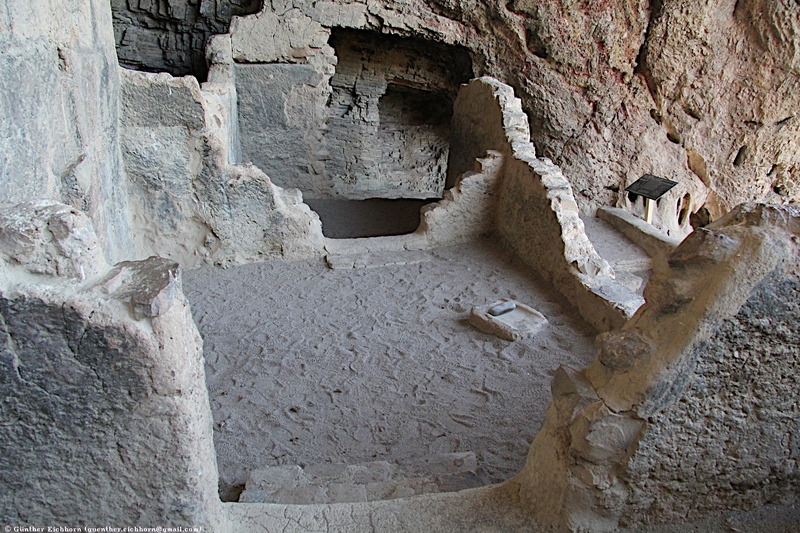 It is possible that the Citadel was built to guard a water supply that existed in the nearby limestone sinkhole. 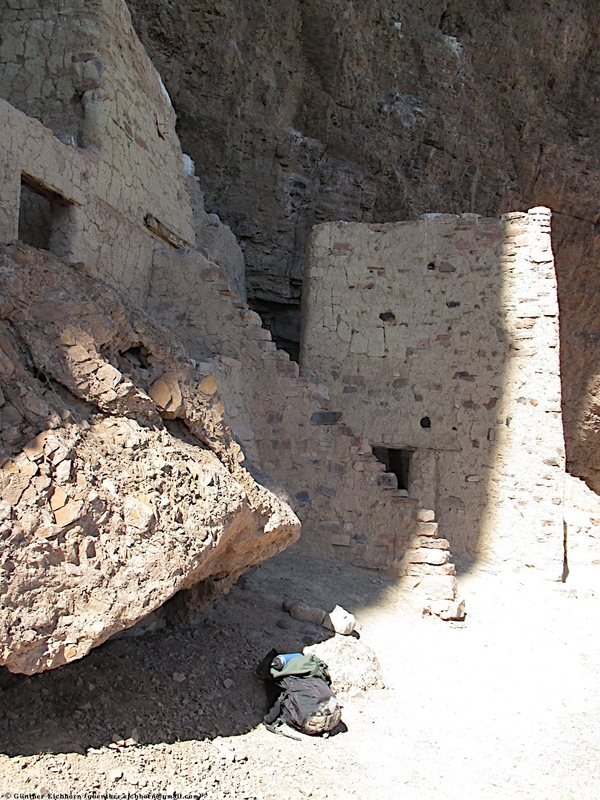 Just below the Citadel is the small pueblo now called Nalakihu, a Hopi word for "House Standing Alone." 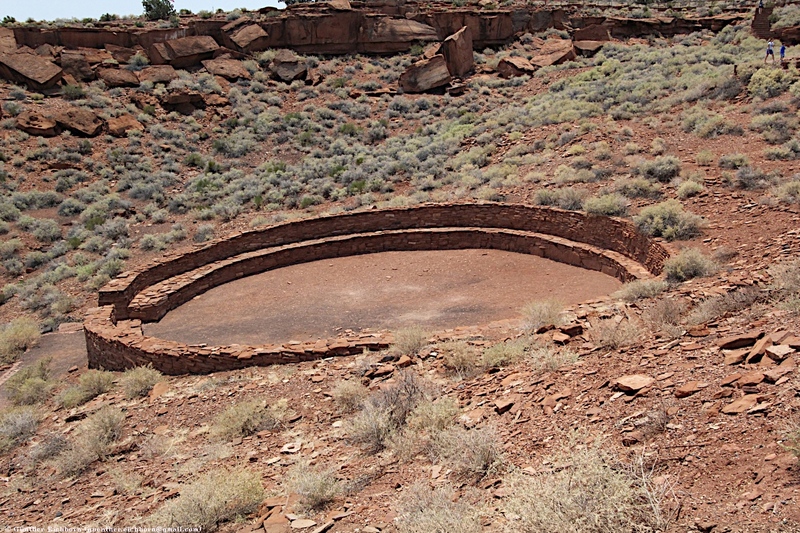 Like Wupatki, it was excavated in 1934. 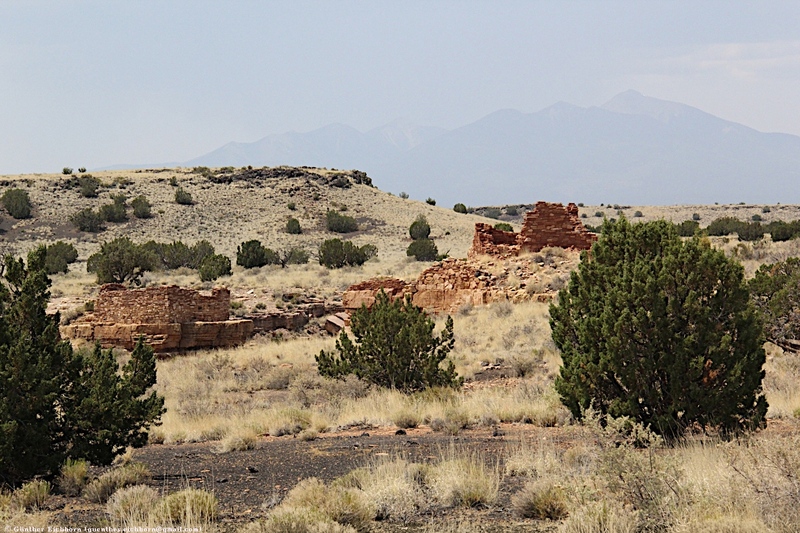 The Lomaki Pueblo is built right on the edge of a shallow, vertical-walled canyon, which was probably formed by faulting or other volcanic activity, and has a good view of the snow-capped San Francisco Peaks to the west. 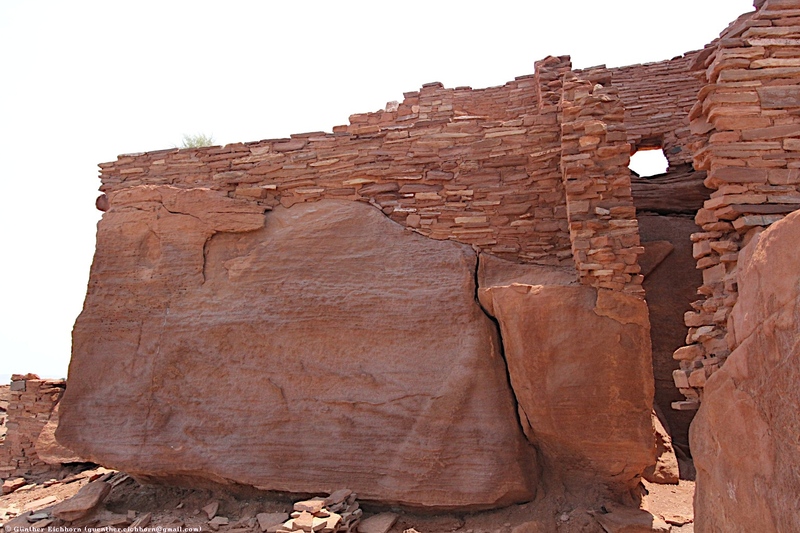 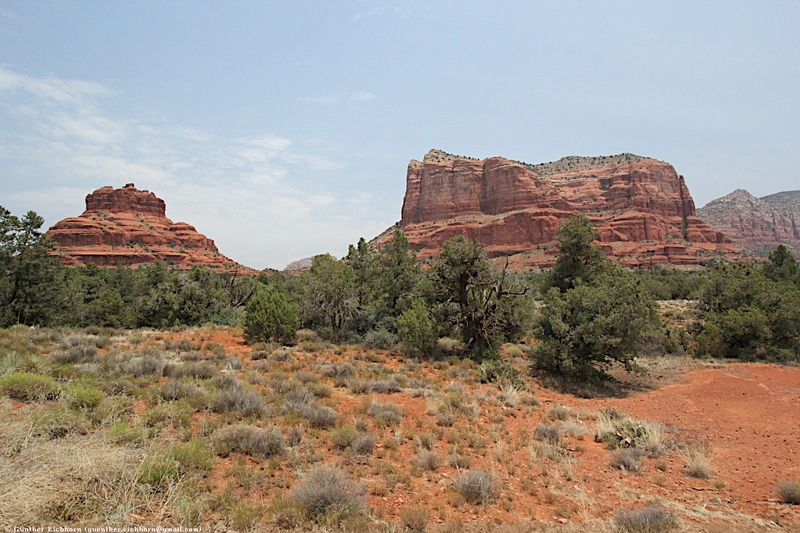 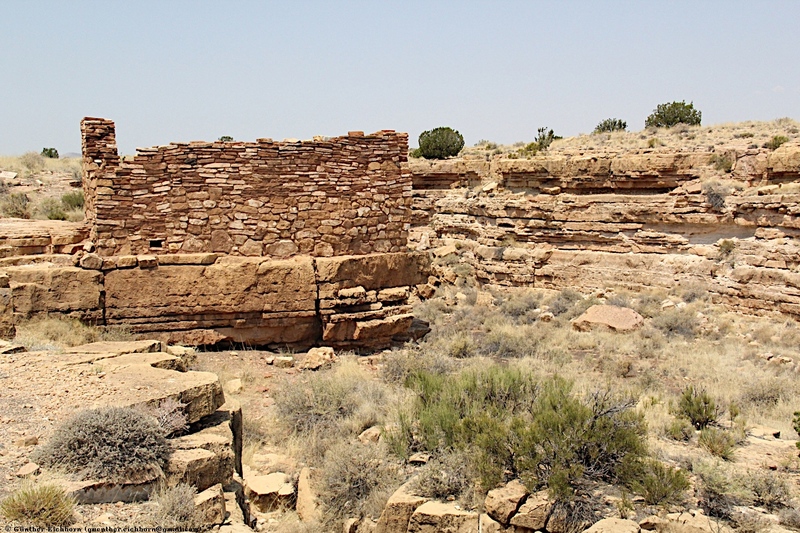 All buildings sit on flat, thin-layered strata of the local Moenkopi sandstone, deep red-brown in color The site includes several pueblos that sit above a box canyon as well as the similar situated remains of the Lomaki Ruins. 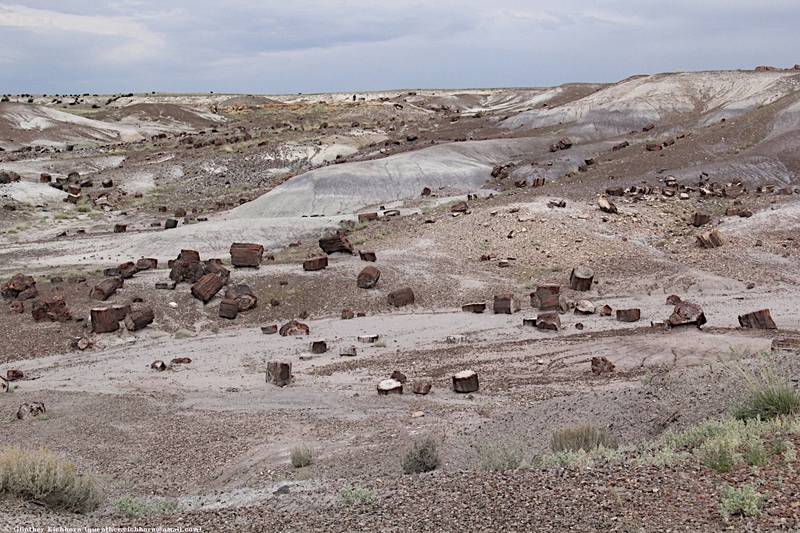 Petrified Forest National Park is a United States national park in Navajo and Apache counties in northeastern Arizona. 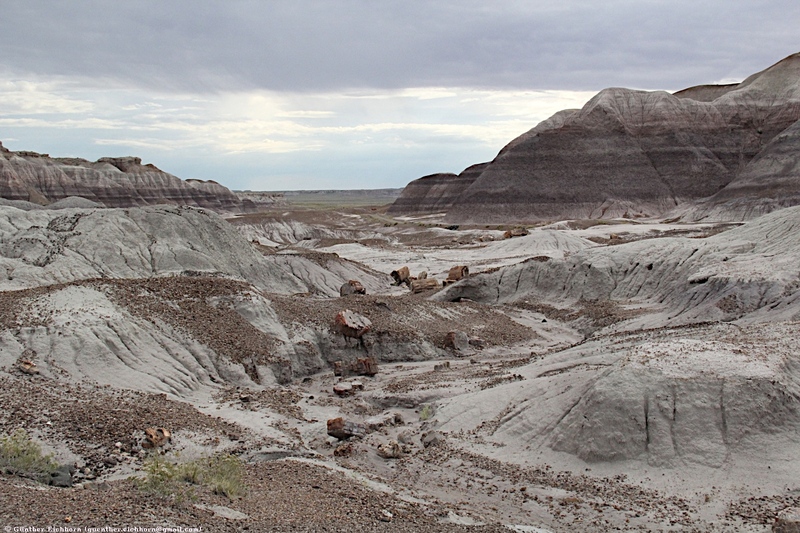 Named for its large deposits of petrified wood, the fee area of the park covers about 600 km² (230 square miles), encompassing semi-desert shrub steppe as well as highly eroded and colorful badlands. 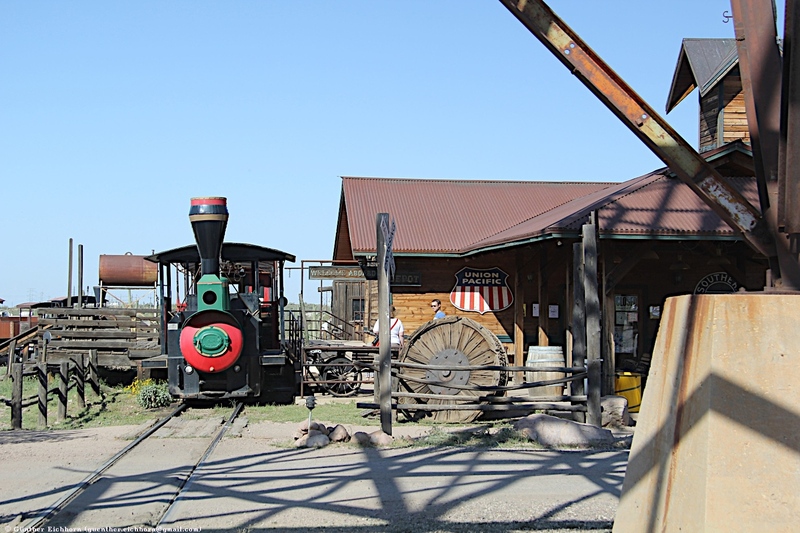 The park's headquarters is about 42 km (26 miles) east of Holbrook along Interstate 40 (I-40), which parallels the BNSF Railway's Southern Transcon, the Puerco River, and historic U.S. Route 66, all crossing the park roughly east–west. 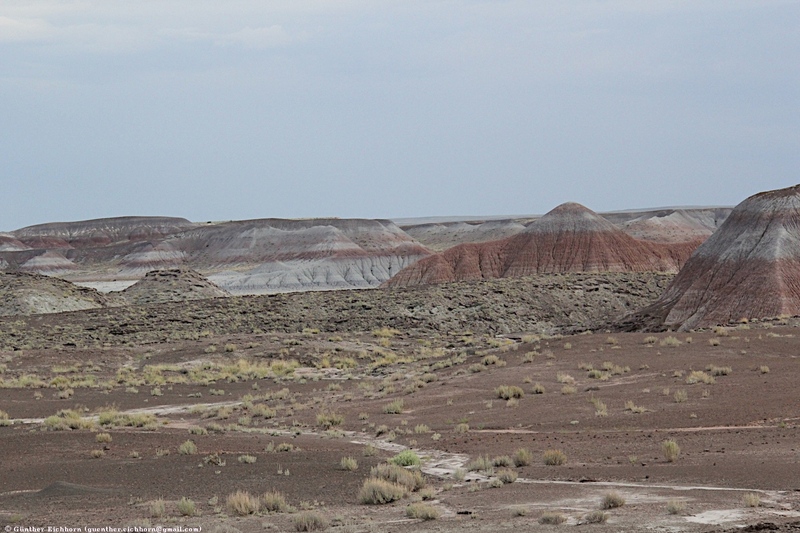 The site, the northern part of which extends into the Painted Desert, was declared a national monument in 1906 and a national park in 1962. 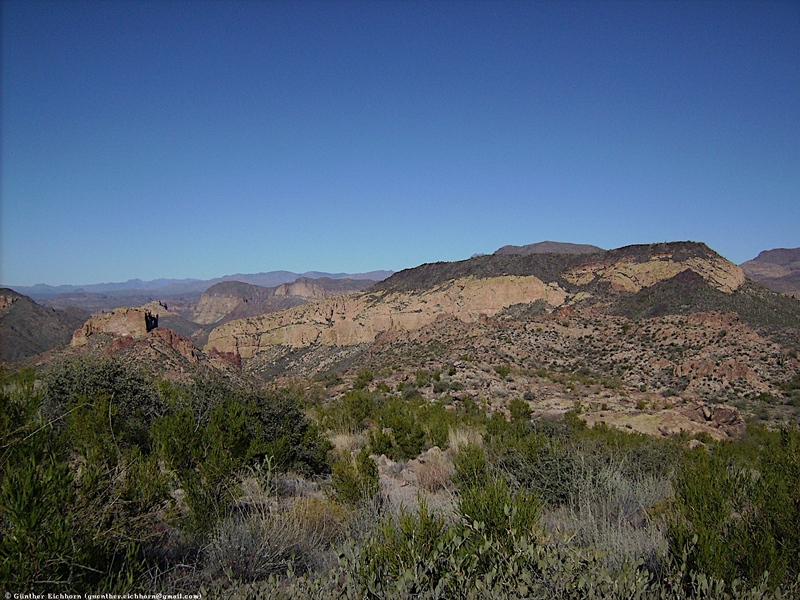 Averaging about 1,600 m (5,250 ft) in elevation, the park has a dry windy climate with temperatures that vary from summer highs of about 38°C (100°F) to winter lows well below freezing. 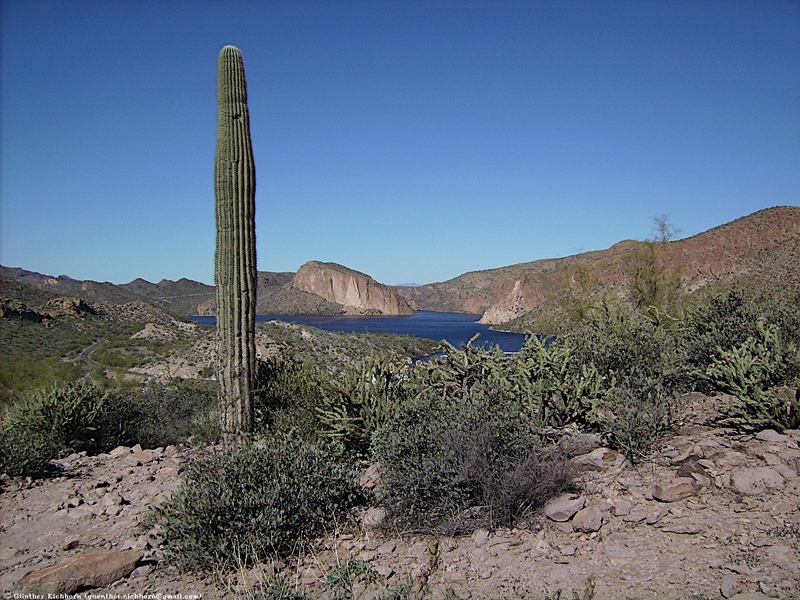 More than 400 species of plants, dominated by grasses such as bunchgrass, blue grama, and sacaton, are found in the park. 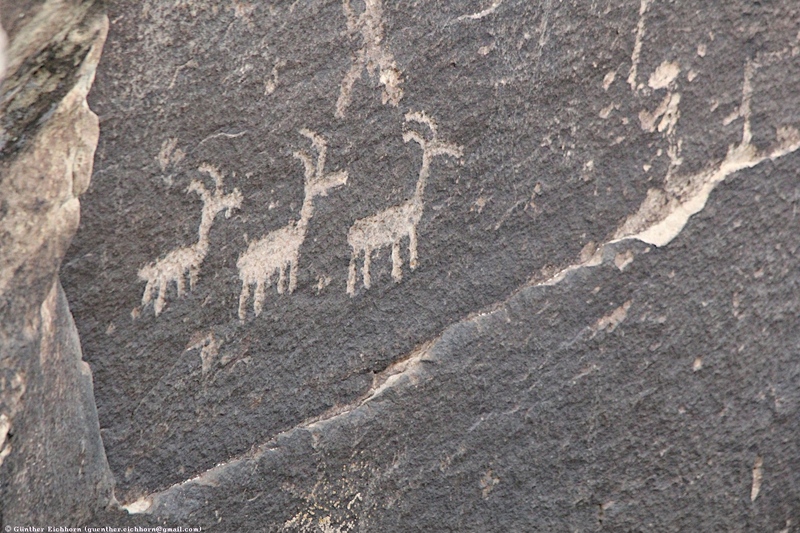 Fauna include larger animals such as pronghorns, coyotes, and bobcats, many smaller animals, such as deer mice, snakes, lizards, seven kinds of amphibians, and more than 200 species of birds, some of which are permanent residents and many of which are migratory. 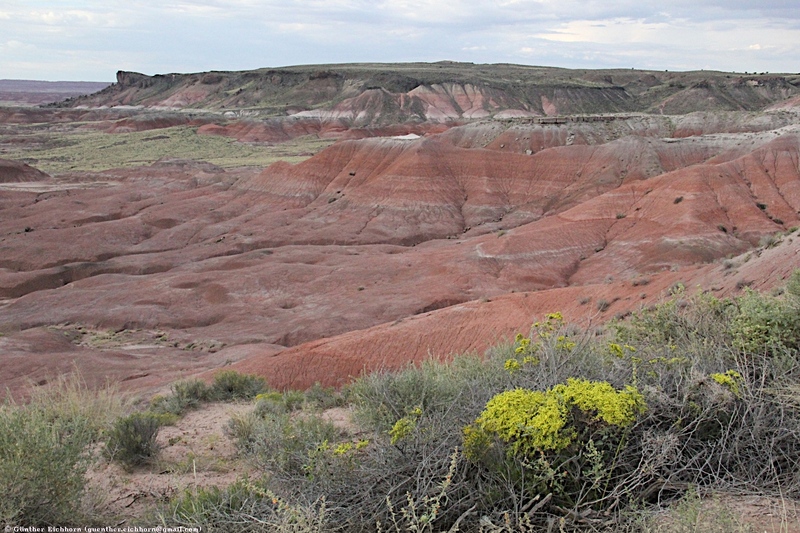 About half of the park is designated wilderness. 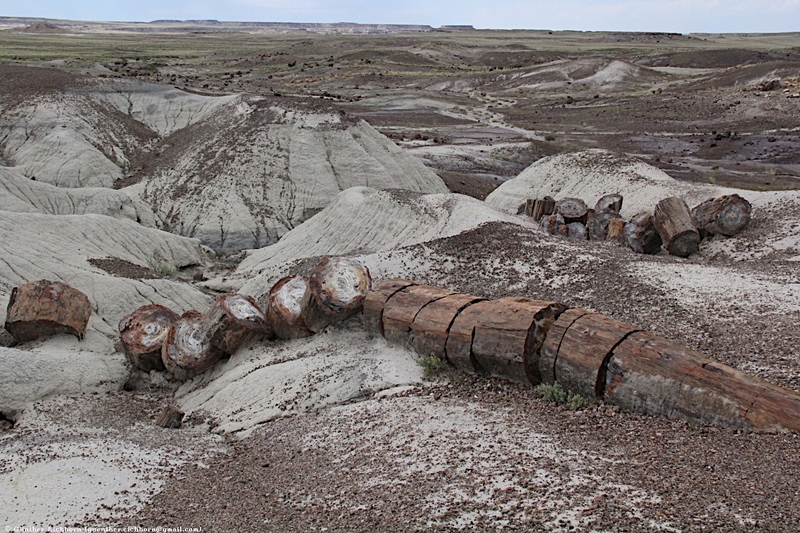 The Petrified Forest is known for its fossils, especially fallen trees that lived in the Late Triassic Period, about 225 million years ago. 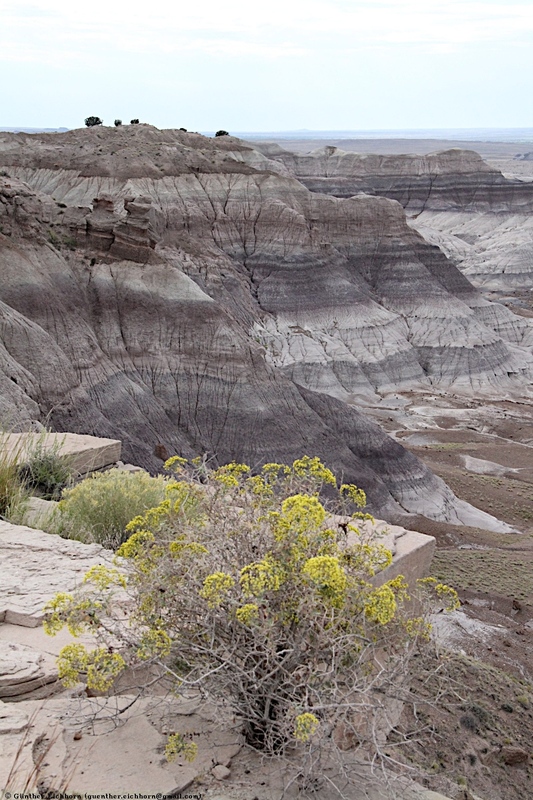 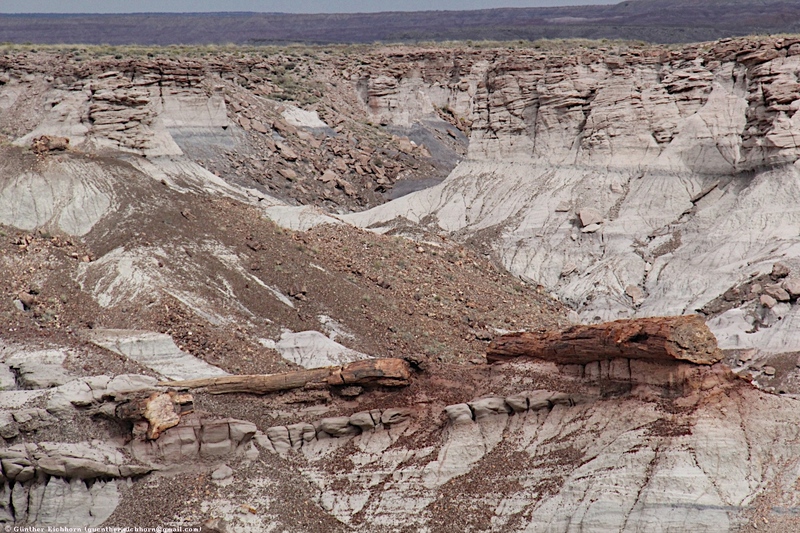 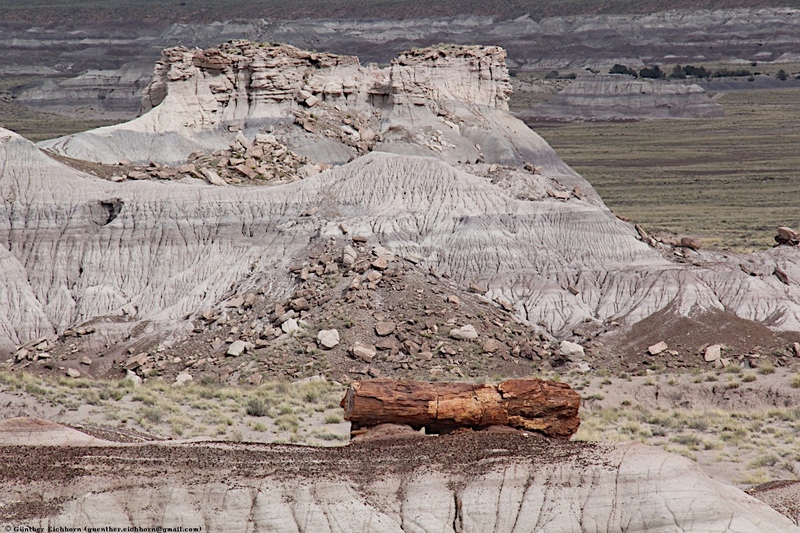 The sediments containing the fossil logs are part of the widespread and colorful Chinle Formation, from which the Painted Desert gets its name. 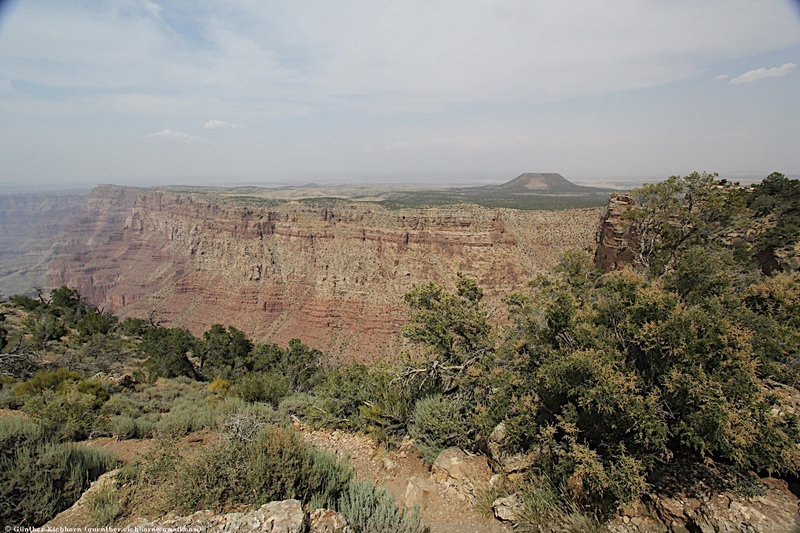 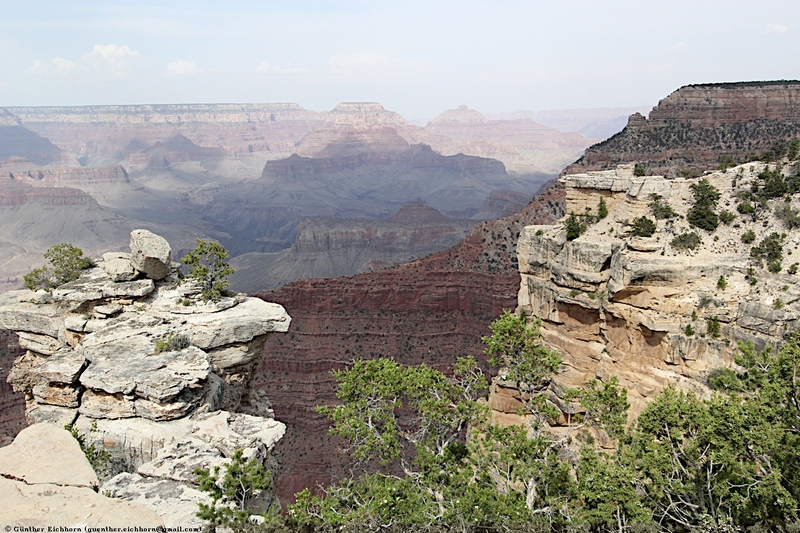 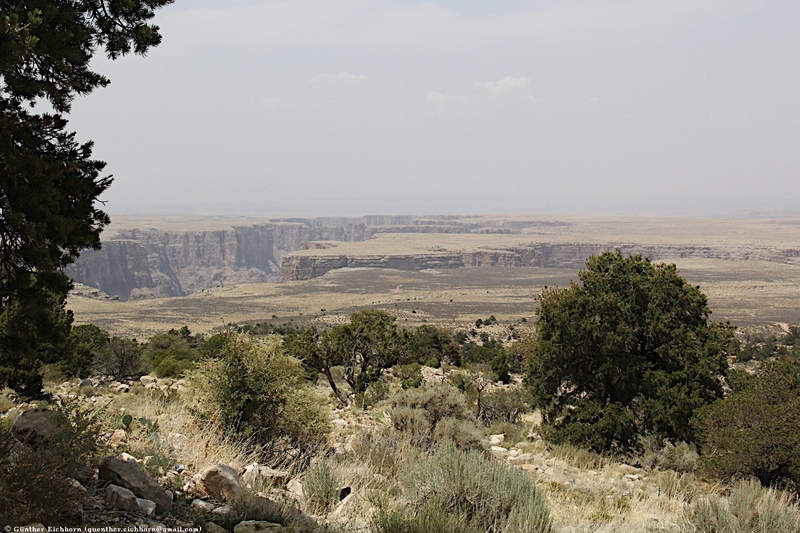 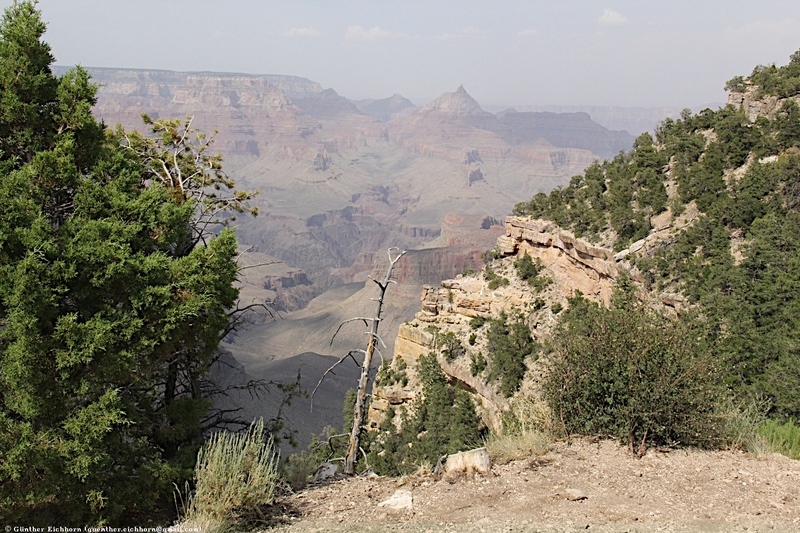 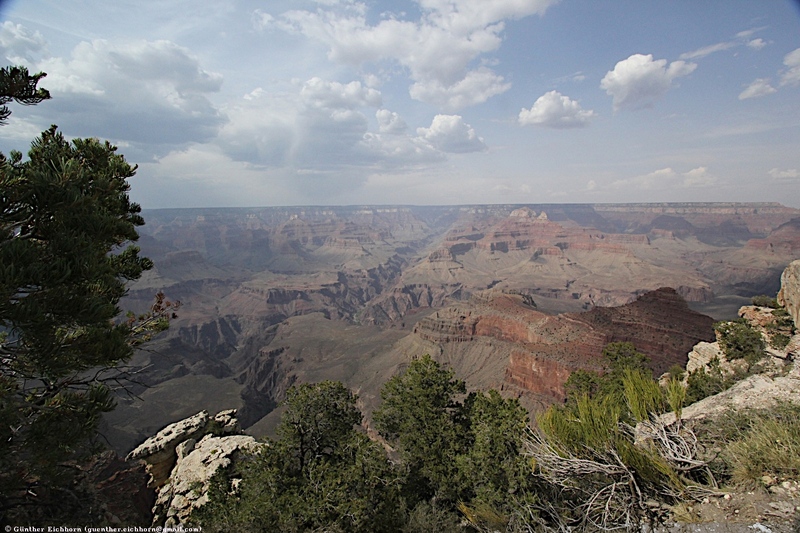 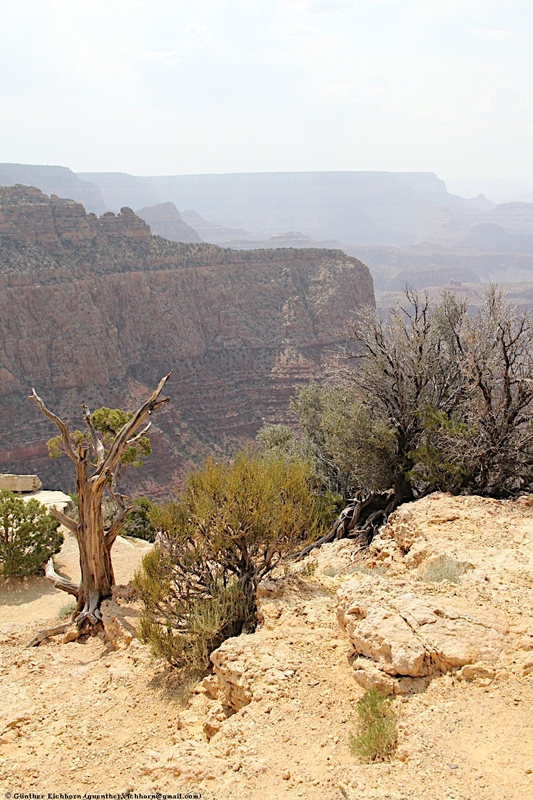 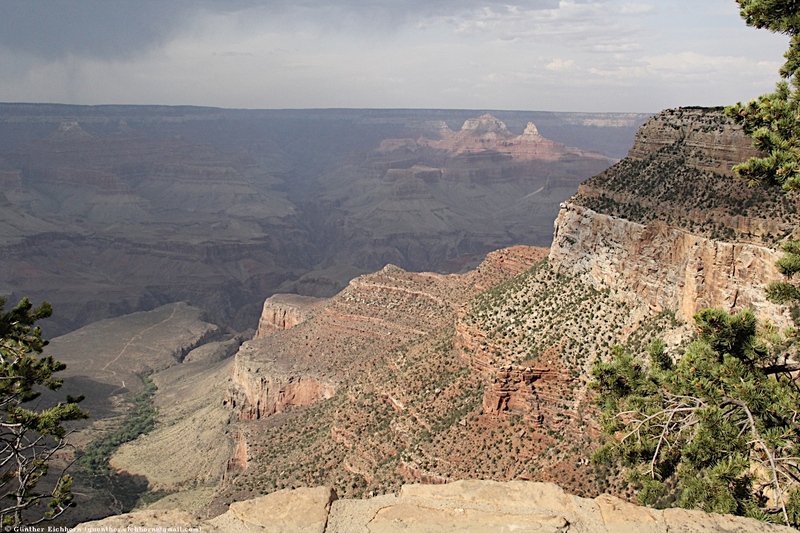 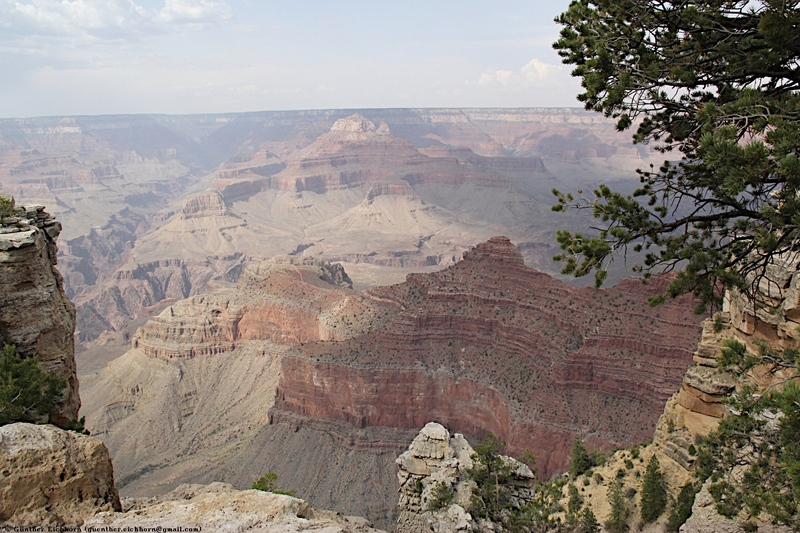 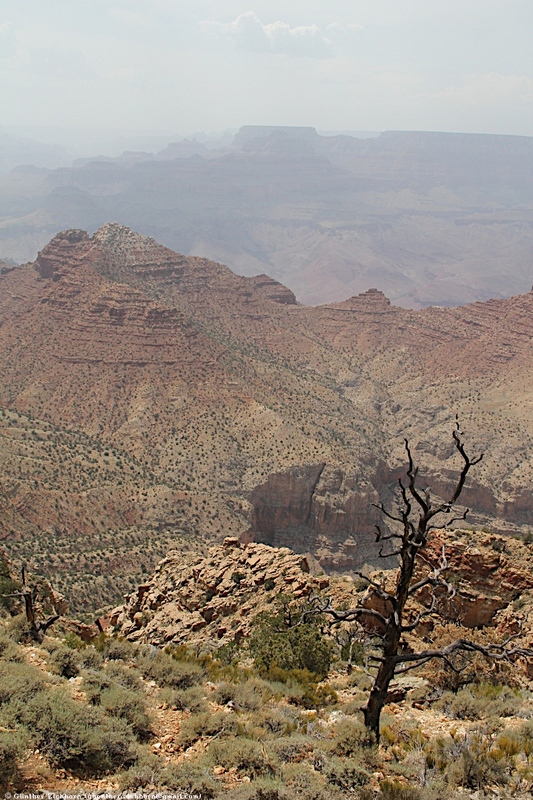 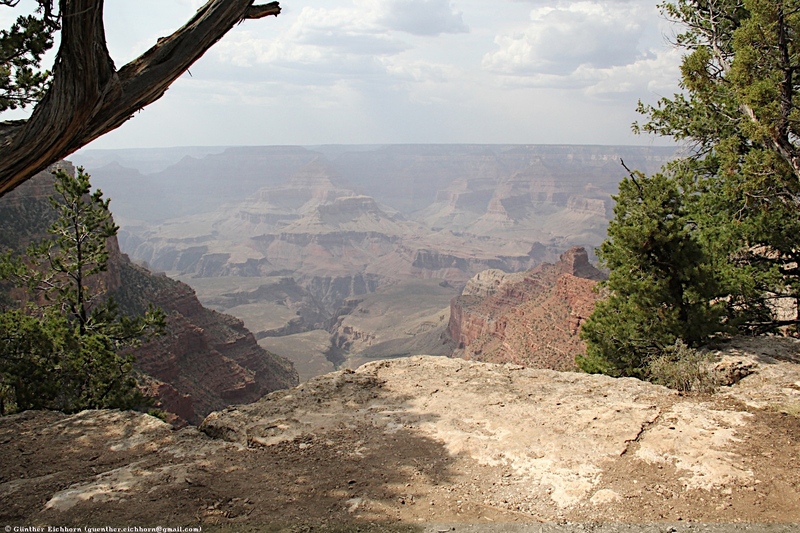 Beginning about 60 million years ago, the Colorado Plateau, of which the park is part, was pushed upward by tectonic forces and exposed to increased erosion. 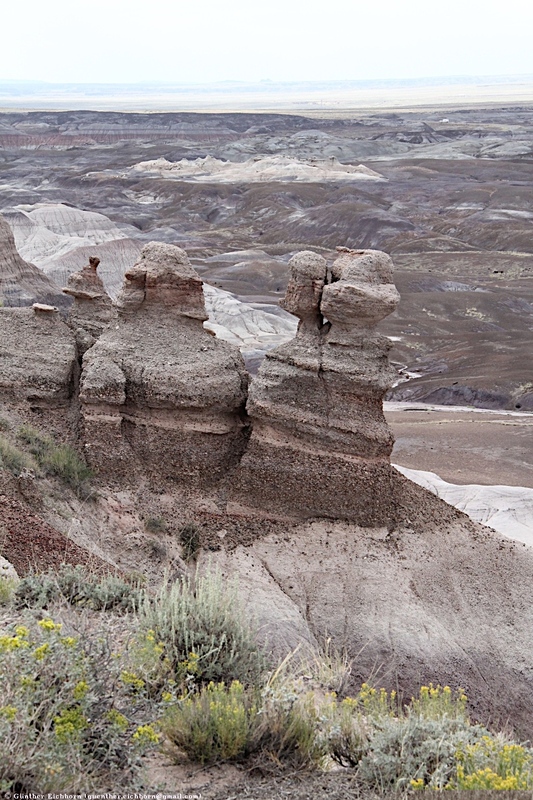 All of the park's rock layers above the Chinle, except geologically recent ones found in parts of the park, have been removed by wind and water. 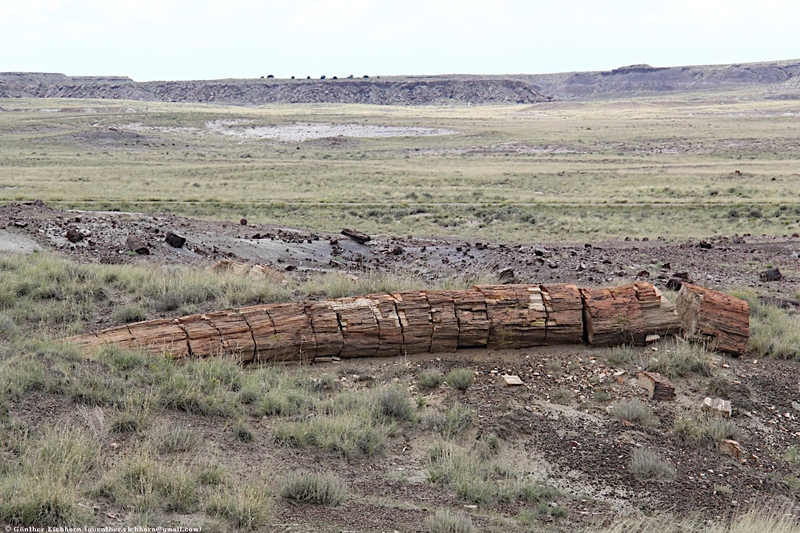 In addition to petrified logs, fossils found in the park have included Late Triassic ferns, cycads, ginkgoes, and many other plants as well as fauna including giant reptiles called phytosaurs, large amphibians, and early dinosaurs. 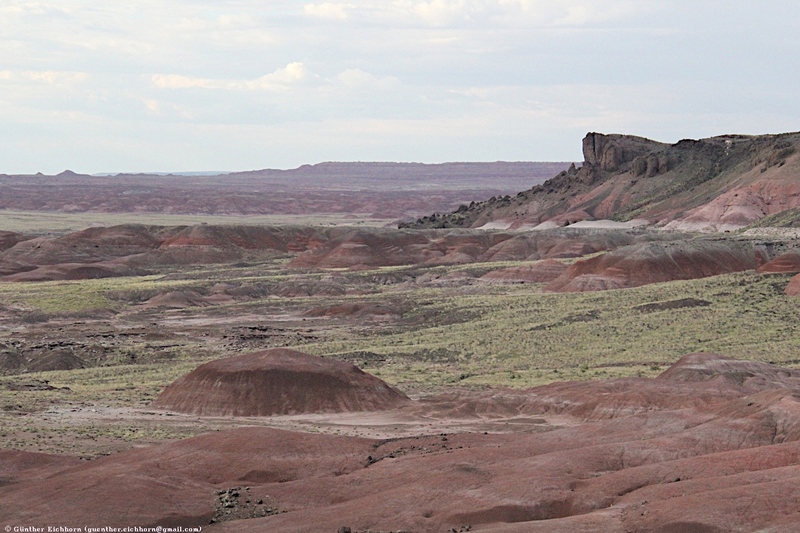 The park's earliest human inhabitants arrived at least 8,000 years ago. 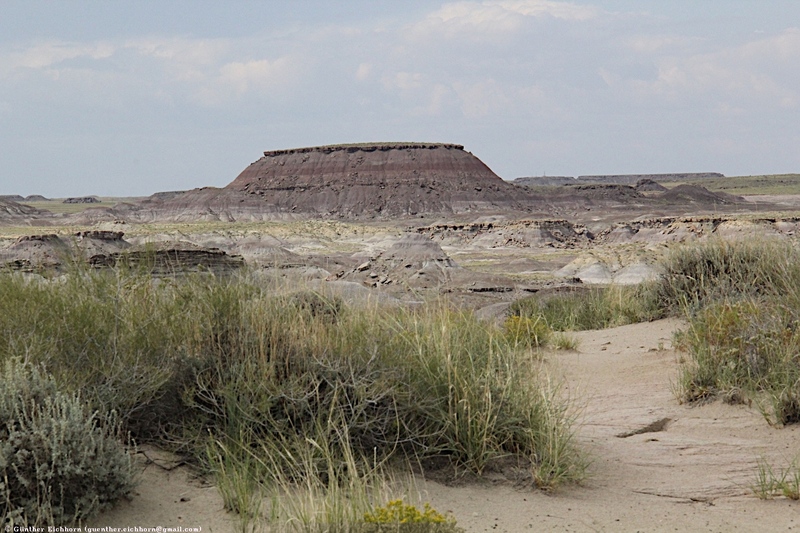 By about 2,000 years ago, they were growing corn in the area and shortly thereafter building pit houses in what would become the park. 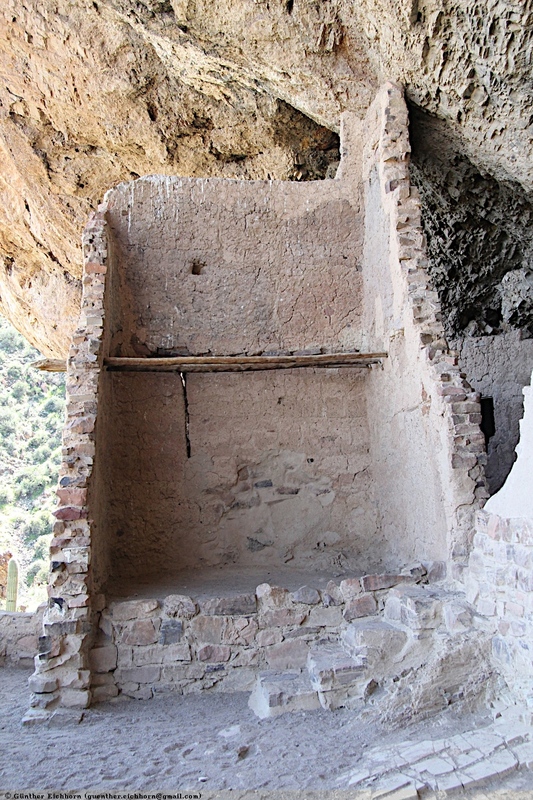 Later inhabitants built above-ground dwellings called pueblos. 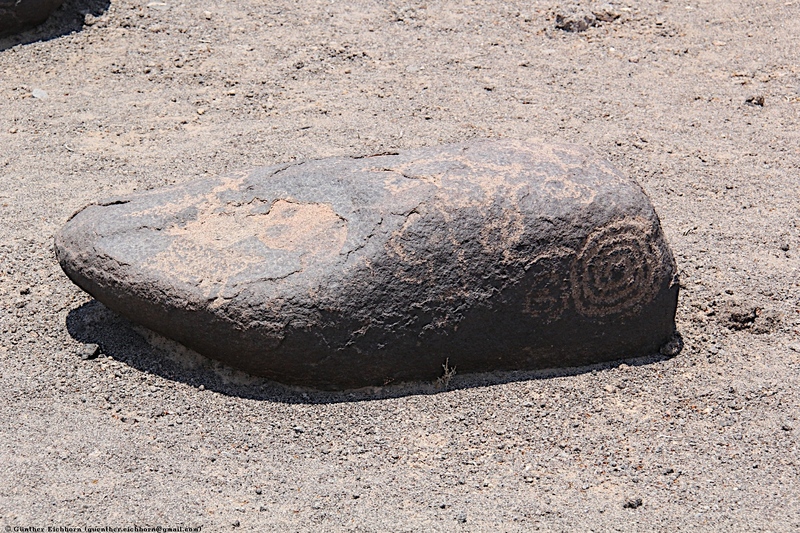 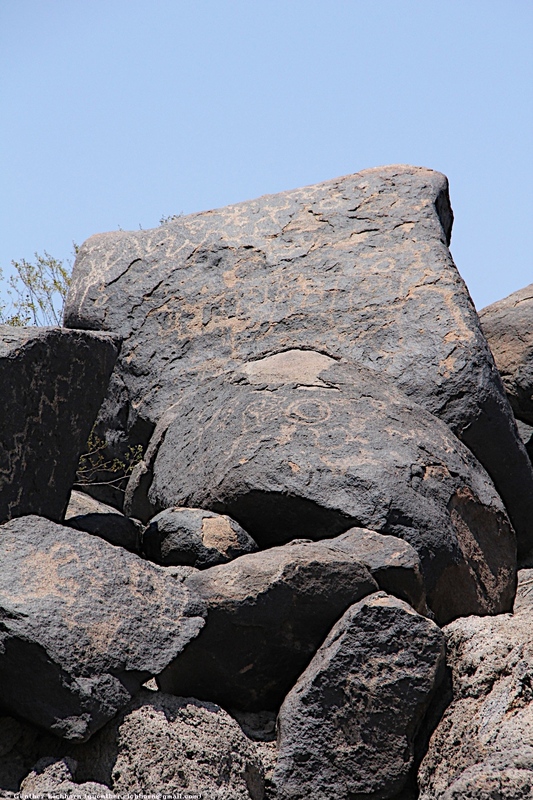 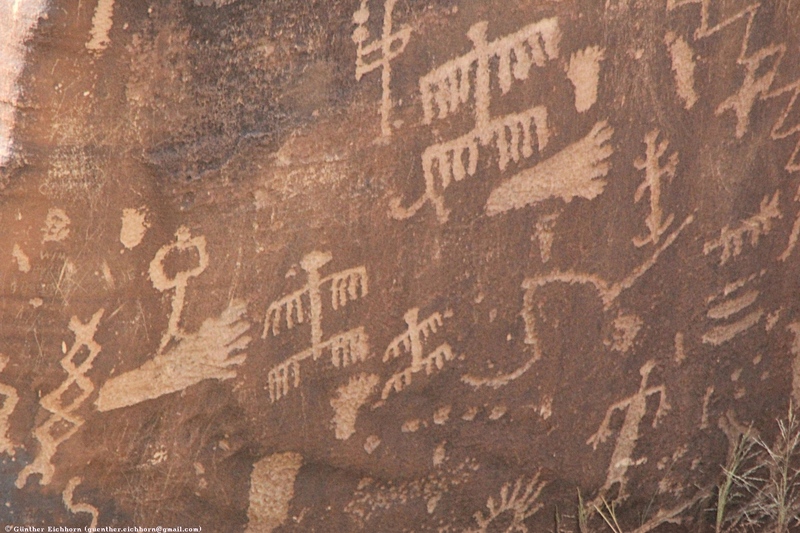 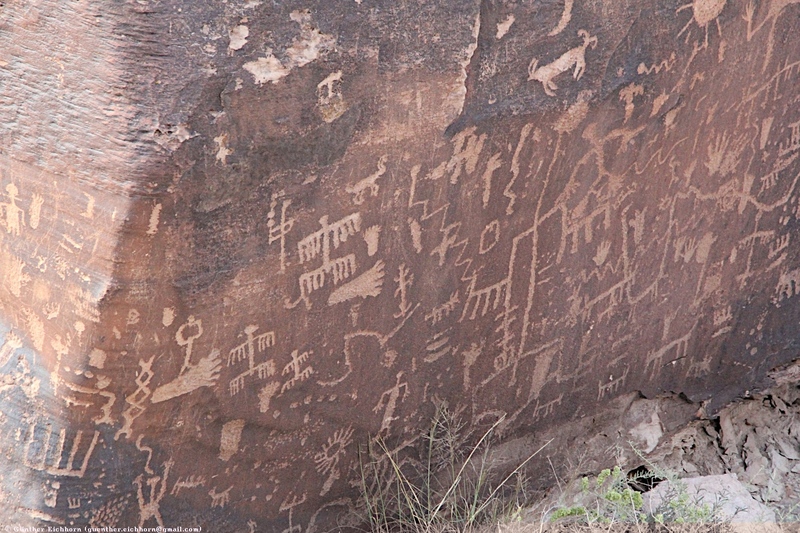 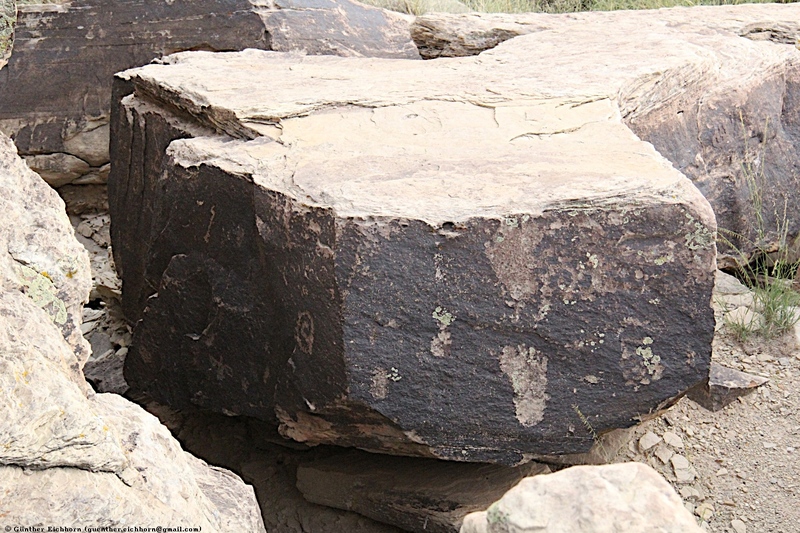 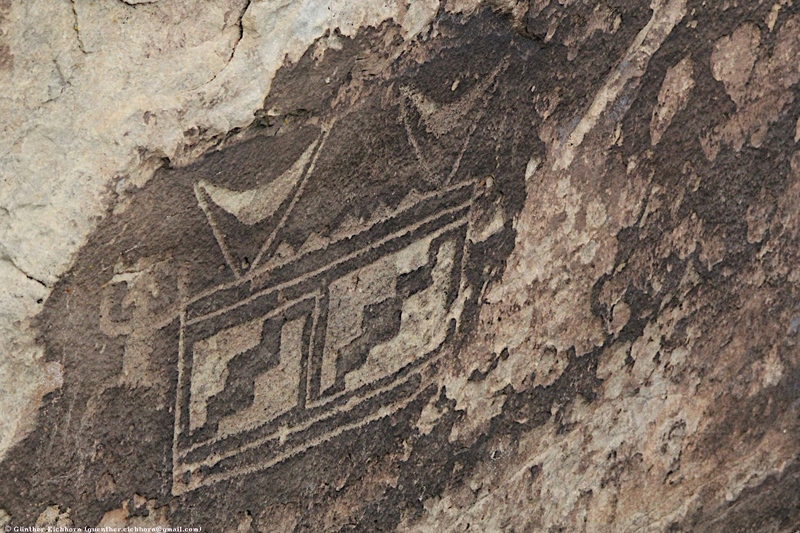 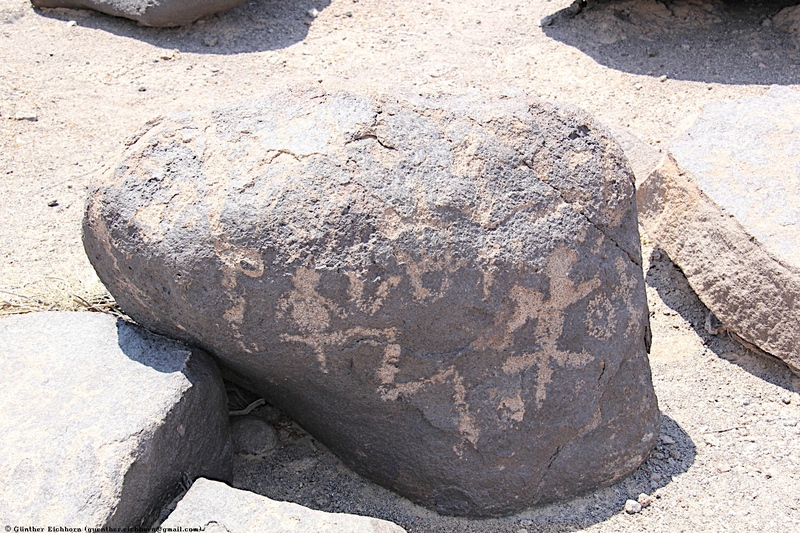 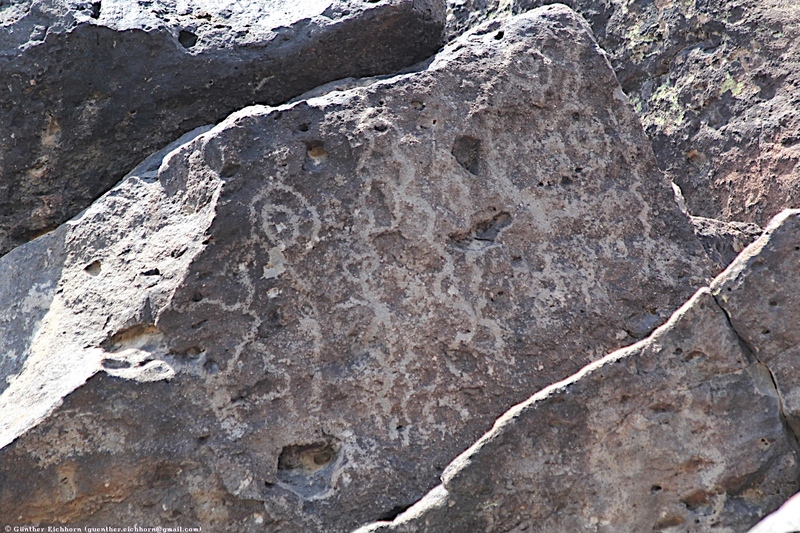 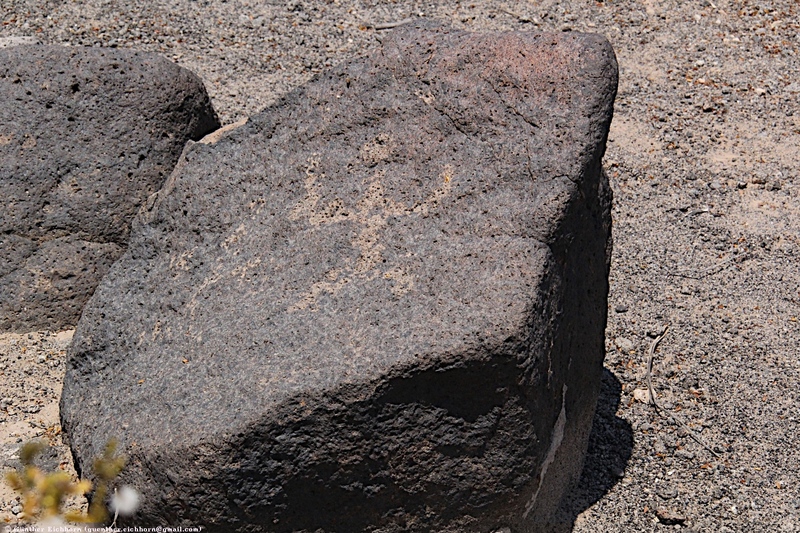 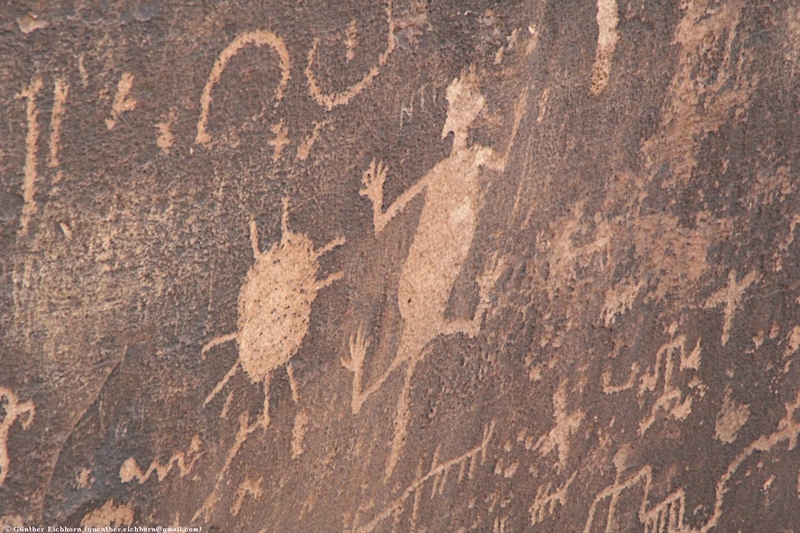 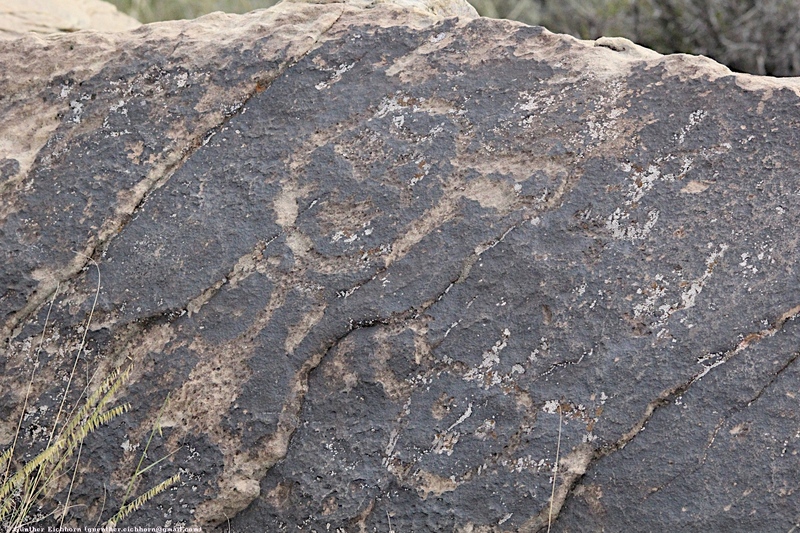 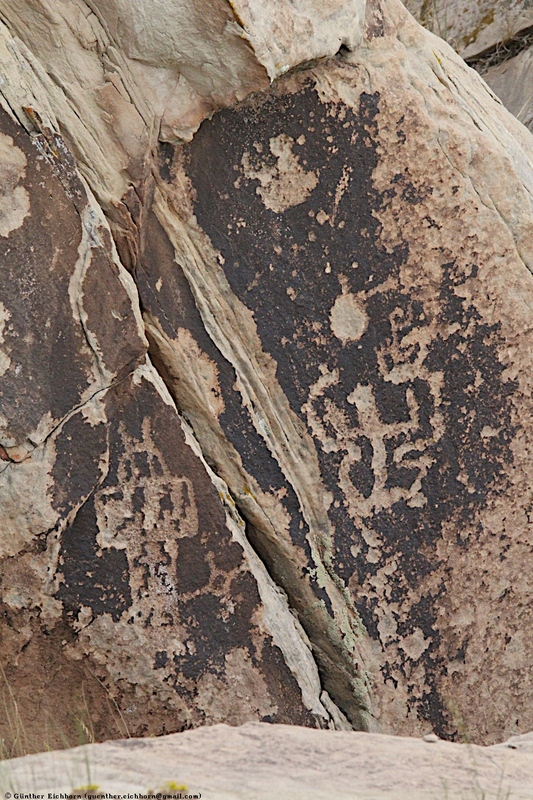 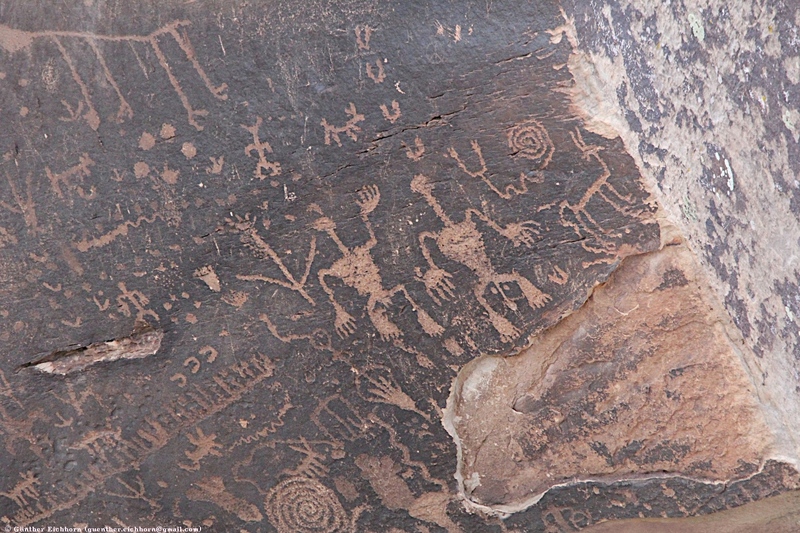 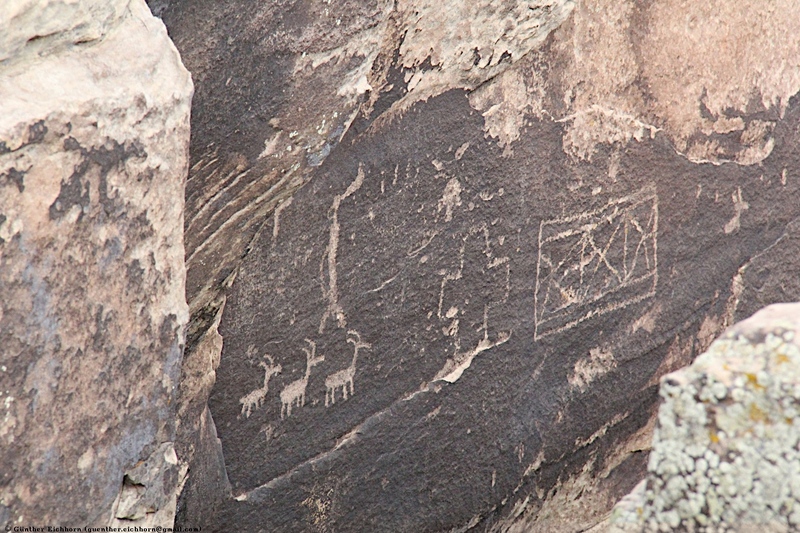 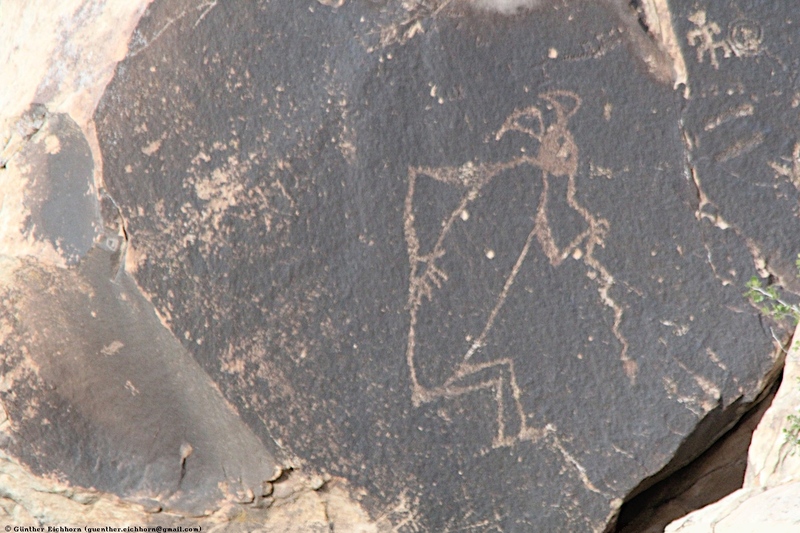 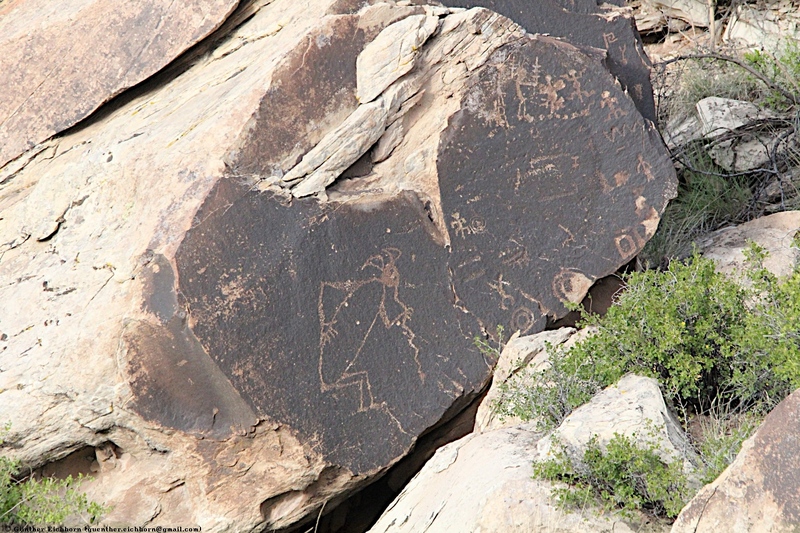 Although a changing climate caused the last of the park's pueblos to be abandoned by about 1400 CE, more than 600 archaeological sites, including petroglyphs, have been discovered in the park. 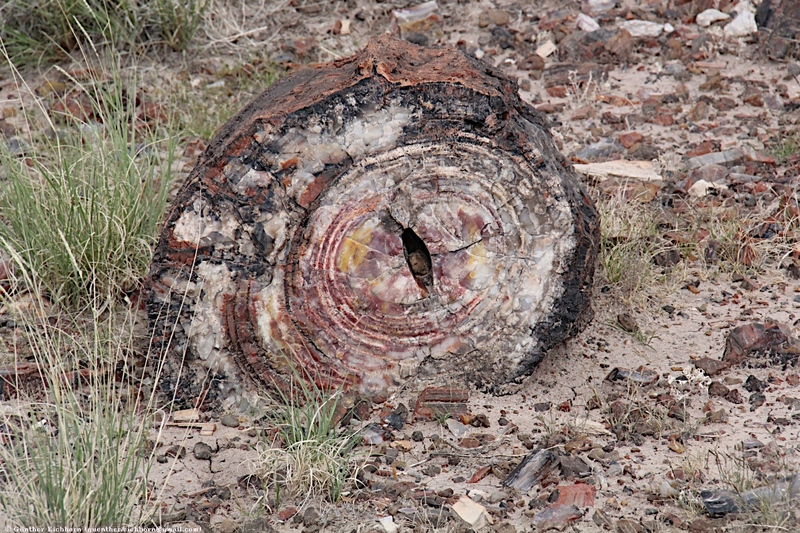 In the 16th century, Spanish explorers visited the area, and by the mid-19th century a U.S. team had surveyed an east–west route through the area where the park is now located and noted the petrified wood. 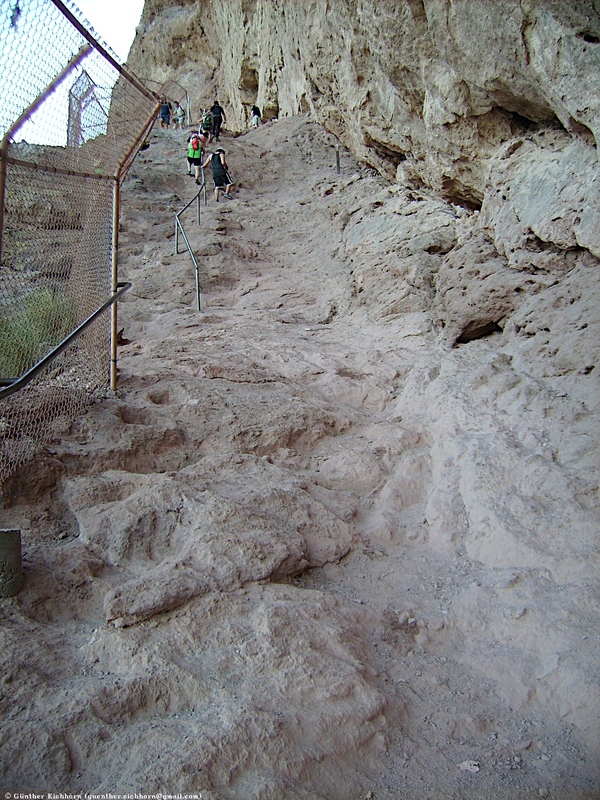 Later, roads and a railway followed similar routes and gave rise to tourism and, before the park was protected, to large-scale removal of fossils. 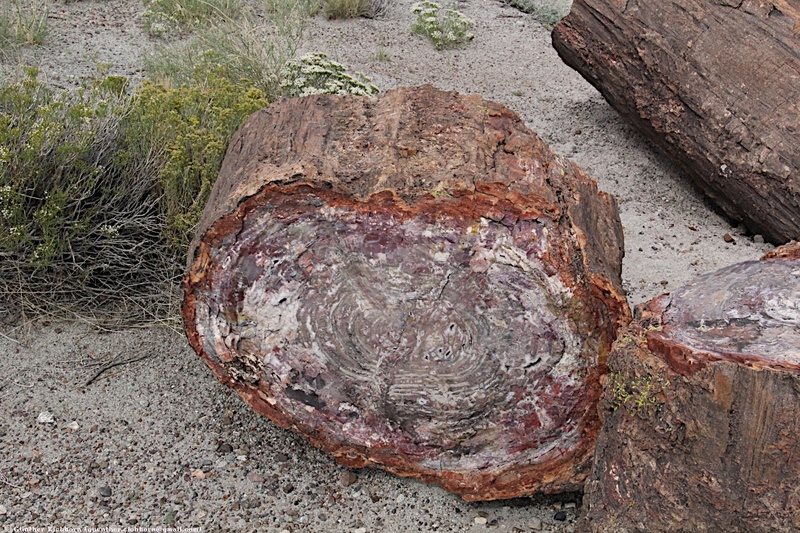 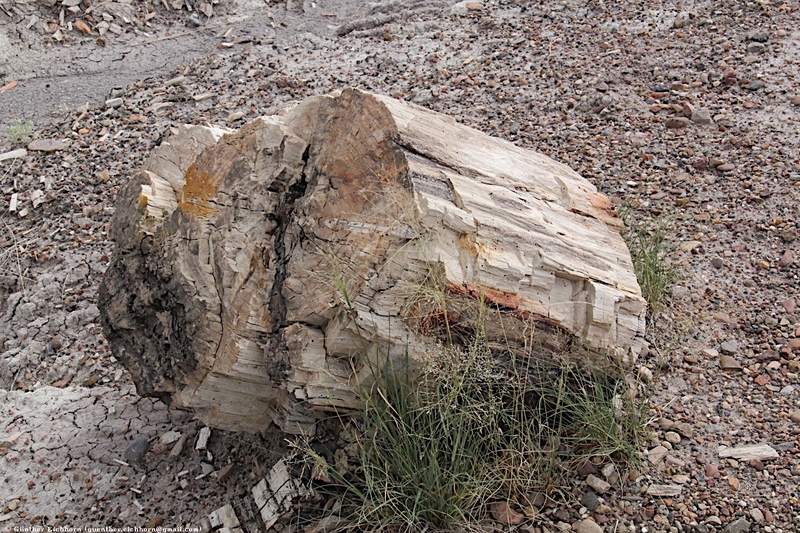 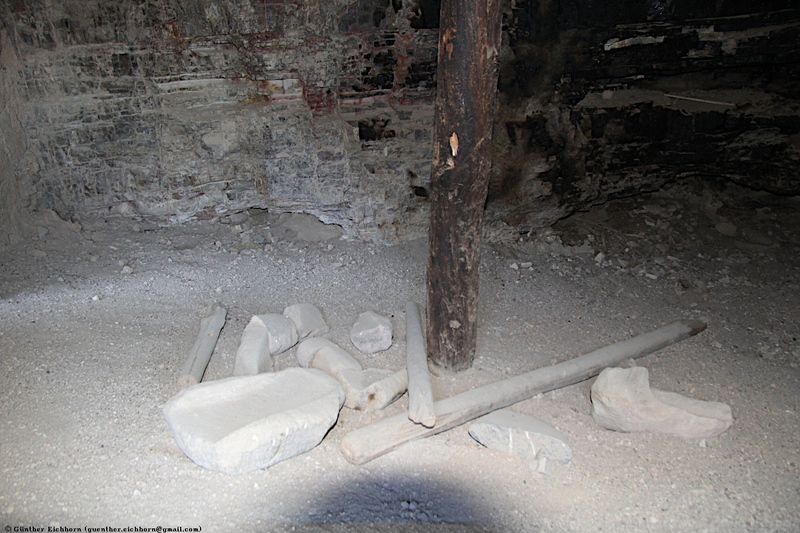 Theft of petrified wood remains a problem in the 21st century. 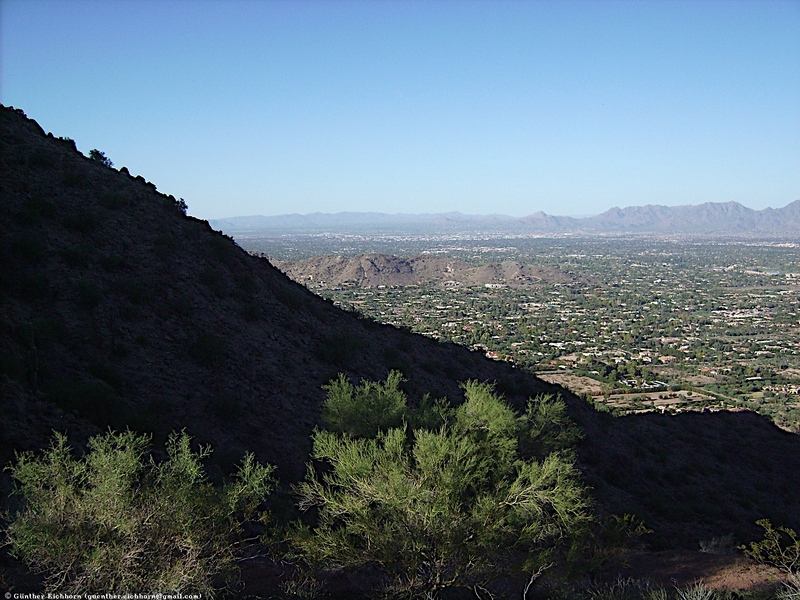 Camelback Mountain is right next to downtown Scottsdale, between the Arcadia neighborhood of Phoenix and the town of Paradise Valley. 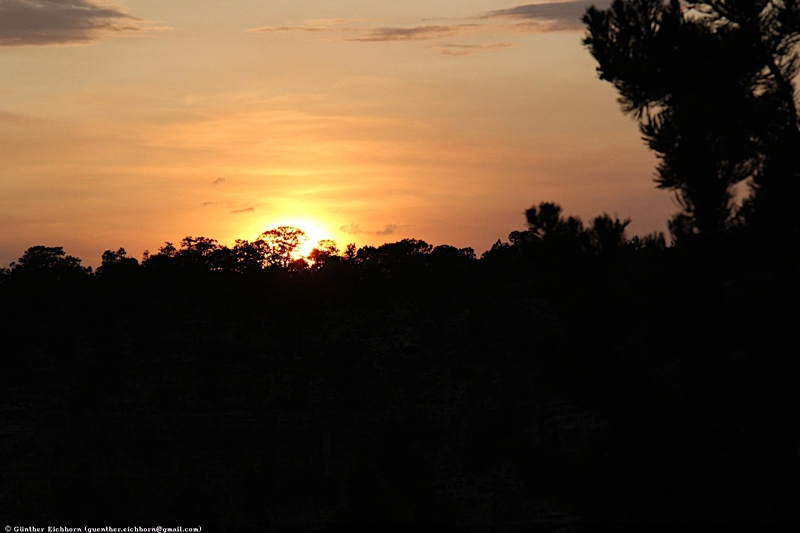 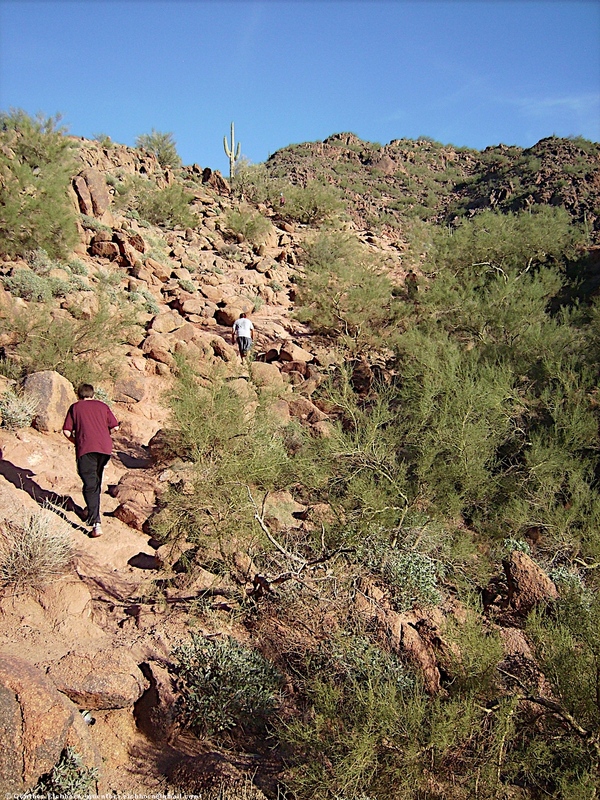 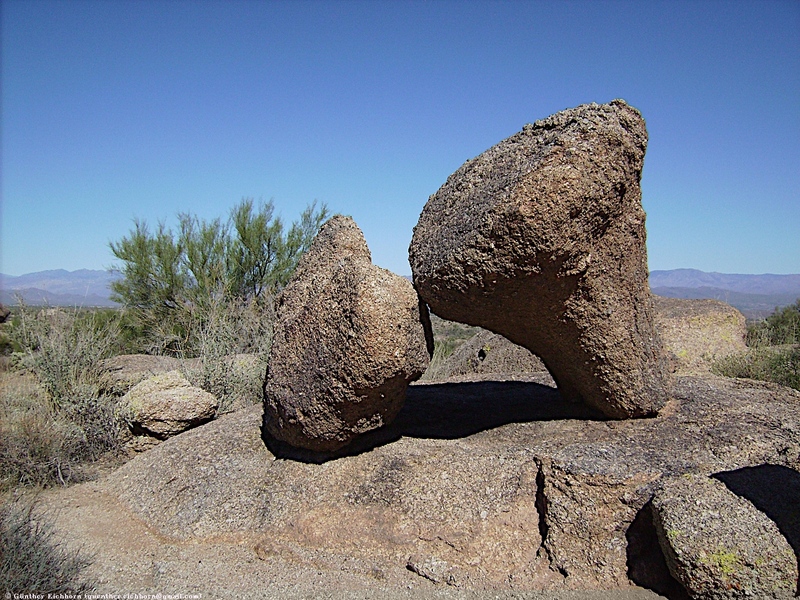 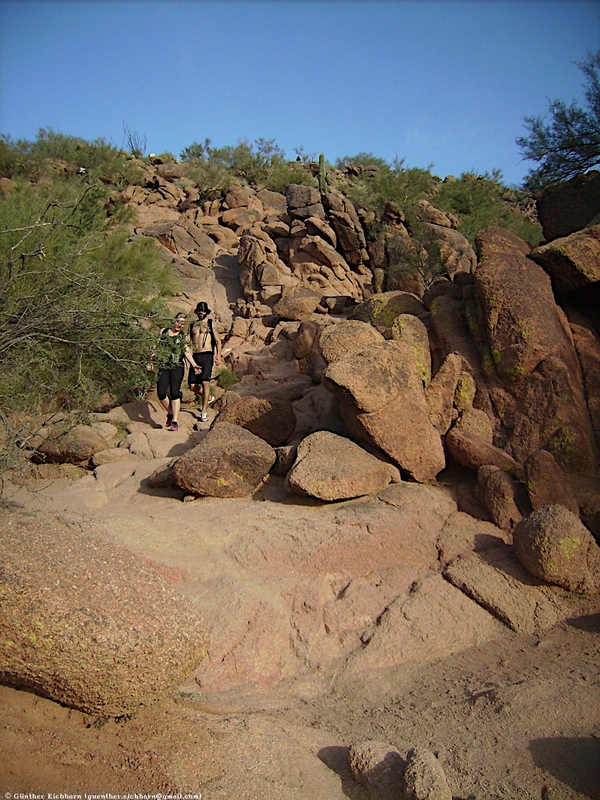 It has two great hiking trails, the Cholla Trail and the Echo Trail, to hike up the mountain. 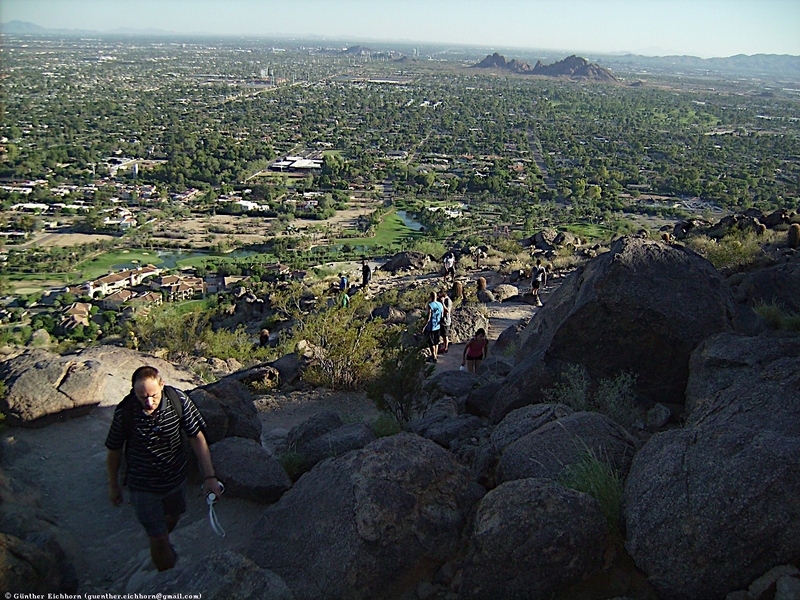 The view from the top over Phoenix, Paradise Valley, and Scottsdale is worth the trip every time. 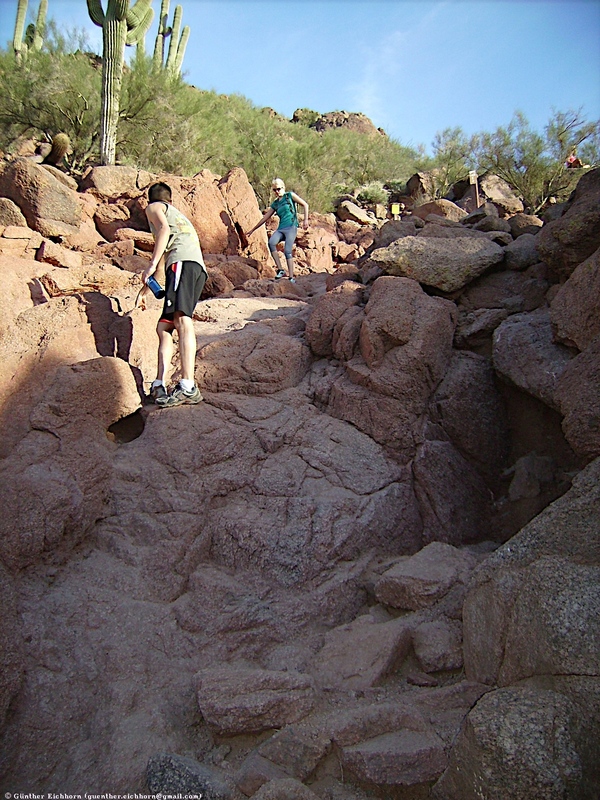 Hiking Camelback is an exercise that is really fun, not as boring as running on a treadmill or jogging through traffic. 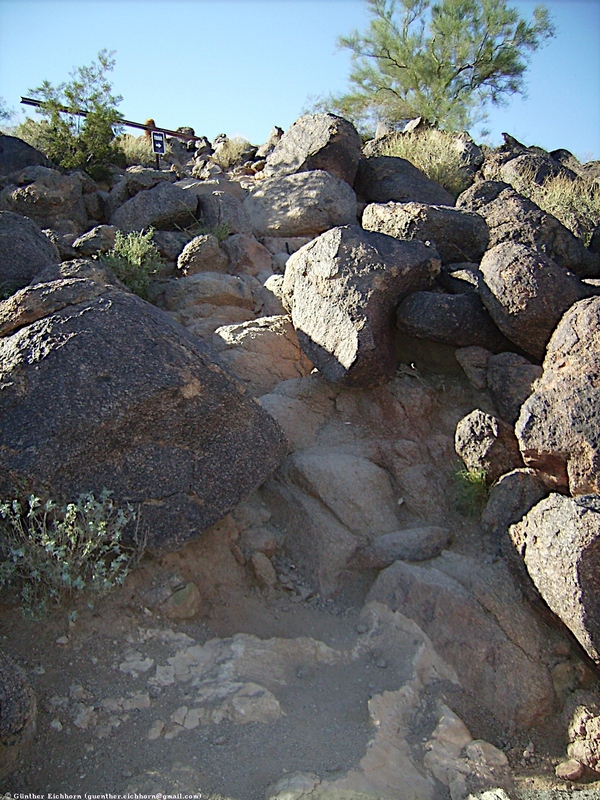 The Cholla trail is steep and rocky in parts. 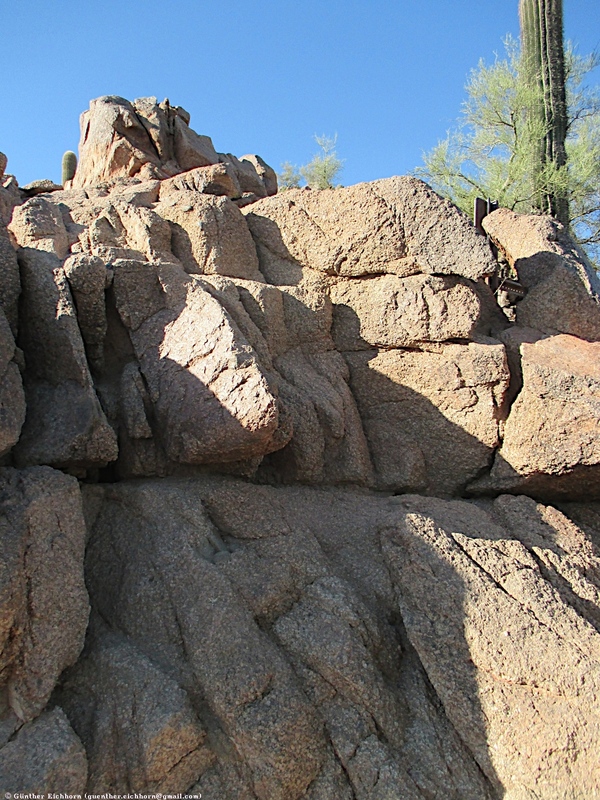 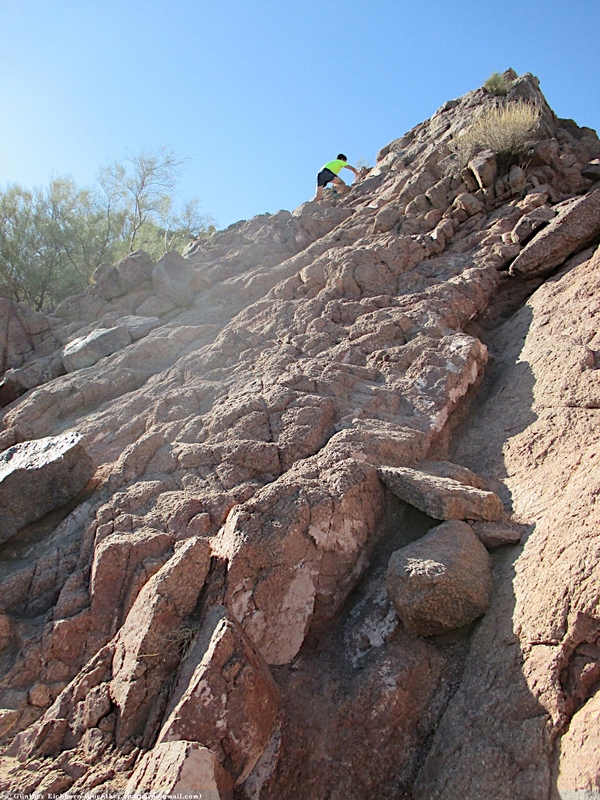 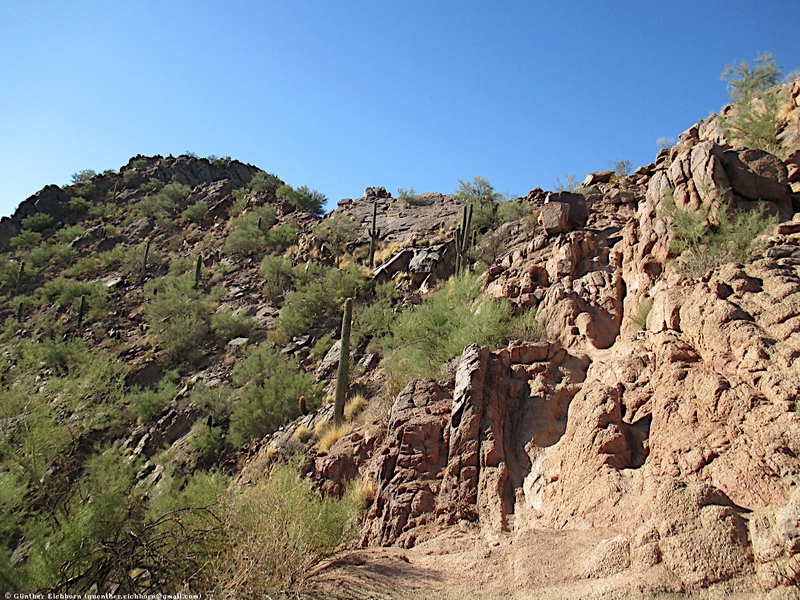 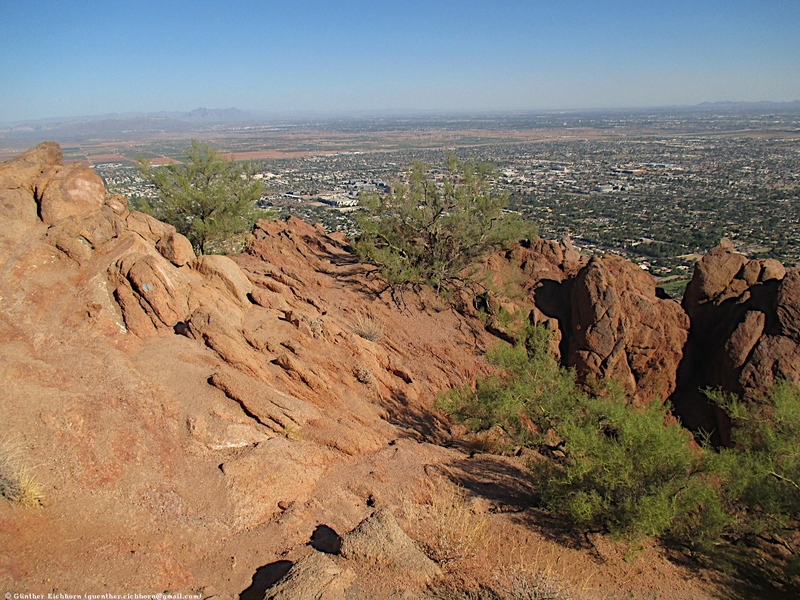 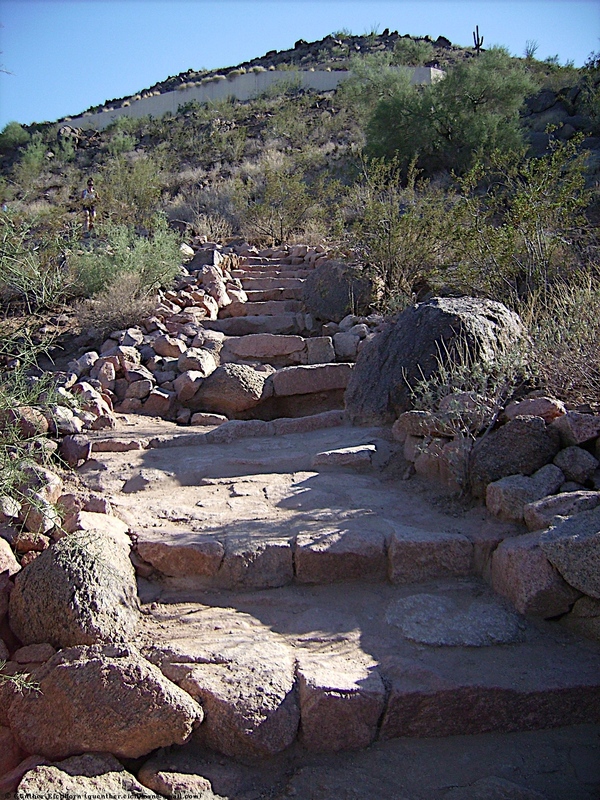 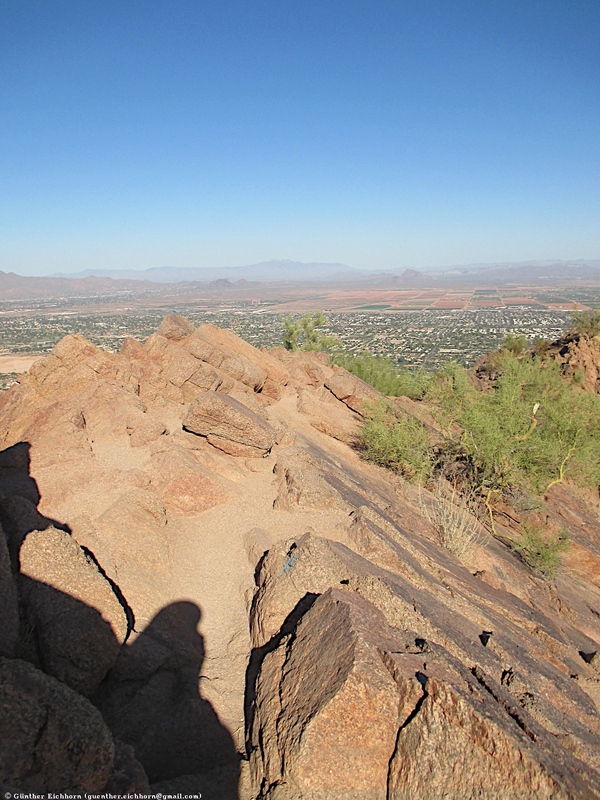 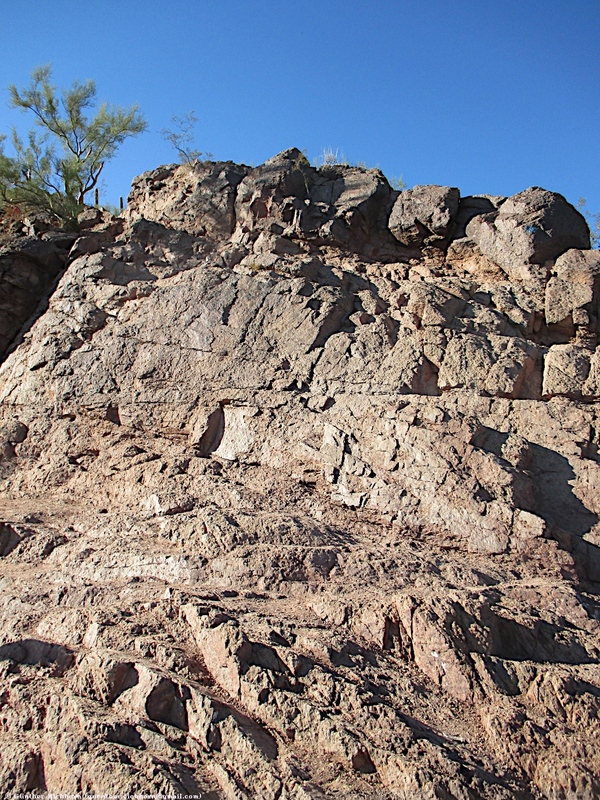 It starts on the east side of Camelback Mountain at about 1,450 ft (442 m) altitude. 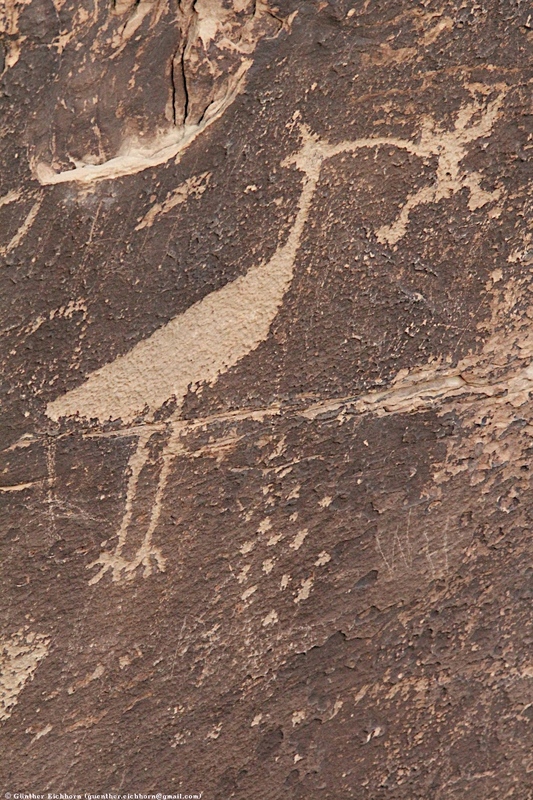 It climbs up the hind quarter of the camel to the "saddle", with the helipad. 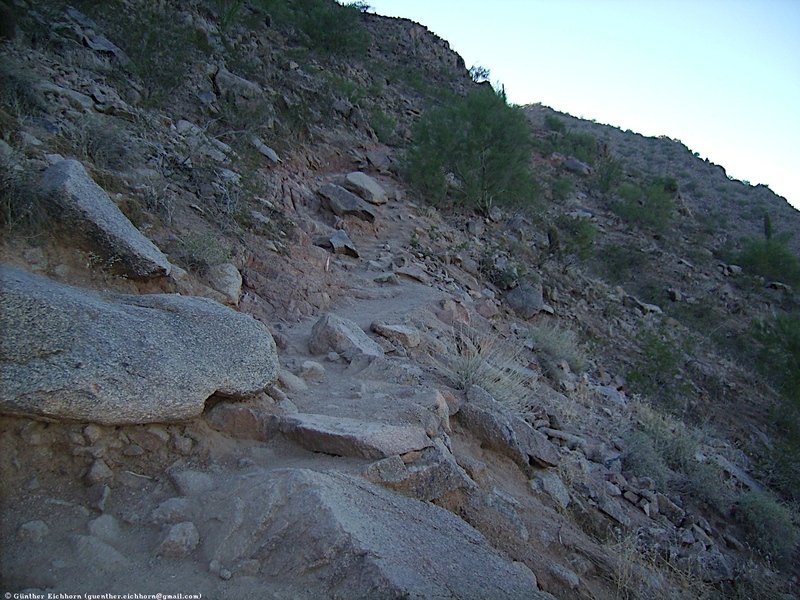 From there it gets much steeper for the last part up to the summit on the hump of the camel at 2,704 ft (824 m). 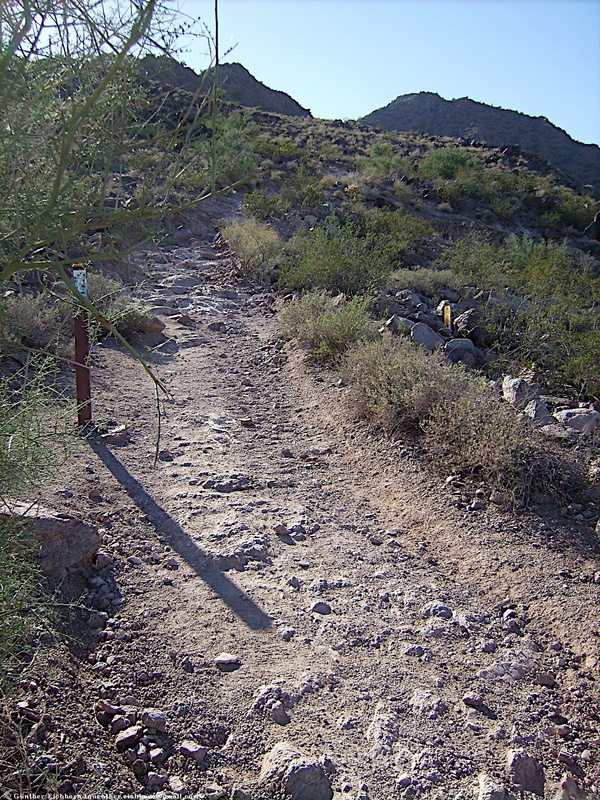 The Cholla trail is about 2.3 km (1.4 miles) long. 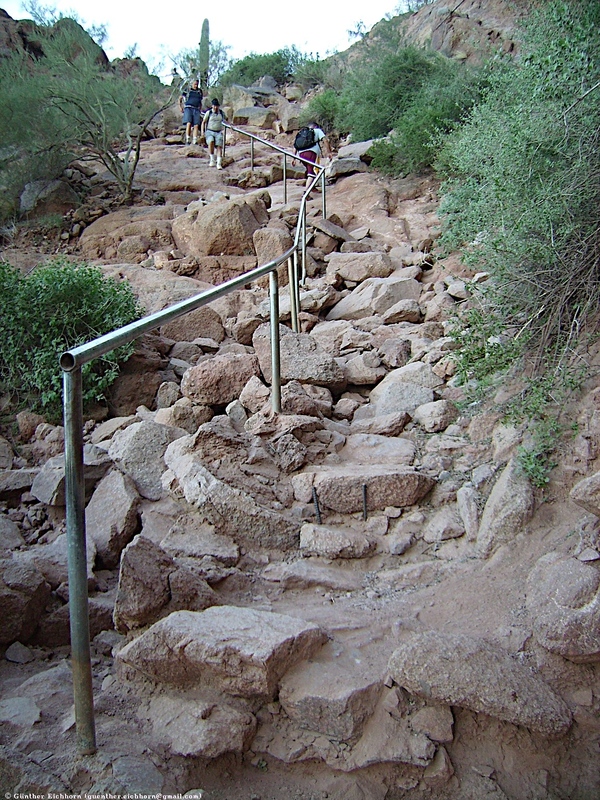 It takes me 35-50 minutes to get to the top. 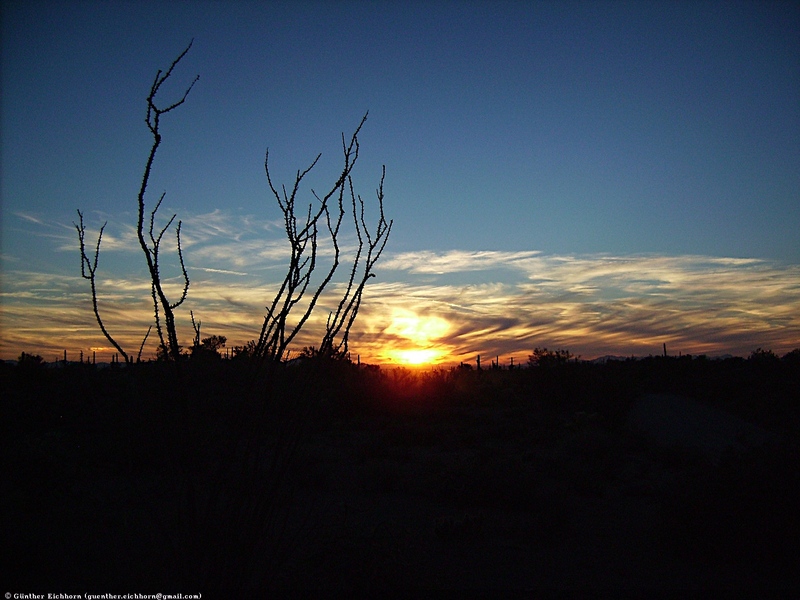 It sure gets the old ticker going . 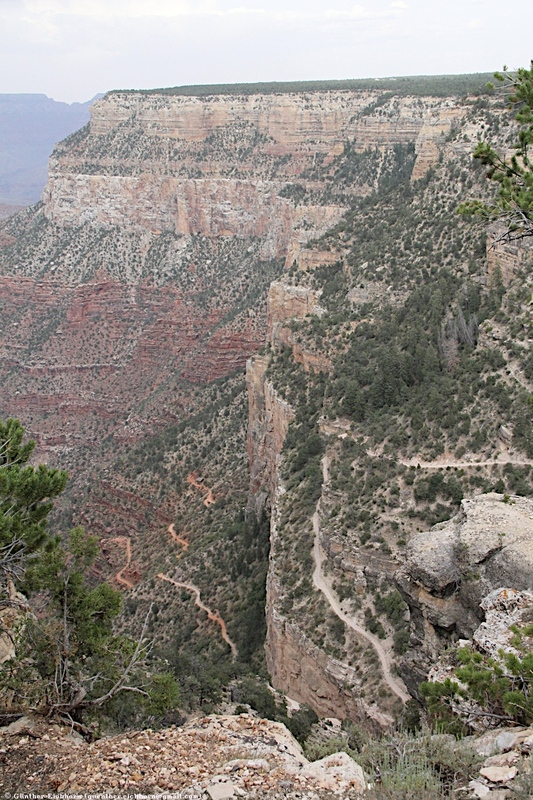 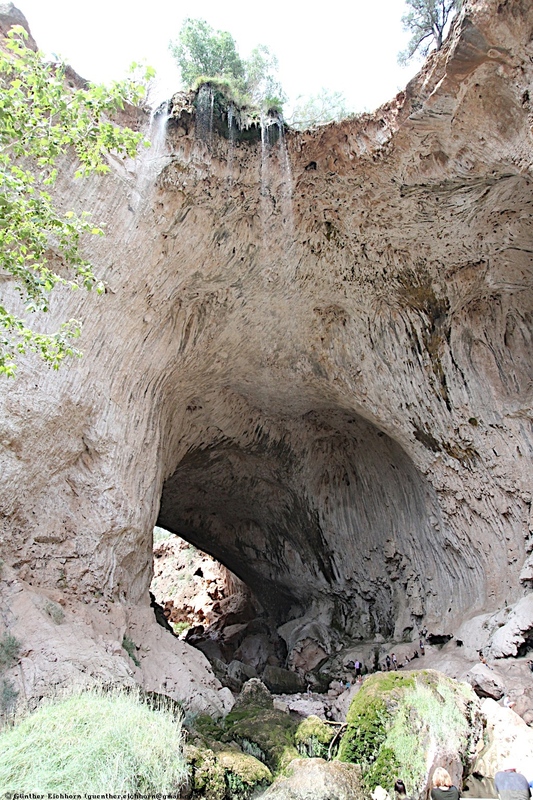 The Echo Canyon Trail is 1.9 km (1.2 miles) long. 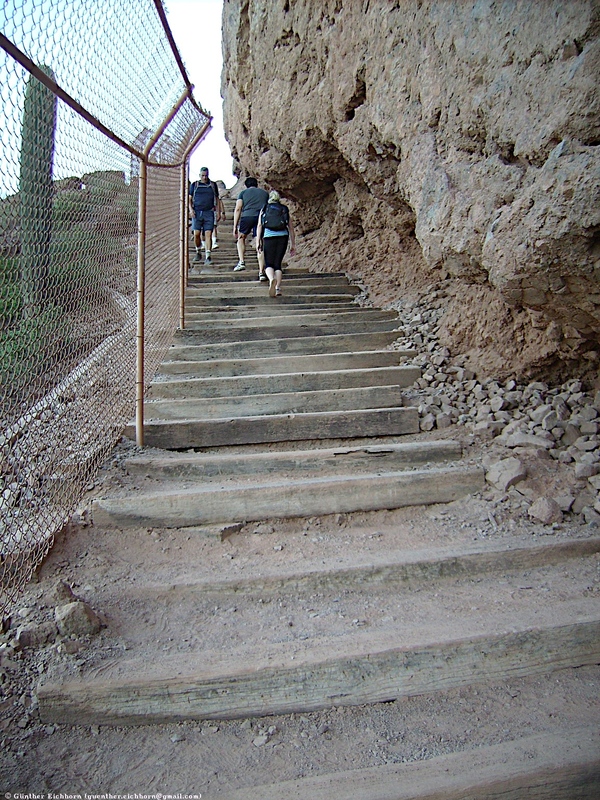 It takes me 35-50 minutes to the top. 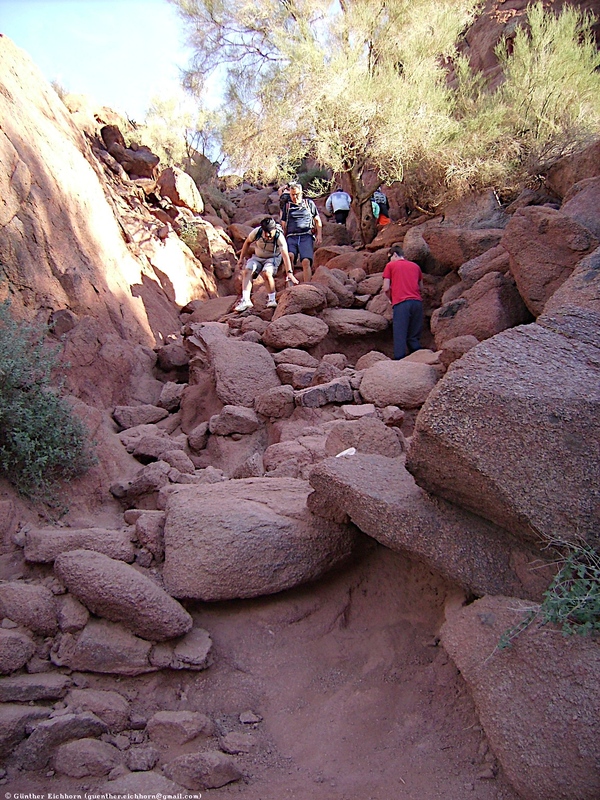 It is an extremely difficult hike, steep, with lots of climbing over boulders. 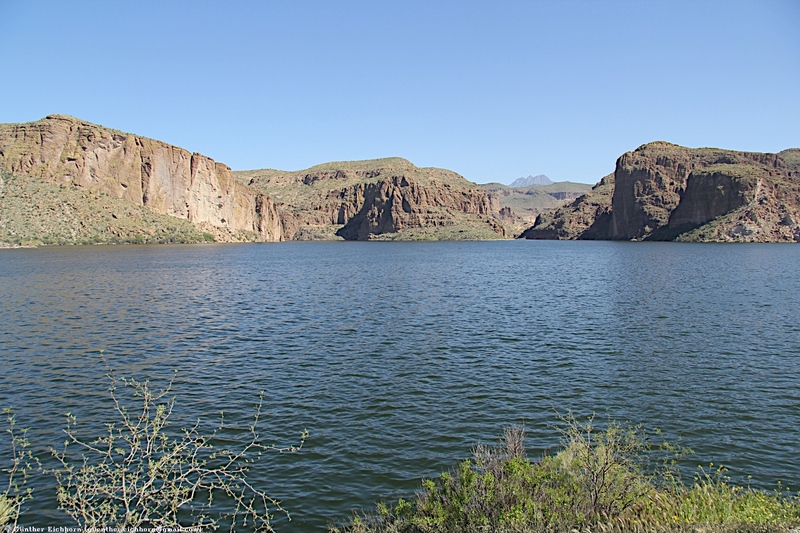 Be sure you have plenty of water with you, especially in the summer. 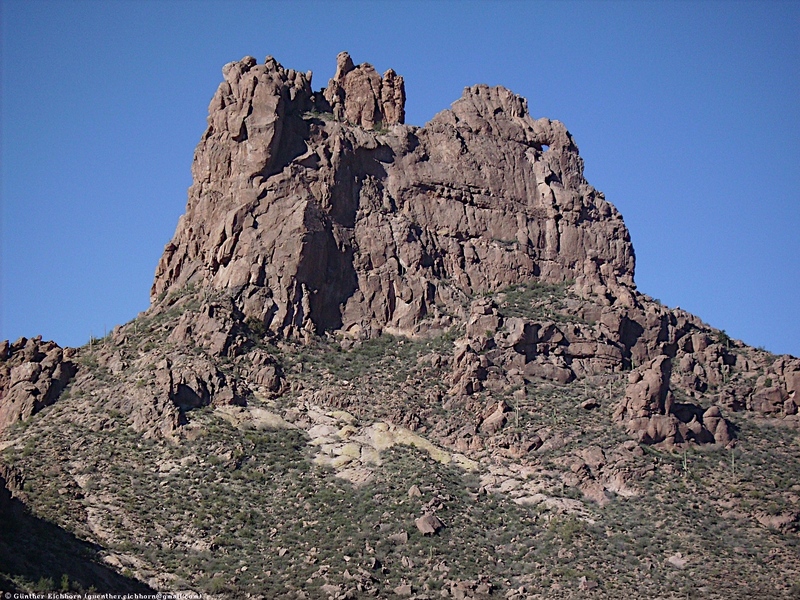 The Superstition Mountains, popularly called "The Superstitions," is a range of mountains in Arizona located to the east of the Phoenix metropolitan area. 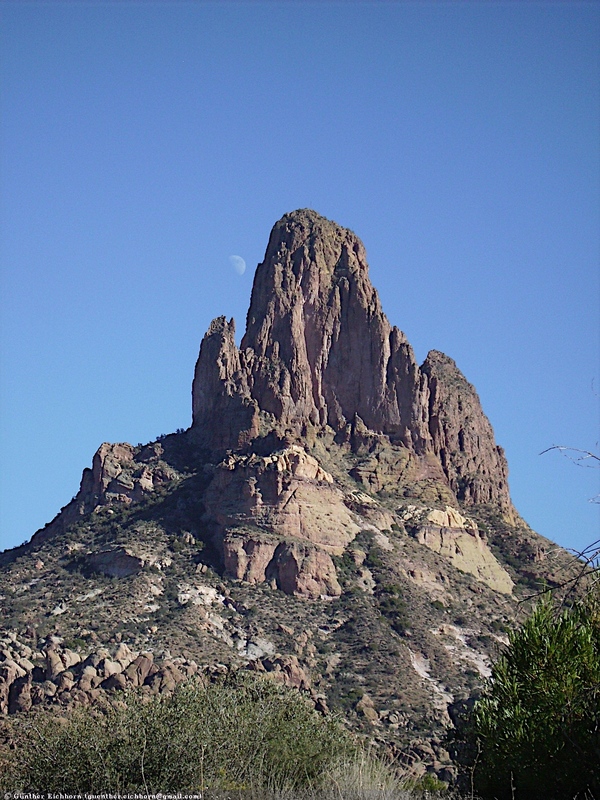 They are anchored by Superstition Mountain, a large mountain that is a popular recreation destination for residents of the Phoenix, Arizona area. 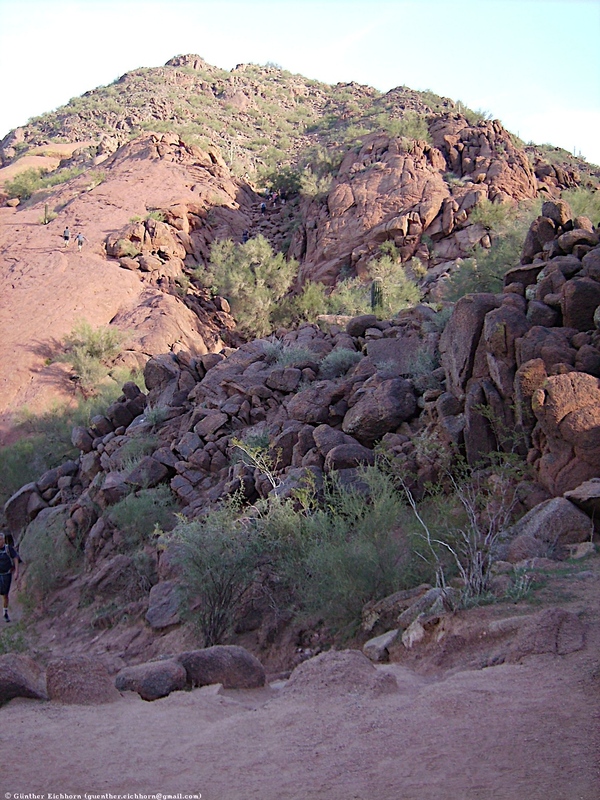 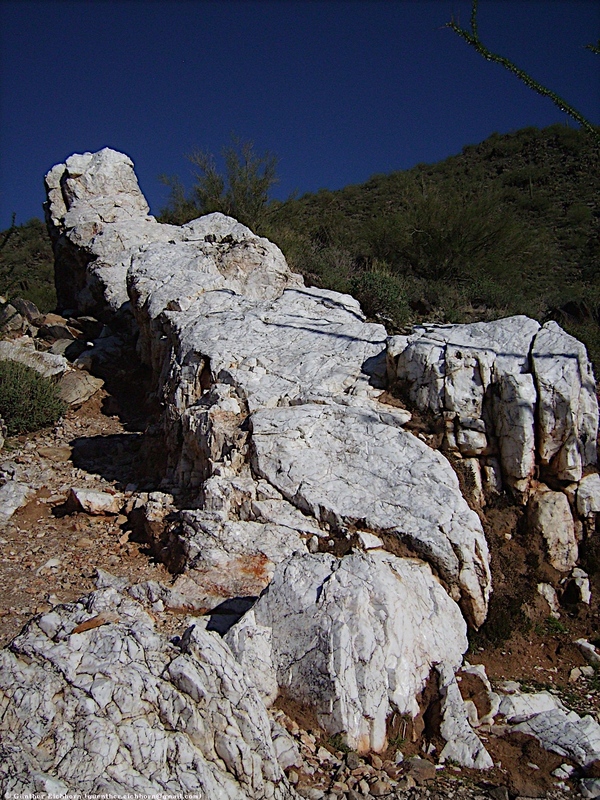 The mountain range is in the federally designated Superstition Wilderness Area, and includes a variety of natural features in addition to its namesake mountain. 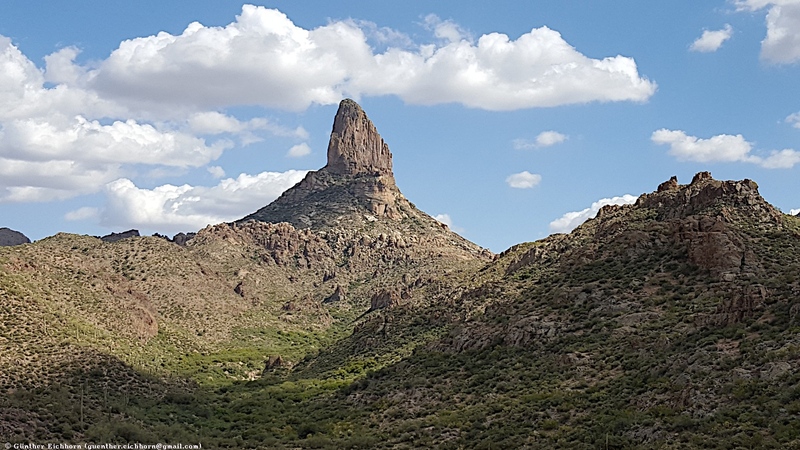 Weavers Needle, a prominent landmark and rock climbing destination set behind and to the east of Superstition Mountain, is a tall eroded volcanic remnant that plays a significant role in the legend of the Lost Dutchman's Gold Mine. 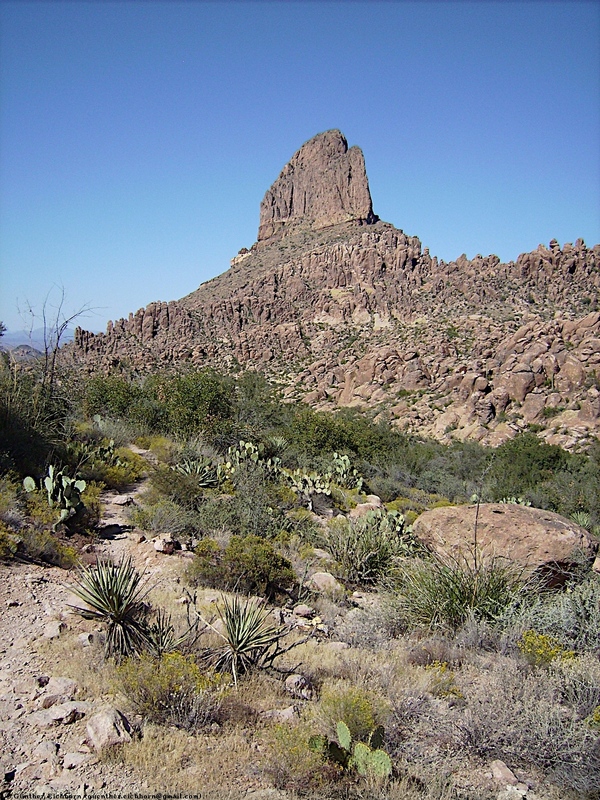 Peralta Canyon, on the northeast side of Superstition Mountain, contains a popular trail that leads up to Fremont Saddle, which provides a very picturesque view of Weavers Needle. 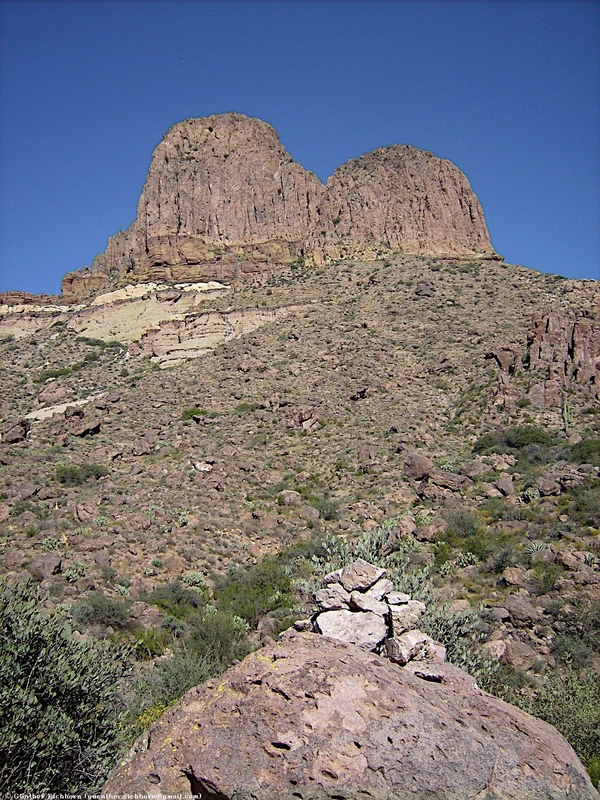 Miner's Needle is another prominent formation in the wilderness and a popular hiking destination. 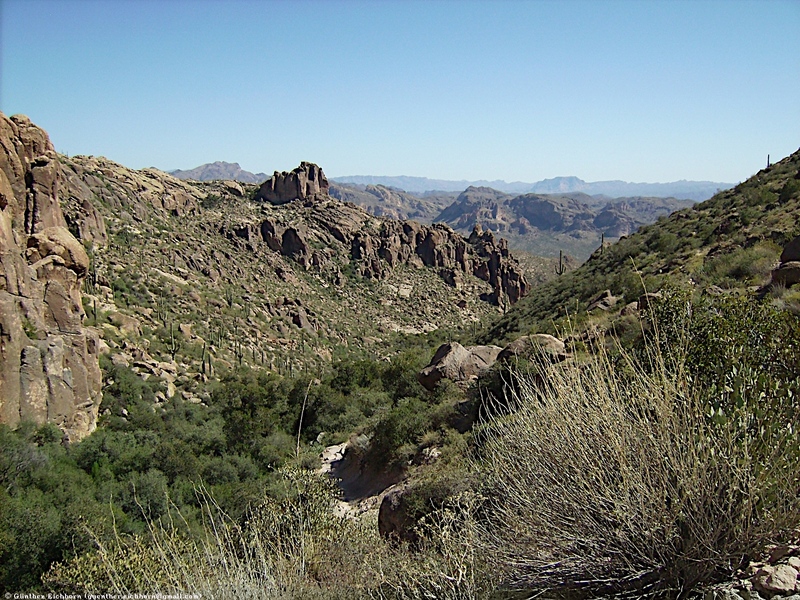 As with most of the terrain surrounding the Phoenix metropolitan area, the Superstition Mountains have a desert climate, with high summer temperatures and a handful of perennial sources of water. 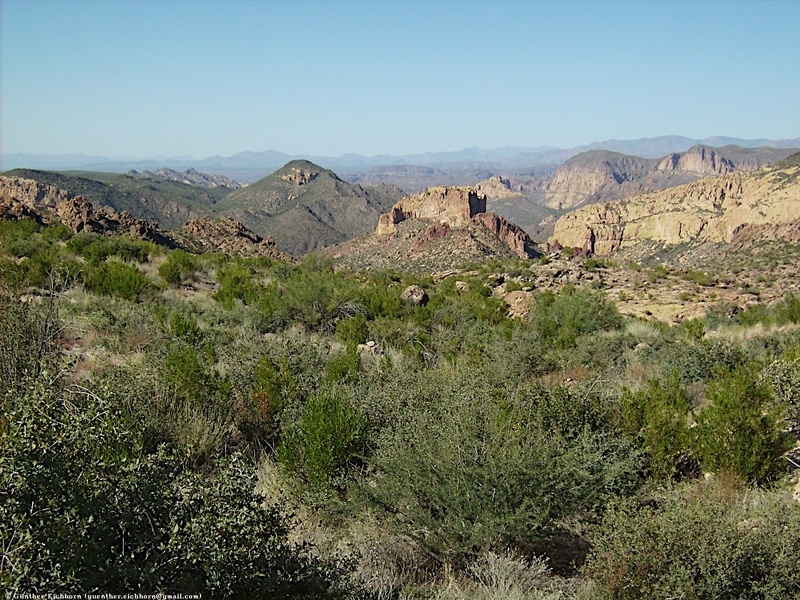 The elevation in the more remote, eastern portion of the wilderness is higher than the western portion, which lowers temperatures slightly. 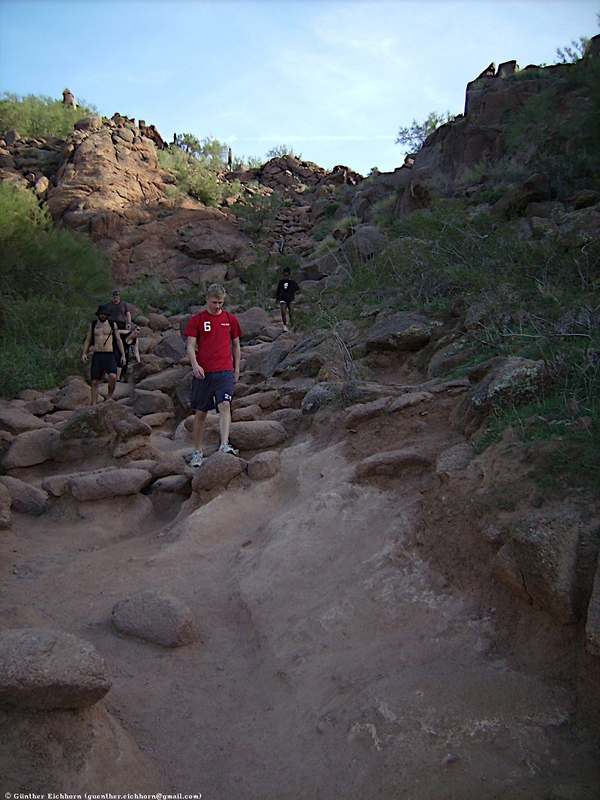 Numerous hiking trails cross the mountains from multiple access points, including the Peralta Trailhead, the most popular. 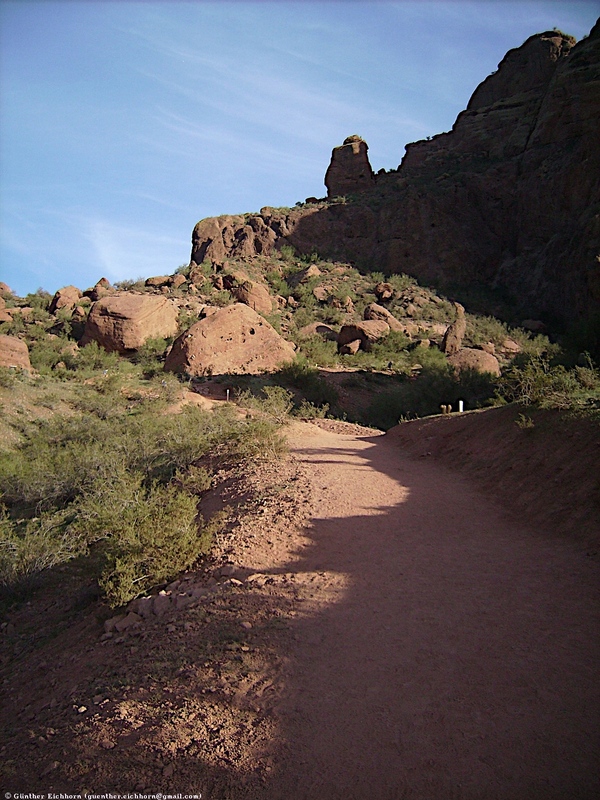 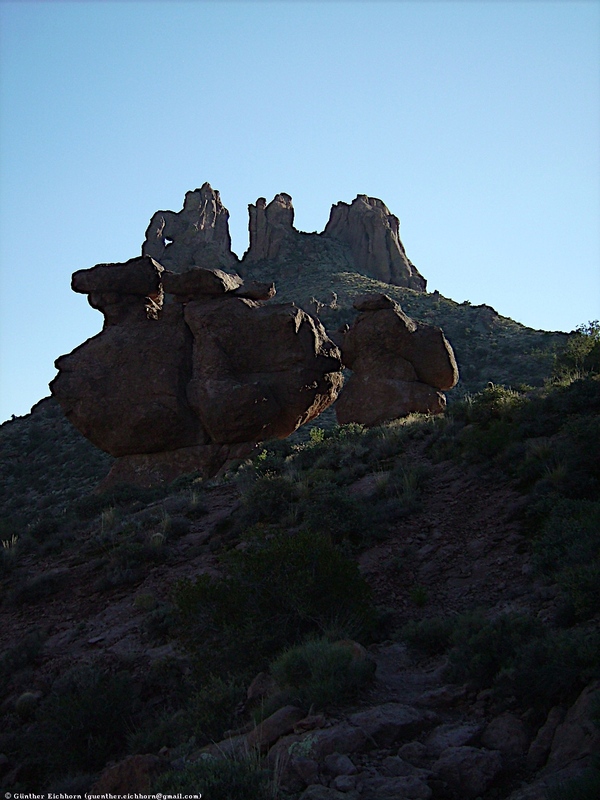 The Lost Dutchman State Park, located on the west side of Superstition Mountain, includes several short walking trails. 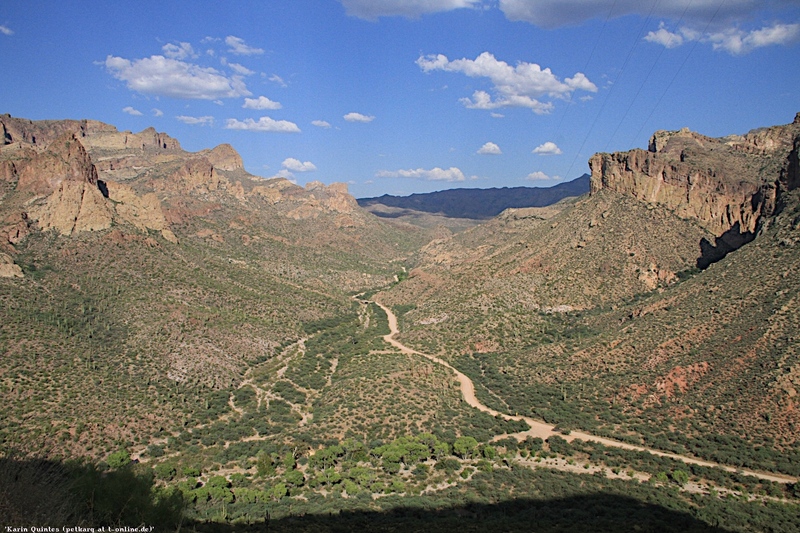 The Superstition Mountains are bounded roughly by U.S. Route 60 on the south, State Route 88 on the northwest, and State Route 188 on the northeast. 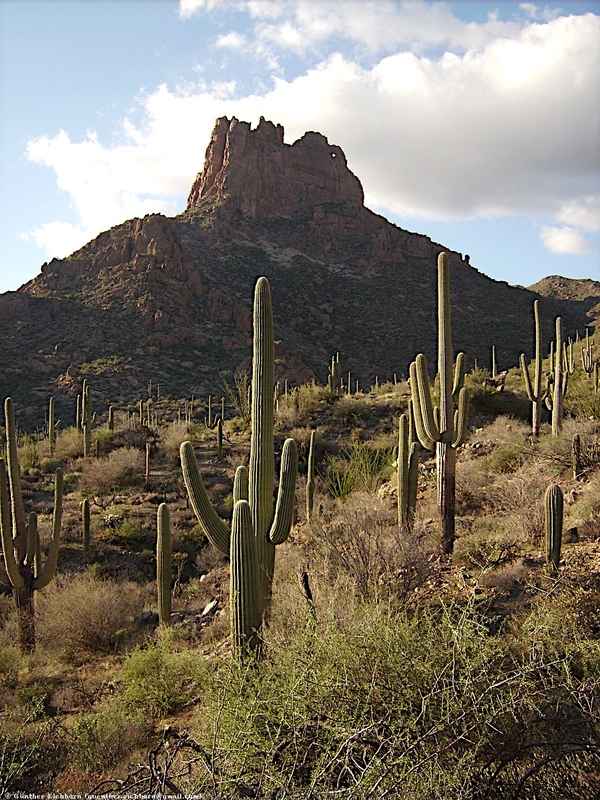 The Superstition Mountains have a maximum elevation of 6,266 ft (1,910 m). 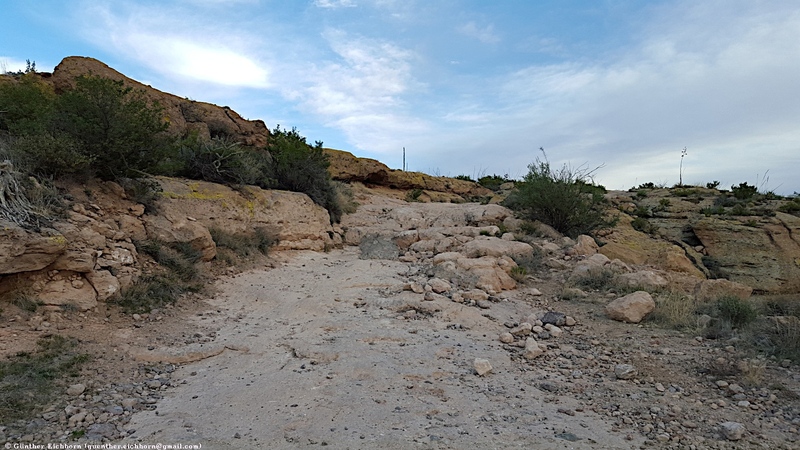 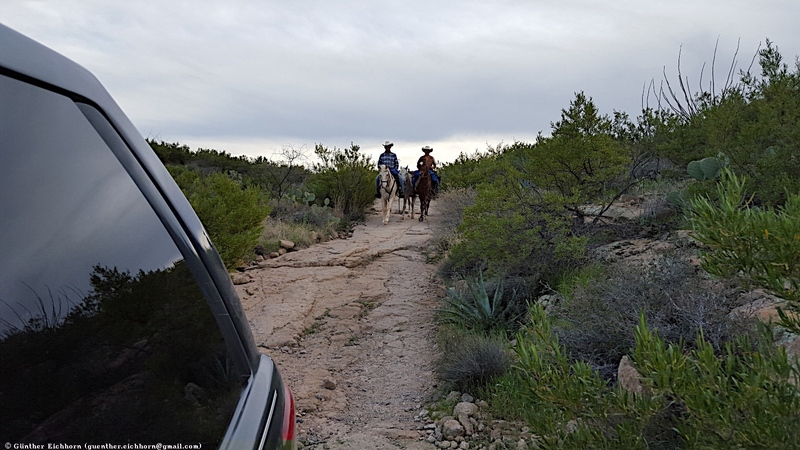 The Peralta Trail is a 10.0 km (6.2 miles) trail with a steep ascent over 3.5 km (2.2 miles) from 2,400 ft (730 m) altitude at the trail head to 3,758 ft (1,145 m) at the Fremont Saddle. 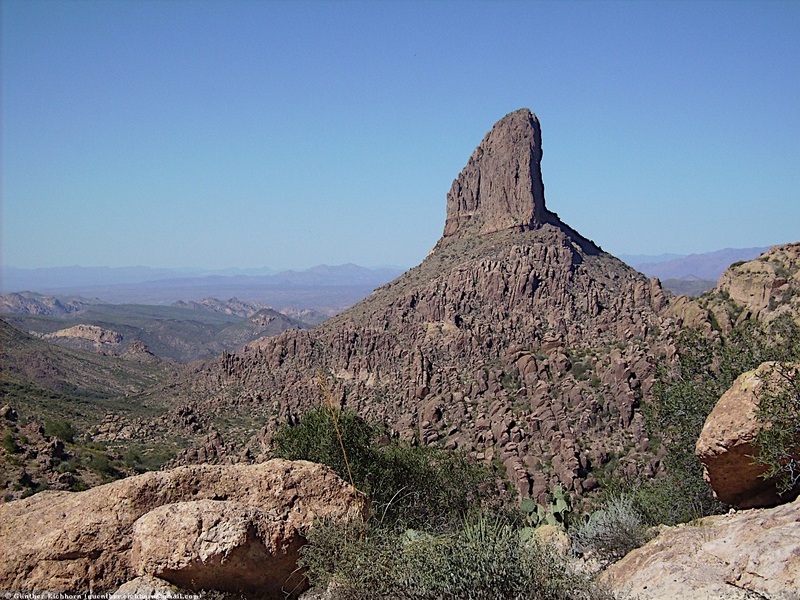 From there you descend over 6.5 km (4.0 miles) slowly alongside the Weavers Needle to 2,490 ft (759 m) at the junction with the Dutchman Trail. 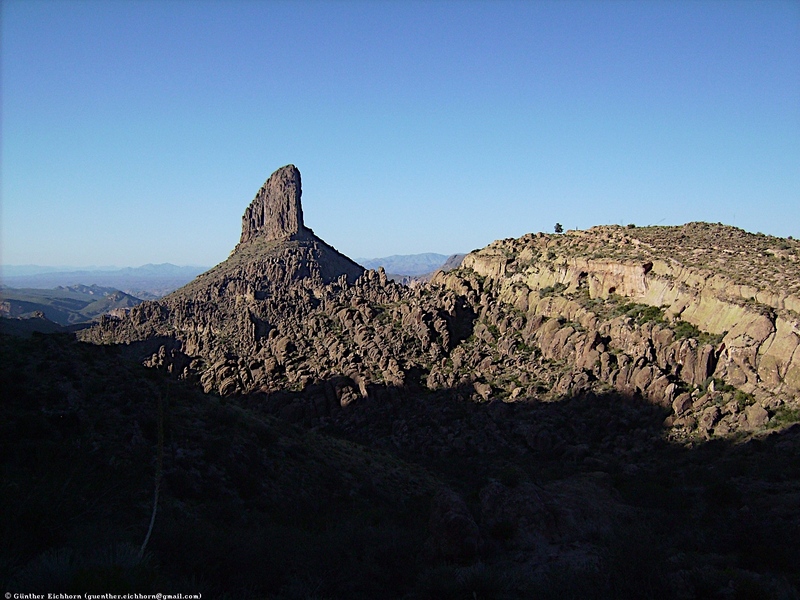 The view of the Weavers Needle from the Fremont Saddle is fantastic. 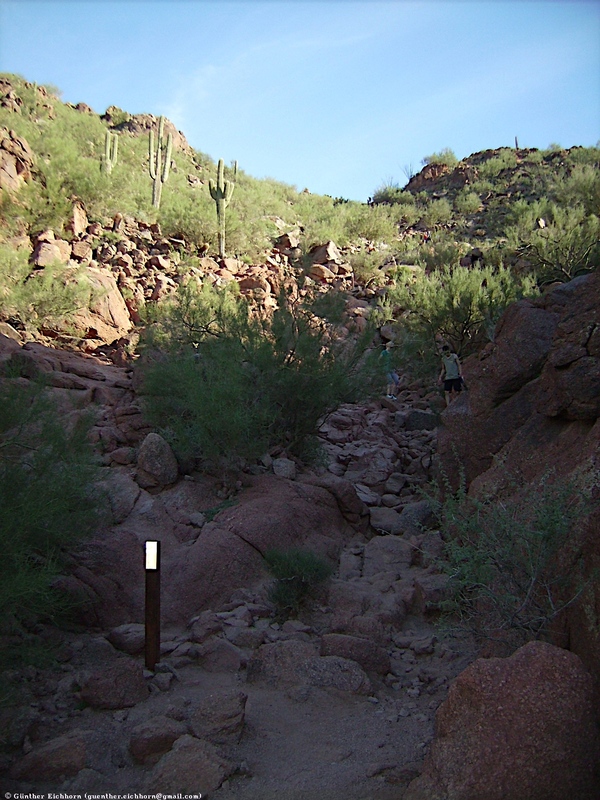 The Dutchman Trail runs 28.3 km (17.6 miles) from the First Water Trailhead (off the Apache Trail) to the Peralta Trailhead. 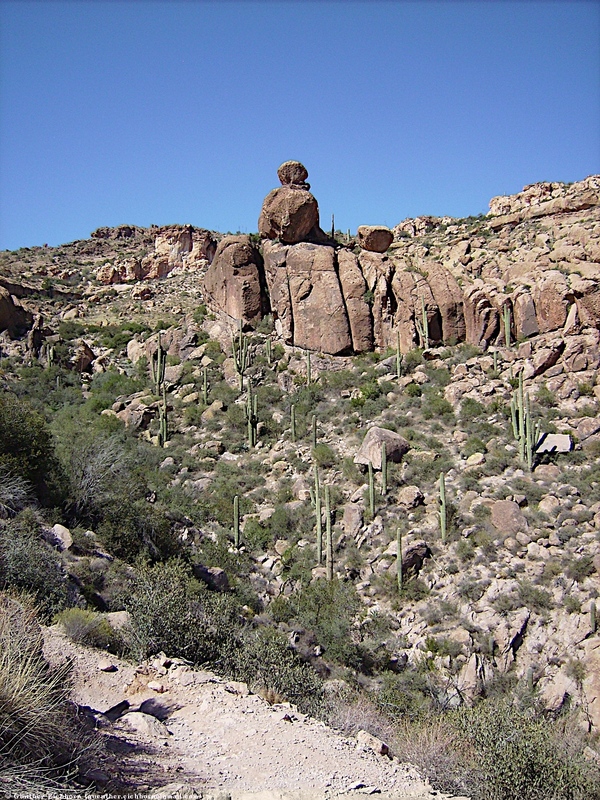 It climbs and descends about 2,000 ft (600 m), with a high point of 3,228 ft (984 m) and a low point of 2,238 ft (682 m). 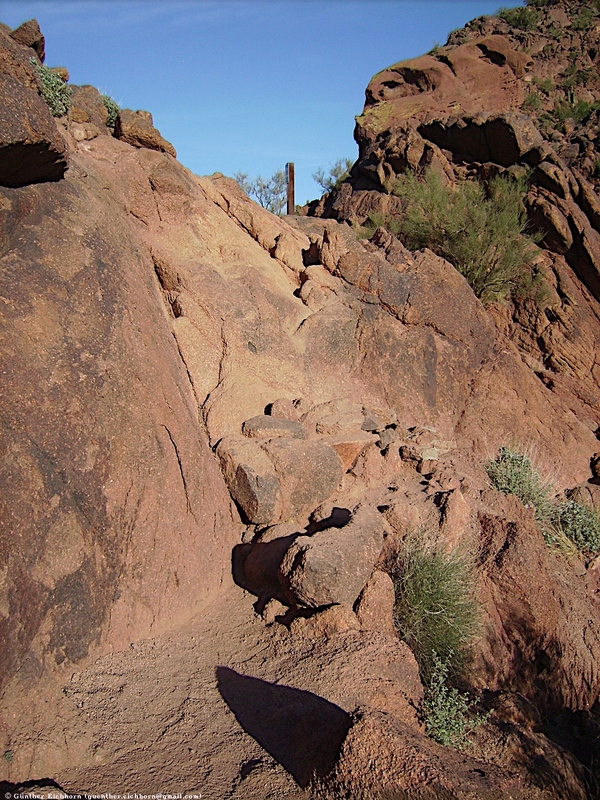 he Terrapin Train is about 5.2 km (3.2 miles) long connecting the Dutchman Trail with the Bluff Springs Trail, as part of the Weavers Needle Loop, a 20.3 km (12.6 miles) loop around the Weavers Needle. 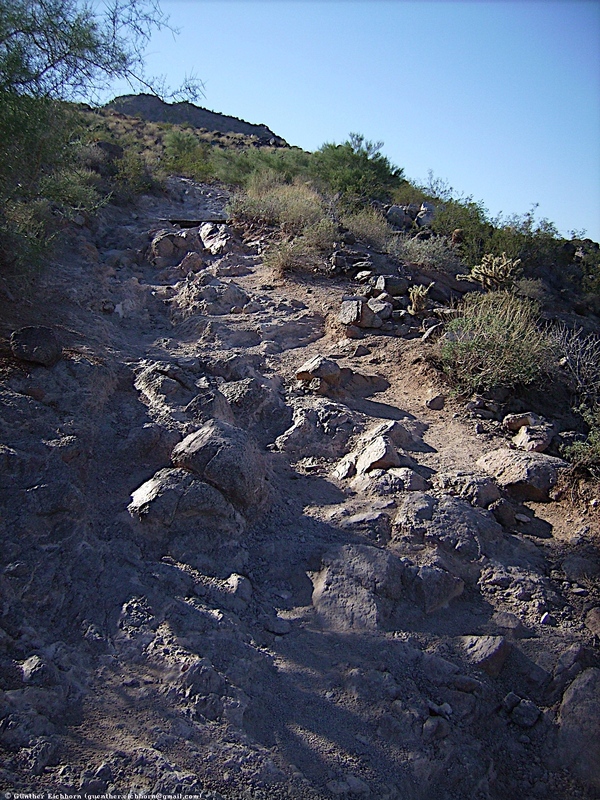 There is quite a bit of climbing and descending along the Terrapin Trail. 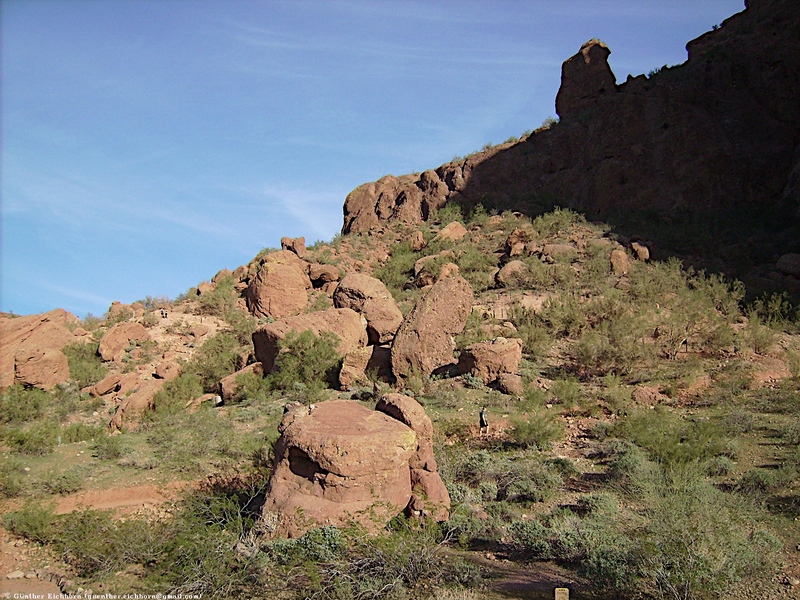 The Boulder Canyon Trail is a 12.6 km (7.8 miles) trail from Canyon Lake to the Dutchman trail, just north of Weavers Needle. 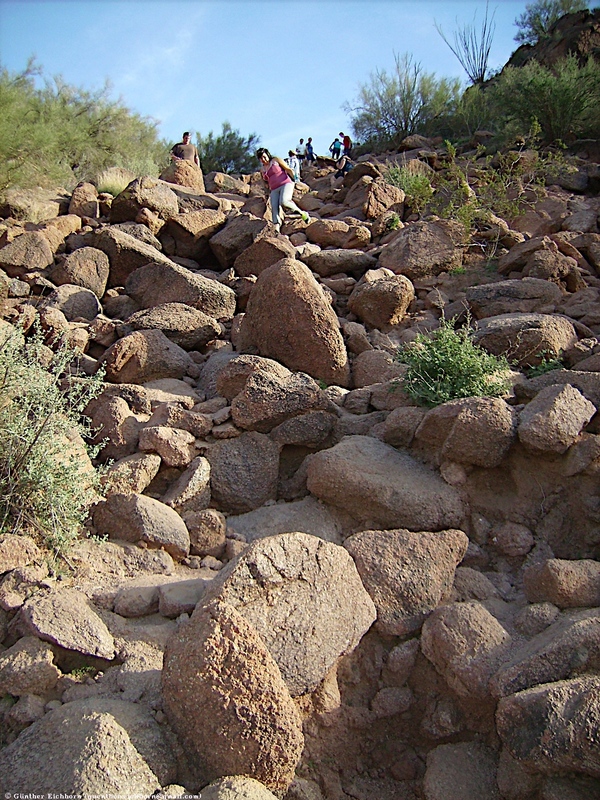 It climbs and descends about 2,000 ft (600 m), starting at 1,680 ft (512 m) at the Canyon Lake, and ending at 2,358 ft (719 m) at the Dutchman Trail. 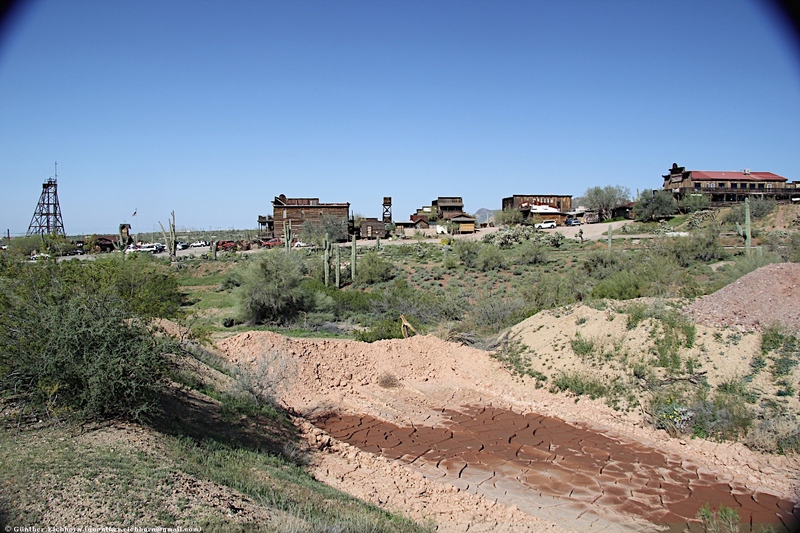 After several unsuccessful attempts to reopen the mines, the town did come to life again from 1910 on and off until 1926. 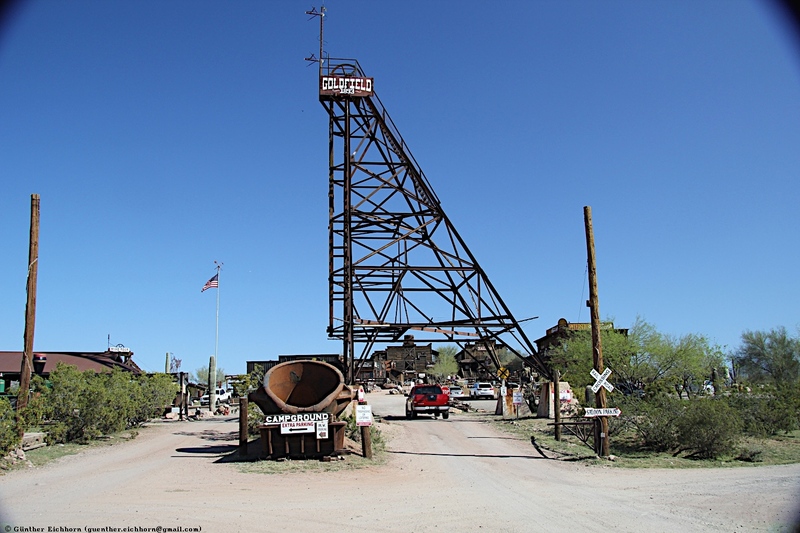 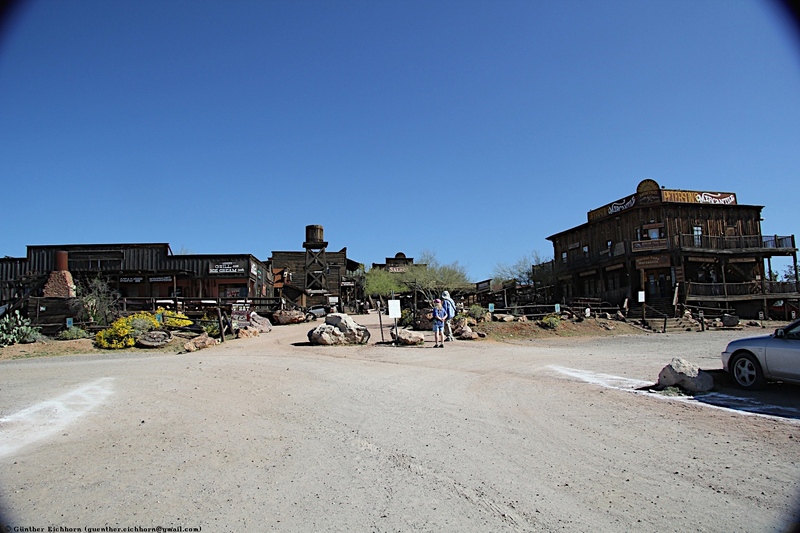 After more than 115 years, travelers from all over the world still visit this gold mining town located on the historic Apache Trail. 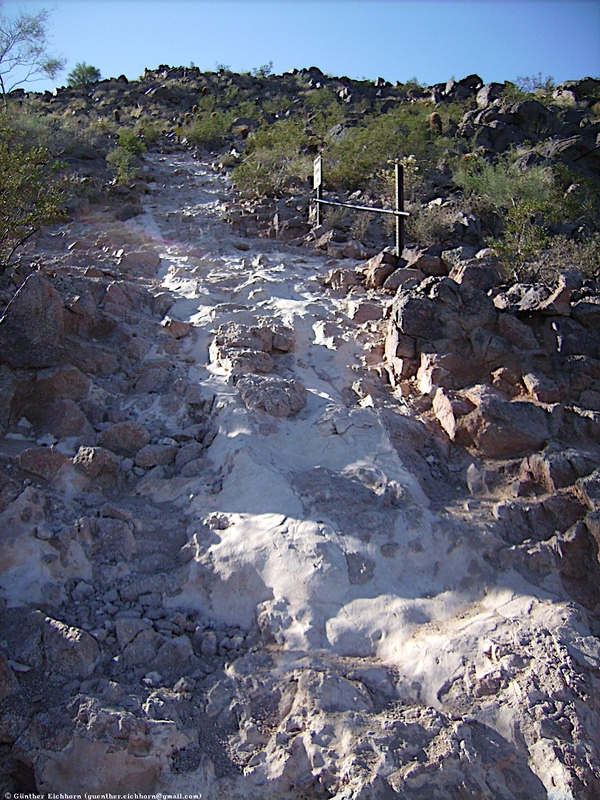 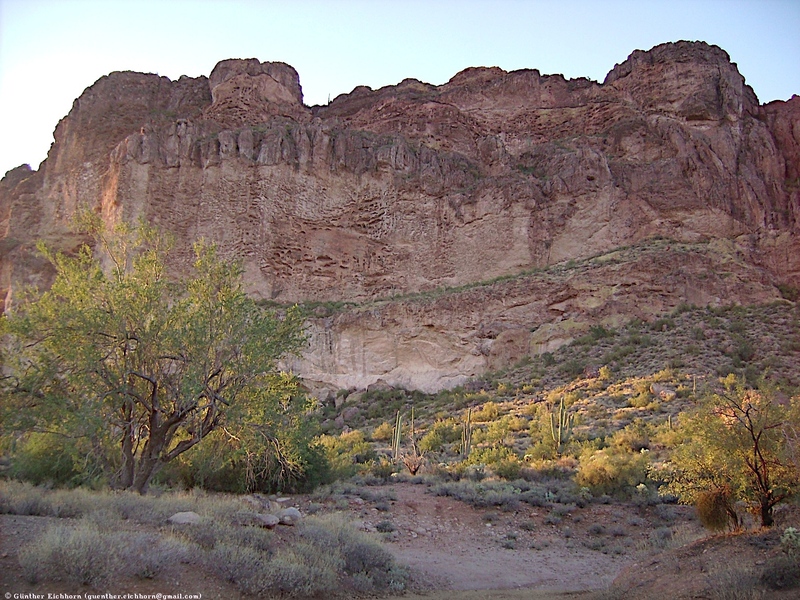 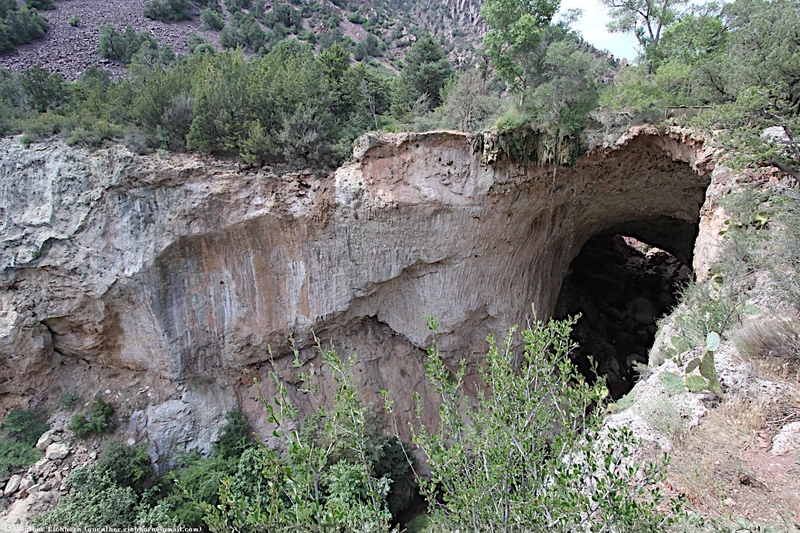 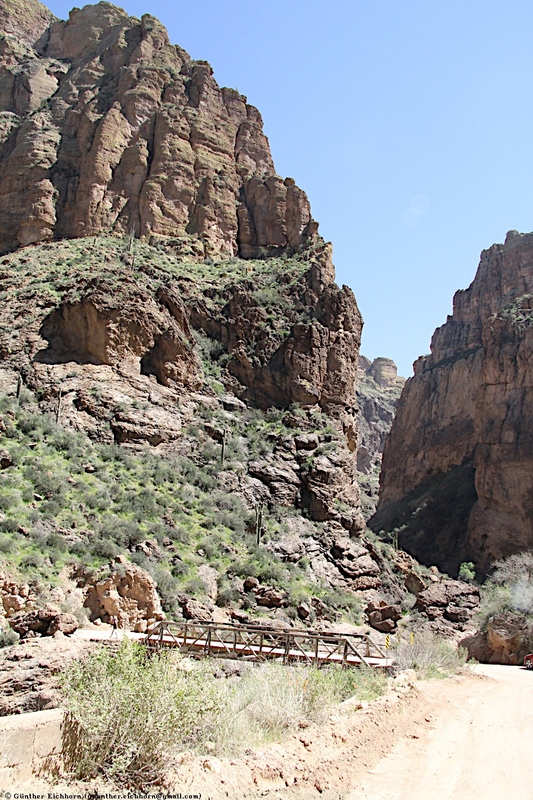 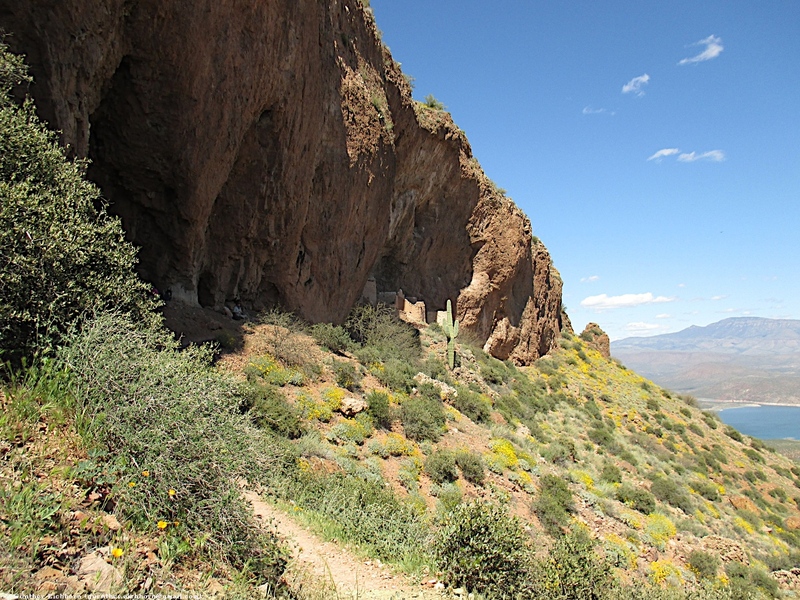 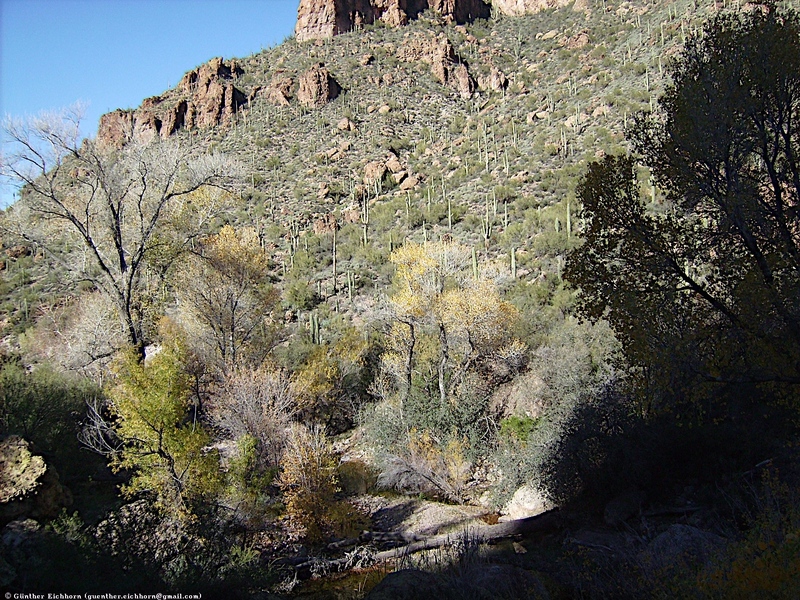 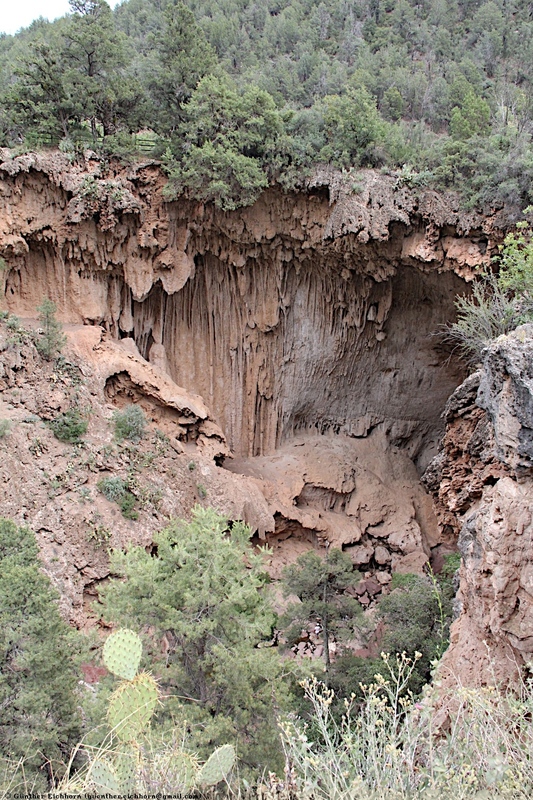 Tonto National Monument is a National Monument in the Superstition Mountains, in Gila County of central Arizona. 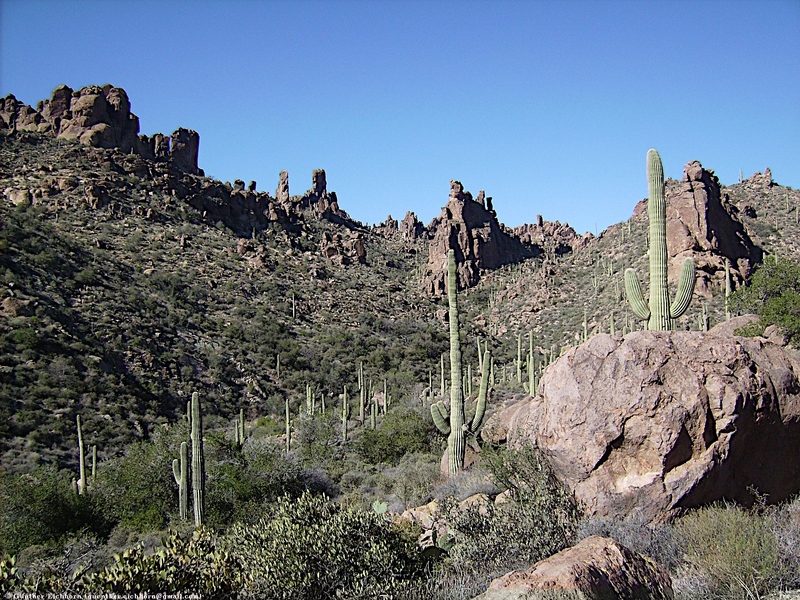 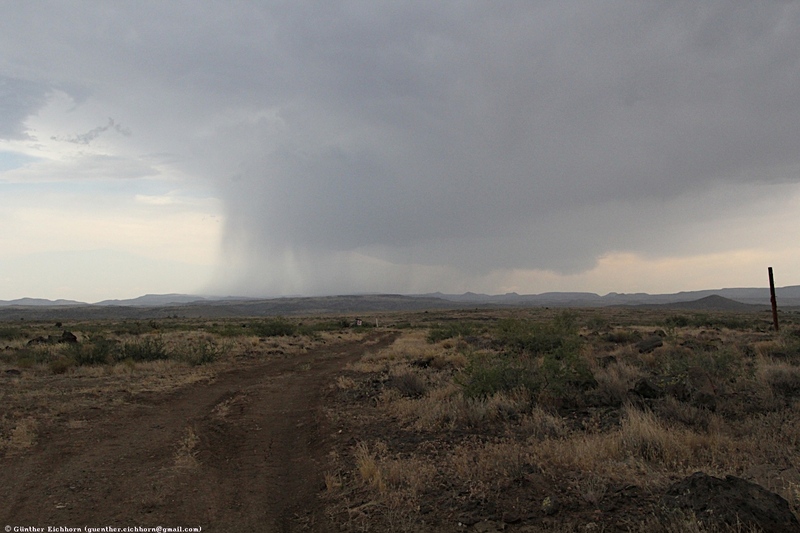 The area lies on the northeastern edge of the Sonoran Desert ecoregion, an arid habitat with annual rainfall of about (400 mm here. 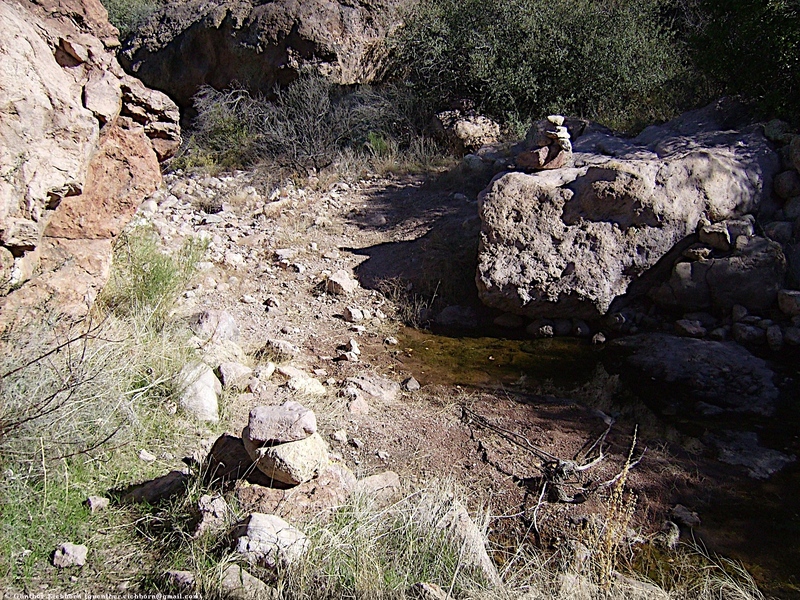 The Salt River runs through this area, providing a rare, year-round source of water. 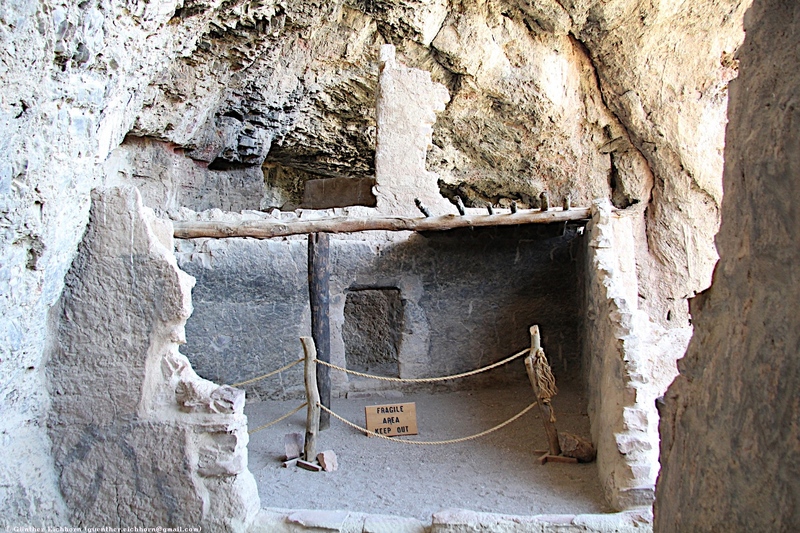 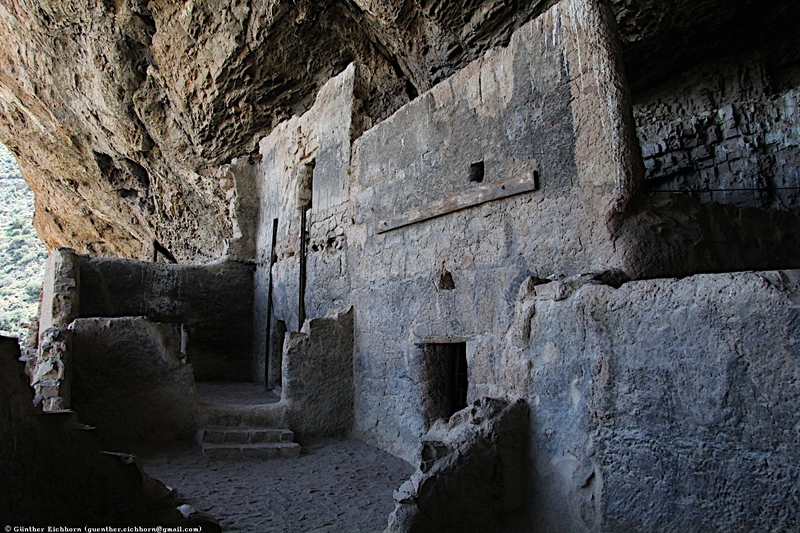 Well-preserved cliff dwellings were occupied by the Salado culture during the 13th, 14th, and early 15th centuries. 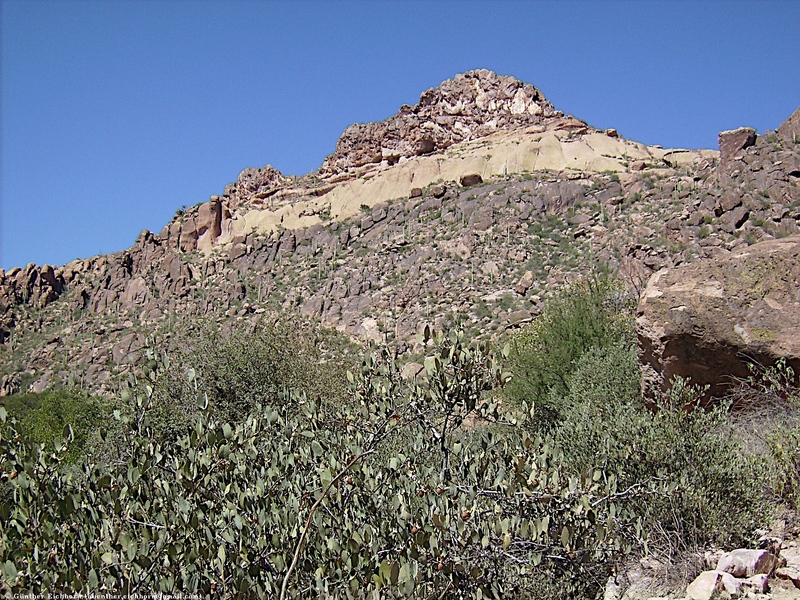 The people farmed in the Salt River Valley, and supplemented their diet by hunting and gathering native plants. 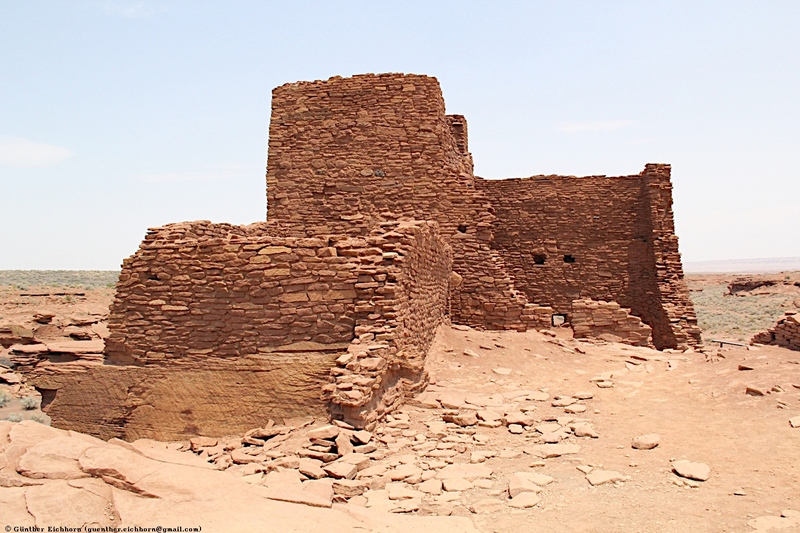 The Salado were fine craftspeople, producing some of the most flamboyant polychrome pottery and intricately woven textiles to be found in the Southwest. 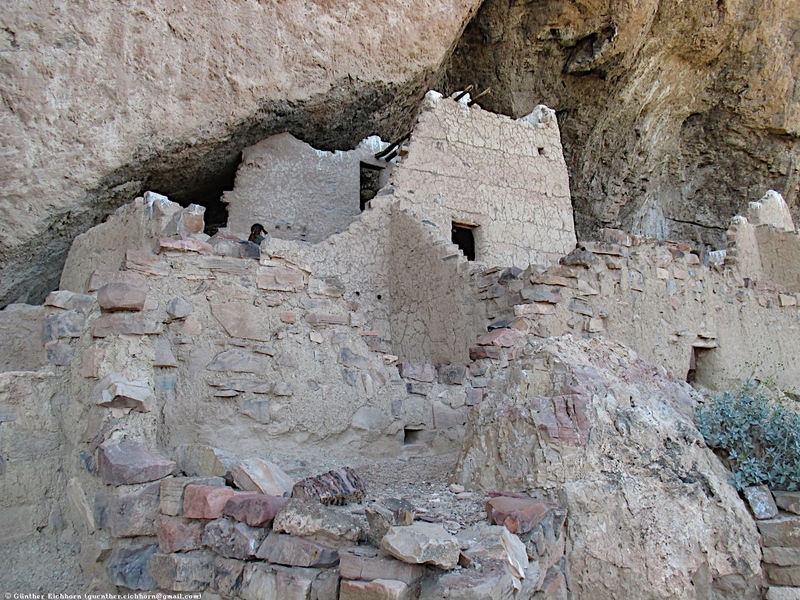 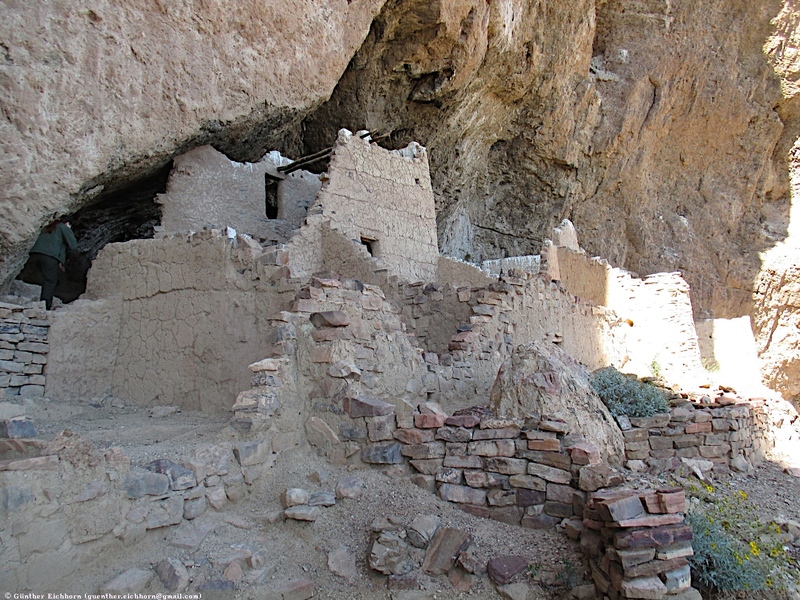 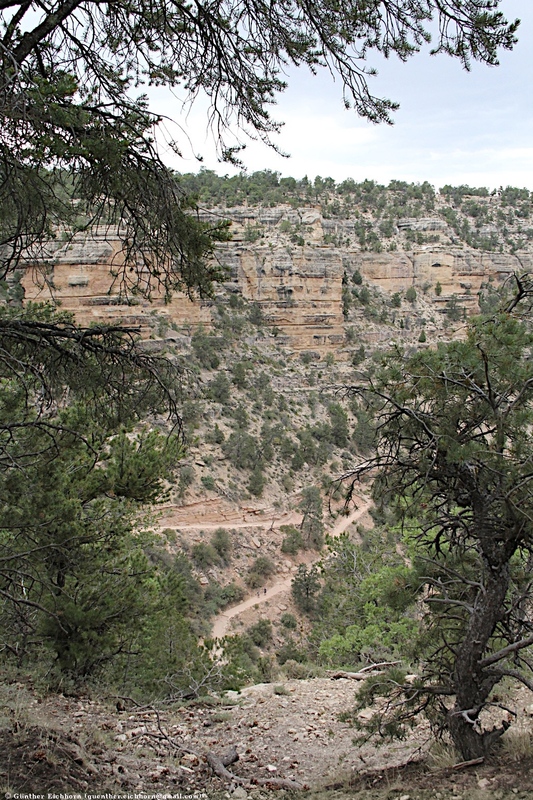 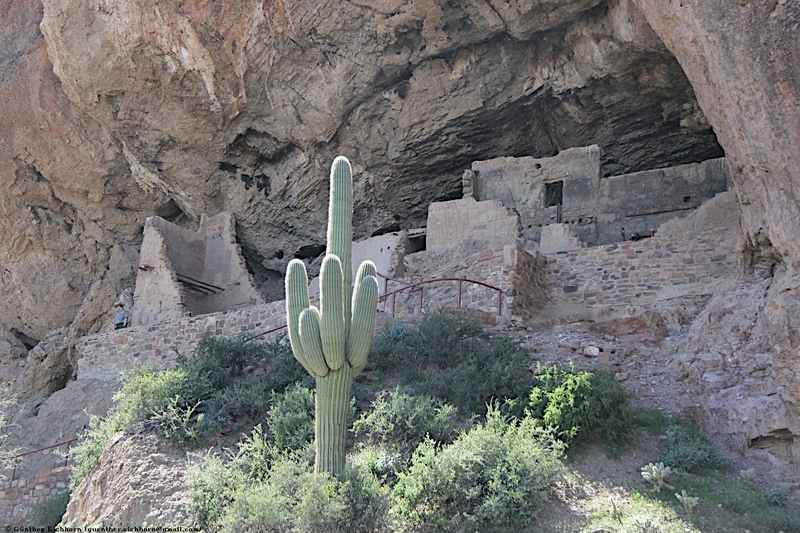 There are two pueblos, the lower cliff dwelling and the upper cliff dwelling.